LEENTJE LEA SCHOONHOED was born 18 March 1809 in Amsterdam, Holland, and died 06 August 1840 in Harlingen, Friesland, Holland. She married JOSIAOU PAIS 28 February 1833 in Harlingen, Friesland, Holland, son of RAPHAEL PAIS and LEA DE ROOIJ. He was born 20 March 1806 in Amsterdam, Holland, and died 12 June 1853 in Harlingen, Friesland, Holland. No record exists of why surname was later changed to, Hoedemacher. How are you related to Leentje Lea Schoonhoed? 1. RAPHAEL PAIS, b. 20 November 1829, Harlingen, Friesland, Holland; d. 07 June 1830, Harlingen, Friesland, Holland. 2. ELIAS PAIS, b. 06 August 1831, Harlingen, Friesland, Holland; d. 15 June 1873, Harlingen, Friesland, Holland. 3. SAARTJE PAIS, b. 06 April 1833, Harlingen, Friesland, Holland; d. 01 January 1926, Harlingen, Friesland, Holland. ELIAS PAIS was born 06 August 1831 in Harlingen, Friesland, Holland, and died 15 June 1873 in Harlingen, Friesland, Holland. He married ZWAANTJE TURKSMA 26 February 1852 in Harlingen, Friesland, Holland, daughter of MARCUS TURKSMA and HESTER DE JONG. She was born 03 April 1820 in Leeuwarden, Holland, and died 15 July 1909 in Amsterdam, Holland. 1. EVA PAIS, b. 03 December 1852, Harlingen, Friesland, Holland; d. 25 June 1934, Amsterdam, Holland. 2. JOOST PAIS, b. 31 August 1854, Harlingen, Friesland, Holland; d. 24 May 1909, Amsterdam, Holland. 3. MARCUS PAIS, b. 30 September 1856, Harlingen, Friesland, Holland; d. 28 December 1920, Amsterdam, Holland. 4. LEENTJE PAIS, b. 23 September 1858, Harlingen, Friesland, Holland; d. 16 May 1922, Amsterdam, Holland. 5. ESTHER PAIS, b. 24 July 1860, Harlingen, Friesland, Holland; d. 20 May 1894, Harlingen, Friesland, Holland. 6. BENJAMIN PAIS, b. 16 December 1862, Harlingen, Friesland, Holland; d. 14 June 1863, Harlingen, Friesland, Holland. 7. SARA PAIS, b. 31 August 1865, Harlingen, Friesland, Holland; d. 31 August 1930, Amsterdam, Holland; m. ABRAHAM HAKKER, 27 August 1890, Amsterdam, Holland; b. 07 April 1859, Amsterdam, Holland; d. 05 December 1924, Amsterdam, Holland. 8. MOZES PAIS, b. 15 July 1868, Harlingen, Friesland, Holland; d. 14 April 1937, Harlingen, Friesland, Holland. SAARTJE PAIS was born 06 April 1833 in Harlingen, Friesland, Holland, and died 01 January 1926 in Harlingen, Friesland, Holland. She married MARCUS DE HAAN 12 June 1853 in Leeuwarden, Holland, son of ANDRIES DE HAAN and KLARA DWINGER. He was born 02 April 1827 in Leeuwarden, Holland, and died 25 April 1907 in Zeeburg, Holland. 1. KLARA DE HAAN, b. 05 March 1854, Leeuwarden, Holland; d. 01 January 1936, Amsterdam, Holland. 2. JOSEPH DE HAAN, b. 28 March 1857, Leeuwarden, Holland; d. 10 January 1930, Rotterdam, Holland. 3. LEENTJE DE HAAN, b. 01 May 1859, Leeuwarden, Holland; d. 19 February 1943, Auschwitz concentration camp, Oswiecim Poland – Holocaust victim. 4. ANDRIES DE HAAN, b. 03 March 1862, Leeuwarden, Holland. 5. EVA PIA DE HAAN, b. 12 December 1864, Leeuwarden, Holland; m. DAVID GOKKES, 14 July 1886, Amsterdam, Holland; b. 20 April 1862, Blokzijl, Holland; d. 27 August 1931, Amsterdam, Holland. Occupation: Ironware Salesman, Street Vendor. 6. ELIAS DE HAAN, b. 22 March 1867, Leeuwarden, Holland; d. 08 June 1928, Leeuwarden, Holland. 7. MOZES DE HAAN, b. 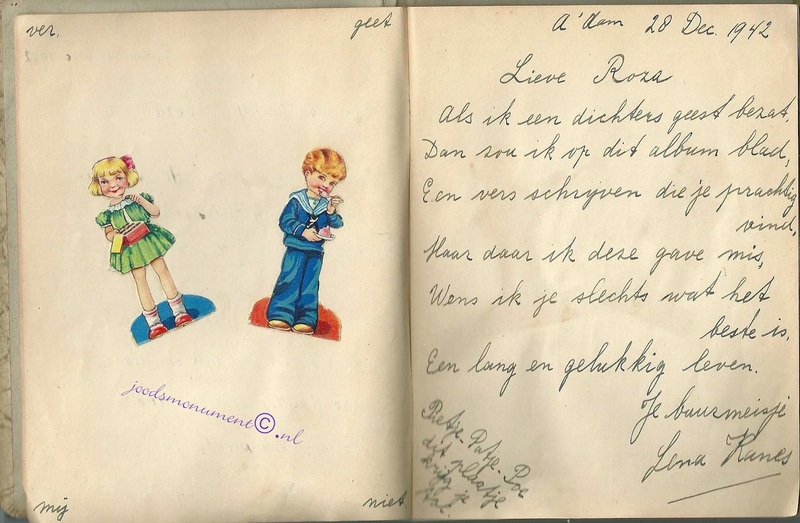 11 March 1872, Rotterdam, Holland; m. AAFKE REITSMA, 01 May 1907, Rotterdam, Holland; b. 16 April 1872, Schoonoord, Sleen, Drenthe, Holland. 8. JACOB DE HAAN, b. 15 May 1874, Rotterdam, Holland. 9. RAPHAEL DE HAAN, b. 23 May 1876, Rotterdam, Holland; d. 09 April 1943, Sobibor death camp, Poland - Holocaust victim. EVA PAIS was born 03 December 1852 in Harlingen, Friesland, Holland, and died 25 June 1934 in Amsterdam, Holland. 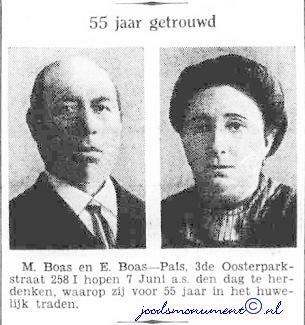 She married MOZES BOAS 07 June 1877 in Harlingen, Friesland, Holland, son of ISRAEL BOAS and LEA PAIS. He was born 13 April 1853 in Harlingen, Friesland, Holland, and died 13 September 1942 in Amsterdam, Holland. 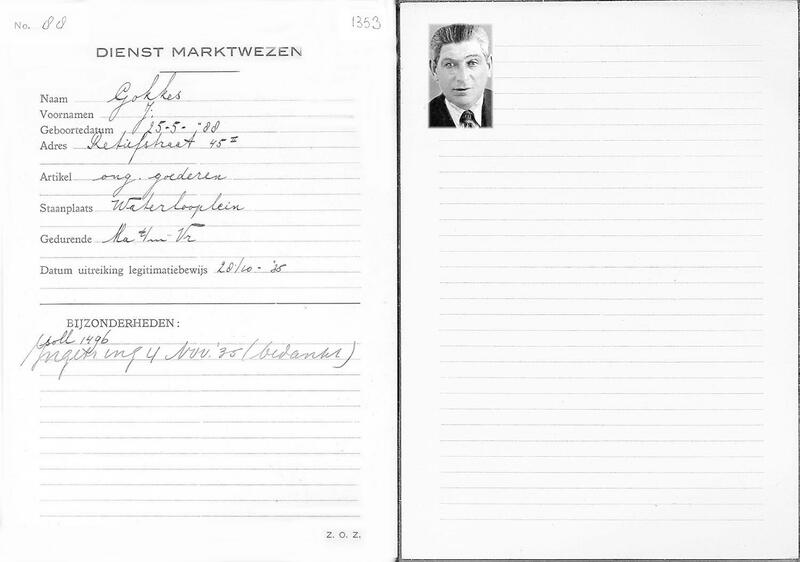 Burial: 27 June 1934, Dieman Cemetary, Amsterdam, Holland. The People newspaper for the working party June 4, 1932, evening, p.9. 1. ELIAS BOAS, b. 07 March 1878, Harlingen, Friesland, Holland; d. 22 October 1912, Amsterdam, Holland. 2. GABRIEL BOAS, b. 09 April 1879, Harlingen, Friesland, Holland; d. 19 November 1942, Auschwitz concentration camp, Poland - Holocaust victim. 3. ESTHER BOAS, b. 06 July 1881, Harlingen, Friesland, Holland; d. 10 September 1942, Auschwitz concentration camp, Poland - Holocaust victim. 4. SCHOONTJE BOAS, b. 09 March 1883, Harlingen, Friesland, Holland; d. 19 September 1942, Auschwitz concentration camp, Poland - Holocaust victim. 5. RACHEL BOAS, b. 10 February 1885, Harlingen, Friesland, Holland; d. 14 September 1942, Auschwitz concentration camp, Poland - Holocaust victim. 6. LEENTJE BOAS, b. 07 October 1887, Harlingen, Friesland, Holland; d. 08 October 1942, Auschwitz concentration camp, Poland - Holocaust victim. 7. BENJAMIN BOAS, b. 03 July 1890, Harlingen, Friesland, Holland; d. 14 September 1942, Auschwitz concentration camp, Poland - Holocaust victim. 8. SARA BOAS, b. 16 February 1892, Harlingen, Friesland, Holland; d. 25 February 1934, Amsterdam, Holland. 9. ESTELLA BOAS, b. 16 May 1894, Harlingen, Friesland, Holland; d. 02 April 1943, Sobibor death camp, Poland - Holocaust victim. 10. ARON BOAS, b. 08 February 1898, Harlingen, Friesland, Holland; d. 02 July 1943, Sobibor death camp, Poland - Holocaust victim. JOOST PAIS was born 31 August 1854 in Harlingen, Friesland, Holland, and died 24 May 1909 in Amsterdam, Holland. He married (1) PIETJE KRAMER. She was born 13 April 1852 in Harlingen, Friesland, Holland, and died 24 August 1882 in Harlingen, Friesland, Holland. He married (2) BETJE ZWAAF 26 October 1887 in Amsterdam, Holland, daughter of ISRAEL ZWAAF and KLARA VISKOPER. She was born 12 March 1856 in Amsterdam, Holland, and died 29 November 1934 in Amsterdam, Holland. 1. SCHOONTJE PAIS, b. 04 May 1888, Amsterdam, Holland; d. 22 October 1942, Auschwitz concentration camp, Poland - Holocaust victim. 2. ISRAEL PAIS, b. 30 January 1890, Amsterdam, Holland; d. 03 December 1942, Auschwitz concentration camp, Poland - Holocaust victim. 3. EVA PAIS, b. 06 May 1891, Amsterdam, Holland; d. 28 May 1943, Sobibor death camp, Poland - Holocaust victim. 4. ELIAS PAIS, b. 29 November 1894, Amsterdam, Holland; d. 31 March 1944, Central Europe, Municipality unknown - Holocaust victim. MARCUS PAIS was born 30 September 1856 in Harlingen, Friesland, Holland, and died 28 December 1920 in Amsterdam, Holland. He married FROUKJE BIERSCHENK 28 June 1882 in Amsterdam, Holland, daughter of SALOMON BIERSCHENK and MARTHA TURKSMA. She was born 27 November 1857 in Leeuwarden, Holland, and died 22 April 1942 in Amsterdam, Holland. Resided: Nursing home, Amsteldijk 87 hs, Amsterdam, Holland. 1. SOLOMON PAIS, b. 09 November 1883, Amsterdam, Holland; d. 03 December 1942, Auschwitz concentration camp, Oswiecim Poland – Holocaust victim. 2. ELIAS PAIS, b. 25 January 1886, Amsterdam, Holland; d. 07 December 1942, Auschwitz concentration camp, Poland - Holocaust victim. 3. MARTHA PAIS, b. 21 February 1888, Amsterdam, Holland; d. 02 July 1943, Sobibor death camp, Poland - Holocaust victim. 4. JOSEPH PAIS, b. 22 February 1890, Amsterdam, Holland; d. 04 June 1943, Sobibor death camp, Poland - Holocaust victim. 5. LOUIS PAIS, b. 09 April 1893, Amsterdam, Holland; d. 12 March 1915, Apeldoorn, Gelderland, Holland. 6. SCHOONTJE PAIS, b. 14 August 1895, Amsterdam, Holland; d. 02 July 1943, Sobibor death camp, Poland - Holocaust victim. 7. HESTER PAIS, b. 20 November 1900, Amsterdam, Holland; d. 13 May 1928, Amsterdam, Holland. 8. EVA PAIS, b. 06 February 1898, Amsterdam, Holland; d. 14 September 1942, Auschwitz concentration camp, Oswiecim Poland – Holocaust victim. LEENTJE PAIS was born 23 September 1858 in Harlingen, Friesland, Holland, and died 16 May 1922 in Amsterdam, Holland. She married SALOMON VELLEMAN 25 April 1883 in Amsterdam, Holland, son of JACOB VELLEMAN and ZWAANTJE DE VRIES. He was born 21 February 1854 in Leeuwarden, Holland, and died 12 April 1927 in Amsterdam, Holland. 1. SCHOONTJE VELLEMAN, b. 02 February 1884, Amsterdam, Holland; d. 28 May 1943, Sobibor death camp, Poland - Holocaust victim. 2. ESTHER VELLEMAN, b. 28 October 1885, Amsterdam, Holland; d. 16 August 1942, Auschwitz concentration camp, Poland - Holocaust victim. 3. HANNA VELLEMAN, b. 13 June 1887, Amsterdam, Holland; d. 17 October 1926, Amsterdam, Holland. 4. ELIAS VELLEMAN, b. 01 April 1889, Amsterdam, Holland; d. 19 November 1938, Amsterdam, Holland. 5. JOSEPH VELLEMAN, b. 21 August 1891, Amsterdam, Holland; d. 25 January 1943, Auschwitz concentration camp - Holocaust victim. 6. EVA VELLEMAN, b. 02 September 1893, Zaandam, Holland; d. 28 January 1944, Auschwitz concentration camp - Holocaust victim. 7. DINA VELLEMAN, b. 24 October 1895, Amsterdam, Holland; d. 22 October 1943, Auschwitz concentration camp, Poland - Holocaust victim. 8. JACOB VELLEMAN, b. 13 December 1897, Amsterdam, Holland; d. 31 March 1944, Auschwitz concentration camp - Holocaust victim. 9. JOHANNA VELLEMAN, b. 03 January 1900, Amsterdam, Holland; d. 28 January 1944, Auschwitz concentration camp - Holocaust victim. 10. MICHEL VELLEMAN, b. 04 January 1903, Amsterdam, Holland; d. 31 March 1944, Auschwitz concentration camp - Holocaust victim. 11. BERTA VELLEMAN, b. 03 June 1905, Amsterdam, Holland; d. 28 May 1943, Sobibor death camp, Poland - Holocaust victim. MOZES PAIS was born 15 July 1868 in Harlingen, Friesland, Holland, and died 14 April 1937 in Harlingen, Friesland, Holland. He married GRIETJE KAT 11 June 1894 in Harlingen, Friesland, Holland, daughter of JOSEPH KAT and DUIFJE RUBENS. She was born 02 June 1872 in Harlingen, Friesland, Holland, and died 26 March 1944 in Auschwitz concentration camp, Poland - Holocaust victim. 1. SCHOONTJE PAIS, b. 12 February 1895, Amsterdam, Holland; d. 15 December 1942, Auschwitz concentration camp, Poland - Holocaust victim. 2. JOSEPH PAIS, b. 10 February 1898, Harlingen, Friesland, Holland; d. 30 September 1942, Auschwitz concentration camp, Poland - Holocaust victim. 3. DUIFJE PAIS, b. 24 March 1901, Harlingen, Friesland, Holland; d. 09 April 1943, Sobibor death camp, Poland - Holocaust victim. 4. ELIAS PAIS, b. 16 April 1904, Harlingen, Friesland, Holland; d. 21 April 1977, Amsterdam, Holland. 5. JOOST PAIS, b. 30 June 1907, Harlingen, Friesland, Holland; d. 30 December 1907, Harlingen, Friesland, Holland. KLARA DE HAAN was born 05 March 1854 in Leeuwarden, Holland. She married JACOB HARTOG 15 November 1871 in Rotterdam, Holland, son of SALOMON HARTOG and JUDIKJE SCHOONHOED. He was born 27 January 1849 in Zutphen, Holland. 1. SAARTJE HARTOG, b. 29 May 1872, Rotterdam, Holland; d. 29 September 1923, Amsterdam, Holland. 2. SALOMON HARTOG, b. 22 July 1873, Rotterdam, Holland; d. 27 March 1941, Amsterdam, Holland. Resided: Tugelaweg 126 I, Amsterdam, Holland. 3. JUDIKJE HARTOG, b. 08 July 1875, Rotterdam, Holland; d. 13 March 1899, Amsterdam, Holland. 4. MARCUS HARTOG, b. 28 December 1877, Rotterdam, Holland; d. 15 January 1931, Amsterdam, Holland. 5. ANDRIES HARTOG, b. 26 April 1880, Rotterdam, Holland; d. 14 May 1883, Rotterdam, Holland. 6. JOZEF HARTOG, b. 03 August 1882, Rotterdam, Holland. 7. MIETJE HARTOG, b. 02 January 1885, Rotterdam, Holland; d. 16 September 1959, Amsterdam, Holland. 8. HELENA HARTOG, b. 02 October 1886, Amsterdam, Holland; d. 14 September 1942, Auschwitz concentration camp, Oswiecim Poland – Holocaust victim. 9. ELIAS HARTOG, b. 09 April 1889, Amsterdam, Holland; d. 02 November 1942, Auschwitz concentration camp, Oswiecim Poland – Holocaust victim. 10. EVA HARTOG, b. 03 April 1890, Amsterdam, Holland. 11. ANDRIES HARTOG, b. 19 September 1892, Amsterdam, Holland; d. 10 March 1921, Amsterdam, Holland. 12. BETJE HARTOG, b. 03 October 1895, Amsterdam, Holland; d. 13 March 1943, Sobibor death camp, Poland - Holocaust victim. JOSEPH DE HAAN was born 28 March 1857 in Leeuwarden, Holland, and died 10 January 1930 in Rotterdam, Holland. He married (1) FRANCINA VAN DER SLUIJS 08 June 1881 in Rotterdam, Holland, daughter of MOZES SLUIJS and ROSA LORJE. She was born 23 November 1859 in Rotterdam, Holland. He married (2) SOPHIA SLAGER 15 February 1917 in Amsterdam, Holland, daughter of MARCUS SLAGER and SAARTJE METSCHER. She was born 23 March 1875 in Steenwijk, Steenwijkerland, Overijssel, Holland, and died 26 March 1944 in Auschwitz concentration camp - Holocaust victim. 1. MARCUS DE HAAN, b. 04 November 1881, Rotterdam, Holland; d. 14 May 1943, Sobibor death camp, Poland - Holocaust victim. 2. MOZES DE HAAN, b. 18 November 1883, Rotterdam, Holland; d. 25 March 1932, Rotterdam, Holland. 3. MICHEL DE HAAN, b. 11 August 1887, Rotterdam, Holland; d. 28 September 1942, Auschwitz concentration camp - Holocaust victim. 4. ANDRIES DE HAAN, b. 07 March 1890, Rotterdam, Holland; d. 28 May 1943, Sobibor death camp, Poland - Holocaust victim. 5. LOUIS DE HAAN, b. 04 September 1892, Rotterdam, Holland; d. 17 March 1894, Rotterdam, Holland. 6. ELIAS DE HAAN, b. 06 May 1895, Rotterdam, Holland; d. 28 February 1943, Auschwitz concentration camp - Holocaust victim. 7. EVA DE HAAN, b. 20 September 1897, Rotterdam, Holland; d. 28 May 1943, Sobibor death camp, Poland - Holocaust victim. 8. ROSINA DE HAAN, b. 27 November 1899, Rotterdam, Holland. 9. SAARTJE DE HAAN, b. 07 February 1903, Rotterdam, Holland; d. 30 September 1942, Auschwitz concentration camp - Holocaust victim. 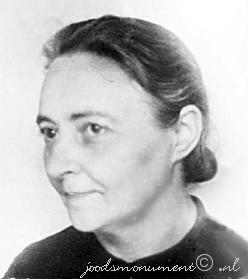 LEENTJE DE HAAN was born 01 May 1859 in Leeuwarden, Holland, and died 19 February 1943 in Auschwitz concentration camp, Oswiecim Poland – Holocaust victim. She married MACHIEL DE VRIES 25 July 1883 in Amsterdam, Holland, son of MOZES DE VRIES and BORDINA VAN KLEEF. He was born 27 March 1857 in Leeuwarden, Holland, and died 22 June 1911 in Amsterdam, Holland. Guest house 'Verdooner', Weesperzijde 141 huis, Amsterdam, Holland. 1. BARDINA DE VRIES, b. 28 December 1883, Amsterdam, Holland; d. 30 April 1943, Sobibor death camp, Poland - Holocaust victim. 2. SARA DE VRIES, b. 17 November 1885, Amsterdam, Holland; d. 12 February 1943, Auschwitz concentration camp - Holocaust victim. 3. JOHANNA DE VRIES, b. 06 February 1888, Amsterdam, Holland; d. 05 February 1943, Auschwitz concentration camp - Holocaust victim. 4. KLARA DE VRIES, b. 29 October 1889, Purmerend, Holland; d. 28 May 1943, Sobibor death camp, Poland - Holocaust victim. 5. MOZES DE VRIES, b. 16 November 1891, Purmerend, Holland; d. 31 March 1944, Central Europe, Municipality unknown - Holocaust victim. 6. EVA DE VRIES, b. 13 July 1893, Amsterdam, Holland; d. 07 September 1942, Auschwitz concentration camp, Poland - Holocaust victim. 7. MARCUS DE VRIES, b. 07 October 1895, Amsterdam, Holland; d. 31 October 1943, Schoppinitz, Katowice, Poland - Holocaust victim. 8. DINA DE VRIES, b. 26 August 1899, Amsterdam, Holland; d. 02 July 1943, Sobibor death camp, Poland - Holocaust victim. ELIAS DE HAAN was born 22 March 1867 in Leeuwarden, Holland, and died 08 June 1928 in Leeuwarden, Holland. He married EVA SLAGER 13 March 1901 in Amsterdam, Holland, daughter of DAVID SLAGER and ROOSJE KRANSBERG. She was born 03 August 1861 in Kampen, Overijssel, Holland, and died 22 January 1940 in Amsterdam, Holland. 1. ROOSJE DE HAAN, b. 23 February 1897, Amsterdam, Holland; d. 10 September 1943, Auschwitz concentration camp, Oswiecim Poland – Holocaust victim. 2. MARCUS DE HAAN, b. 19 August 1904, Amsterdam, Holland; d. 01 July 1943, Sobibor death camp, Poland - Holocaust victim. 3. SIMON DE HAAN, m. BETJE MOSCOU, 25 May 1916, Amsterdam, Holland; b. 26 December 1890, Amsterdam, Holland; d. 03 September 1943, Auschwitz concentration camp, Poland - Holocaust victim. Betje Moscou was stopped and detained on the Stadionkade in Amsterdam by two members of the Kolonne Henneicke on 11 August 1943. She was carrying a false identity card. Betje Moscou was deported via the Hollandsche Schouwburg and Westerbork transit camp and perished in Auschwitz on 03 September 1943. RAPHAEL DE HAAN was born 23 May 1876 in Rotterdam, Holland, and died 09 April 1943 in Sobibor death camp, Poland - Holocaust victim. He married (1) JOHANNA MARGARETHA VAN DEN NULFT 25 October 1899 in Amsterdam, Holland, daughter of CARL DEN NULFT and MARGARETHA SCHMALTZ. She died 22 December 1926 in Amsterdam, Holland. 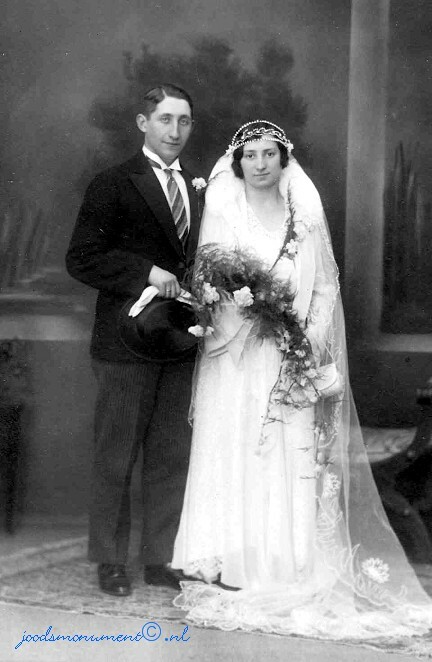 He married (2) LEENTJE KANES 03 March 1927 in Zandvoort, Holland, daughter of ISRAEL KANES and SARA ITALIANER. She was born 01 December 1888 in Amsterdam, Holland, and died 09 April 1943 in Sobibor death camp, Poland - Holocaust victim. Resided with husband, May 1940: Spreeuwenplein 45 I, Amsterdam. Holland. Resided with family, January 1943: Commelinstraat 55 huis, Amsterdam, Holland. 1. MARIUS DE HAAN, b. 25 December 1927, Amsterdam, Holland; d. 09 April 1943, Sobibor death camp, Poland - Holocaust victim. ELIAS BOAS was born 07 March 1878 in Harlingen, Friesland, Holland, and died 22 October 1912 in Amsterdam, Holland. He married ELISABETH ENGELANDER 24 June 1908 in Amsterdam, Holland, daughter of SALOMON ENGELANDER and NAATJE ROOS. She was born 09 February 1869 in Amsterdam, Holland, and died 21 September 1942 in Auschwitz concentration camp, Poland - Holocaust victim. 1. ANNA BOAS, b. 12 April 1909, Amsterdam, Holland; d. 16 July 1943, Sobibor death camp, Poland - Holocaust victim. 2. EVA BOAS, b. 07 June 1910, Amsterdam, Holland; d. 09 April 1943, Sobibor death camp, Poland - Holocaust victim. GABRIEL BOAS was born 09 April 1879 in Harlingen, Friesland, Holland, and died 19 November 1942 in Auschwitz concentration camp, Poland - Holocaust victim. He married DINA PAIS 15 June 1908 in Harlingen, Friesland, Holland, daughter of JOSEPH PAIS and SARA SPIJER. She was born 24 February 1882 in Harlingen, Friesland, Holland, and died 19 November 1942 in Auschwitz concentration camp, Poland - Holocaust victim. 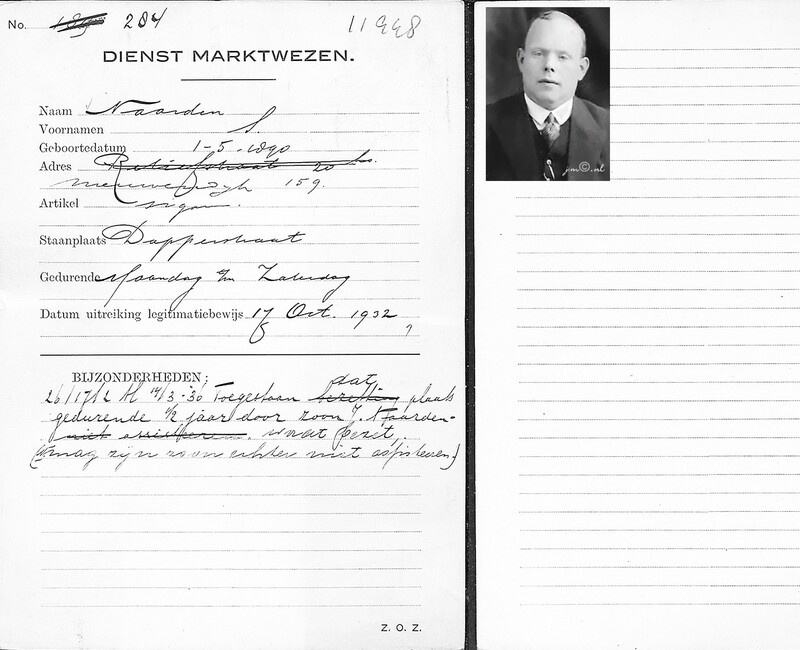 Resided with family, 1 March 1942: Kleine Bredeplaats 16, Harlingen, Holland. Room: scales, barometer, mat (2), runner, mat (4), bag (2), coat, ladder, drying rack, coat hooks with wall hanging, ironing board, lamp, umbrella stand, cupboard, double bed with bedding, office chair, desk, desk light, suitcase (5), cane suitcase (5), flower table, mirror, clock, lamp, mantelpiece runner, carpet, linoleum, wall plate (3), table, laundry, drape (3), clothing, lace curtain (4), mat (10), table with cloth, chair (6), armchair (2), reclining chair, money box, safe, small table, clock, mirror, stove with plate, cupboard, flower table, lace curtain and drape (2), iron bed, bed with bedding, sofa cover, newspaper holder, table lamp, wall plate (3), carpet, mat (4), flowerpot (8), linoleum, cushion (2), chair (4), coat stand, cooker, slop bucket, drying rack, table (2), pottery, kitchenware, pot, alarm clock, mat (4), coffee grinder, cutlery, glassware, tablecloth (4), runner, table lamp, lamp, cabinet, bed with bedding, linen, electric cooker, lamp, mat (4), alarm clock, drape (2), loudspeaker, vase (3), wall plate (3), chair (4), mirror,newspaper holder, table, mat, linoleum, mat (3), desk, chair (2), clock, bed with bedding (2), mirror, table lamp, round table, chair (6), lower table, vase, table (2), mantelpiece runner, book case, carpet, mat, linoleum, bucket, dressing table with things (2), coconut runner, paraffin lamp, lace curtain (6), clock, mirror, armchair, linoleum, cupboard, chair (4), bucket, kitchenware, pottery, glassware, table lamp (2), bucket, suitcase, stove plate, curtain, linoleum, carpet, cutlery, wall plate (4), runner with rods, bucket (3), gas ring, chair, ladder, cooking pot, paraffin stove, hand cart (4), cales with weights (2), ladder (2), sledge, bicycle without tyres, mirror. 1. SARA BOAS, b. 06 September 1909, Harlingen, Friesland, Holland; d. 11 June 1943, Sobibor death camp, Poland - Holocaust victim. 2. JOZEPH BOAS, b. 08 September 1922, Harlingen, Friesland, Holland; d. 30 June 1943, Ottmuth concentration camp, Poland - Holocaust victim. ESTHER BOAS was born 06 July 1881 in Harlingen, Friesland, Holland, and died 10 September 1942 in Auschwitz concentration camp, Poland - Holocaust victim. She married (1) ISAAC GROOTKERK. He was born 05 January 1865 in Amsterdam, Holland, and died 10 September 1942 in Auschwitz concentration camp, Poland - Holocaust victim. She married (2) ISAAC MAIJ 14 February 1905 in Zaandam, Holland, son of ELKAN MAIJ and TRUITJE BLITS. He was born 27 March 1882 in Amsterdam, Holland, and died 27 April 1914 in Zaandam, Holland. Resided: Louis Bothastraat 15 I, Amsterdam, Holland. 1. 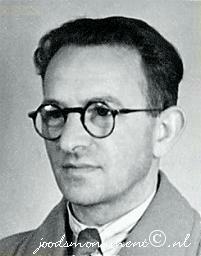 ELKAN MAIJ, b. 22 September 1906, Amsterdam, Holland; d. 31 August 1943, Central Europe, Municipality unknown - Holocaust victim. 2. MOZES MAY, b. 27 September 1907, Amsterdam, Holland; d. 09 July 1943, Sobibor death camp, Poland - Holocaust victim. SCHOONTJE BOAS was born 09 March 1883 in Harlingen, Friesland, Holland, and died 19 September 1942 in Auschwitz concentration camp, Poland - Holocaust victim. She married LEVIE HAKKER 30 December 1908 in Amsterdam, Holland, son of ABRAHAM HAKKER and BETJE WIJNSCHENK. He was born 17 December 1883 in Amsterdam, Holland, and died 29 October 1941 in Amsterdam, Holland. 1. 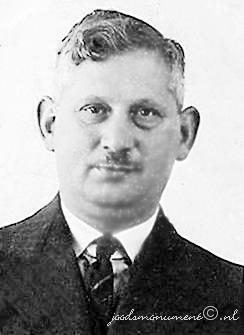 ABRAHAM HAKKER, b. 06 October 1909, Amsterdam, Holland; d. 23 April 1945, Municipality unknown - Holocaust victim. 2. 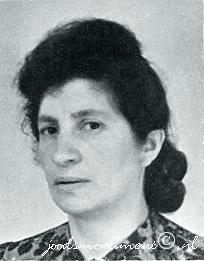 EVA HAKKER, b. 28 April 1912, Amsterdam, Holland; d. 03 September 1943, Auschwitz concentration camp, Poland - Holocaust victim; m. ABRAHAM VAN SIJES, 22 September 1937, Amsterdam, Holland; b. 10 May 1911, Amsterdam, Holland; d. 31 March 1944, Auschwitz concentration camp, Poland - Holocaust victim. Resided with wife, May 1940: Retiefstraat 71 III, Amsterdam, Holland. Resided with wife, November 1940: Tuinbouwstraat 2 huis, Amsterdam, Holland. Abraham van Sijes had a butcher shop at the Tuinbouwstraat in Betondorp. 3. BETJE HAKKER was born 25 January 1919 in Amsterdam, Holland, and died 28 February 1945 in Municipality unknown - Holocaust victim. She married IZAK SCHUITEVOERDER 25 March 1942 in Amsterdam, Holland, son of JACOB SCHUITEVOERDER and AALTJE KRANT. He was born 02 July 1917 in Amsterdam, Holland. Betje Hakker was a daughter of Levie Abraham Hakker and Schoontje Boas. In 1942 she got married to the son of Jacob Schuitevoerder and Aaltje Krant. Her husband survived the war. Parents of Izak Schuitevoerder were JACOB SCHUITEVOERDER born 11 September 1883 in Amsterdam, Holland, and died 04 June 1943 in Sobibor death camp, Poland - Holocaust victim. He married AALTJE KRANT 21 June 1906 in Amsterdam, Holland. She was born 20 December 1880 in Amsterdam, Holland, and died 04 June 1943 in Sobibor death camp, Poland - Holocaust victim. Resided with family, February 1941: Nieuwe Uilenburgerstraat 72 II, Amsterdam, Holland. RACHEL BOAS was born 10 February 1885 in Harlingen, Friesland, Holland, and died 14 September 1942 in Auschwitz concentration camp, Poland - Holocaust victim. She married WOLF BLOG 28 May 1919 in Amsterdam, Holland, son of GABRIEL BLOG and ELIZABETH DE KORTE. He was born 09 June 1885 in Amsterdam, Holland, and died 14 September 1942 in Auschwitz concentration camp, Poland - Holocaust victim. 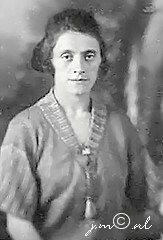 Wolf Blog's first wife was Lena Zwart. Lena died on 3 August 1918. The children born from this marriage were Jacob Blog and Elisabeth Blog. Wolf Blog's second wife was Rachel Boas. They lived at Waterlooplein 49 II,, third floor, in Amsterdam. A child who survived the war was born from this marriage. The archive of the Stichting Sieraden-Comité contains a statement of the right to inheritance from 1959. 1. GABRIEL BLOG, b. 23 March 1920, Amsterdam, Holland; d. 27 June 1986, Amsterdam, Holland. LEENTJE BOAS was born 07 October 1887 in Harlingen, Friesland, Holland, and died 08 October 1942 in Auschwitz concentration camp, Poland - Holocaust victim. She married PHILIP POLAK 05 August 1925 in Amsterdam, Holland, son of JACOB POLAK and ROOSJE HALBERSTADT. He was born 05 November 1893 in Amsterdam, Holland, and died 31 August 1943 in Central Europe, Municipality unknown - Holocaust victim. Resided with family, February 1941: Spitskopstraat 7 I, Amsterdam, Holland. Parents of Philip Polak were JACOB POLAK born 01 October 1865 in Amsterdam, Holland, and died 13 March 1943 in Sobibor death camp, Poland - Holocaust victim. He married ROOSJE HALBERSTADT 07 November 1888 in Amsterdam, Holland. She was born 05 December 1864 in Amsterdam, Holland, and died 13 March 1943 in Sobibor death camp, Poland - Holocaust victim. Resided with wife, February 1941: Lepelstraat 2 c - II, Amsterdam, Holland. 1. 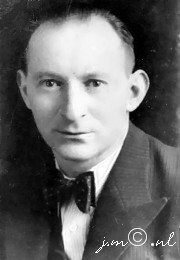 JACOB POLAK, b. 17 December 1926, Amsterdam, Holland; d. 31 August 1943, Central Europe, Municipality unknown - Holocaust victim. 2. EVA POLAK, b. 09 January 1929, Amsterdam, Holland; d. 08 October 1942, Auschwitz concentration camp, Poland - Holocaust victim. BENJAMIN BOAS was born 03 July 1890 in Harlingen, Friesland, Holland, and died 14 September 1942 in Auschwitz concentration camp, Poland - Holocaust victim. He married MARGARETHA VORST 04 October 1916 in Amsterdam, Holland, daughter of JOSEPH VORST and JANSJE MOSCOVITER. She was born 14 February 1887 in Amsterdam, Holland, and died 14 September 1942 in Auschwitz concentration camp, Poland - Holocaust victim. Resided with family, February 1941: Vrolikstraat 36 III, Amsterdam, Holland. Belonging to: Benjamin Boas and his family, Amsterdam. 1. .JOSEPH BOAS, b. 10 July 1917, Amsterdam, Holland; d. 16 April 1943, Sobibor death camp, Poland - Holocaust victim. Joseph Boas was married on 25 February 1942. 2. MOZES BOAS, b. 31 January 1921, Amsterdam, Holland; d. 31 March 1944, Auschwitz concentration camp, Poland - Holocaust victim; m. ROZETTA ESTHER STORK; b. 05 January 1920, Amsterdam, Holland; d. 22 October 1943, Auschwitz concentration camp, Poland - Holocaust victim. SARA BOAS was born 16 February 1892 in Harlingen, Friesland, Holland, and died 25 February 1934 in Amsterdam, Holland. She married JACOB VLEESCHHOUWER 13 August 1919 in Amsterdam, Holland, son of ARIE VLEESCHHOUWER and RACHEL STODEL. He was born 20 August 1891 in Amsterdam, Holland, and died 28 September 1942 in Auschwitz concentration camp, Poland - Holocaust victim. Parents of Jacob Vleeschhouwer were ARIE VLEESCHHOUWER born 08 June 1865 in Weesp, Holland, and died 28 September 1942 in Auschwitz concentration camp, Poland - Holocaust victim. He married RACHEL STODEL 31 October 1888 in Amsterdam, Holland. She was born 09 September 1865 in Amsterdam, Holland, and died 05 April 1937 in Amsterdam, Holland. Resided with daughter, February 1941: Magersfonteinstraat 5 huis, Amsterdam, Holland. 1. AARON VLEESCHHOUWER, b. 31 January 1924, Amsterdam, Holland; d. 26 November 1943, Auschwitz concentration camp, Poland - Holocaust victim. ESTELLA BOAS was born 16 May 1894 in Harlingen, Friesland, Holland, and died 02 April 1943 in Sobibor death camp, Poland - Holocaust victim. She married HERMAN MOSCOU 15 December 1915 in Amsterdam, Holland, son of DAVID MOSCOU and MARIANNE KAR. He was born 03 November 1888 in Amsterdam, Holland, and died 22 October 1942 in Auschwitz concentration camp, Poland - Holocaust victim. Resided with family, February 1941: Vrolikstraat 138 I, Amsterdam, Holland. Parents of Herman Moscou were DAVID MOSCOU born 18 August 1857 in Amsterdam, Holland, and died 19 December 1923 in Amsterdam, Holland. He married MARIANNE VAN DER KAR 01 September 1880 in Amsterdam, Holland. 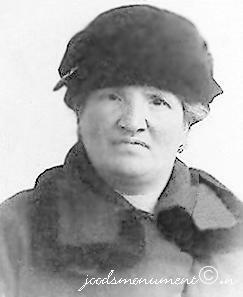 She was born 20 July 1854 in Amsterdam, Holland, and died 28 May 1943 in Sobibor death camp, Poland - Holocaust victim. Resided: Recht Boomssloot 36 a - II, Amsterdam, Holland. Marianne van der Kar married David Moscou in 1880 in Amsterdam. He passed away in 1923. They had eight children, among whom Joseph, Hijman, Evelina (who passed away in 1902), Herman, Emanuel, Debora and Salomon. 1. DAVID MOSCOU, b. 05 April 1916, Amsterdam, Holland; d. 04 October 1941, Mauthausen-Gusen Concentration Camp, Mauthausen, Austria - Holocaust victim. 2. MAX MOSCOU, b. 28 June 1931, Amsterdam, Holland; d. 02 April 1943, Sobibor death camp, Poland - Holocaust victim. ARON BOAS was born 08 February 1898 in Harlingen, Friesland, Holland, and died 02 July 1943 in Sobibor death camp, Poland - Holocaust victim. He married BETJE PEPER 05 October 1921 in Amsterdam, Holland, daughter of SALOMON PEPER and ELISABETH KOOPMAN. She was born 13 November 1900 in Amsterdam, Holland, and died 02 July 1943 in Sobibor death camp, Poland - Holocaust victim. Parents of Betje Peper were SALOMON PEPER born 16 March 1880 in Amsterdam, Holland, and died 16 April 1943 in Sobibor death camp, Poland - Holocaust victim. He married ELISABETH KOOPMAN 15 August 1900 in Amsterdam, Holland. She was born 19 September 1881 in Amsterdam, Holland, and died 15 December 1942 in Auschwitz concentration camp, Poland - Holocaust victim. Resided with family, February 1941: Tugelaweg 17 I, Amsterdam, Holland. 1. MAURITS BOAS, b. 20 January 1922, Amsterdam, Holland; d. 16 July 1943, Sobibor death camp, Poland - Holocaust victim. 2. SALOMON BOAS, b. 17 March 1926, Amsterdam, Holland; d. 16 July 1943, Sobibor death camp, Poland - Holocaust victim. 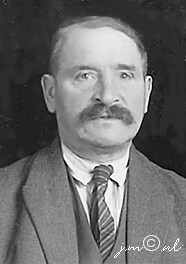 Salomon Boas joined the HEDW (“Hortus – victory in unity”) football club in Amsterdam for the 1939-1940 seasons. 3. ELIAS BOAS, b. 23 October 1928, Amsterdam, Holland; d. 02 July 1943, Sobibor death camp, Poland - Holocaust victim. 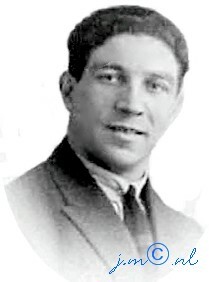 Elias Boas joined the HEDW (“Hortus – victory in unity”) football club in Amsterdam for the 1940-1941 seasons. SCHOONTJE PAIS was born 04 May 1888 in Amsterdam, Holland, and died 22 October 1942 in Auschwitz concentration camp, Poland - Holocaust victim. She married ABRAHAM FRESCO 29 October 1913 in The Hague, Holland, son of ARON FRESCO and JUDITH DE JONG. He was born 23 October 1883 in The Hague, Holland, and died 22 October 1942 in Auschwitz concentration camp, Poland - Holocaust victim. Resided with family, April 1942: Jan Blankenstraat 117, Den Haag, Holland. ISRAEL PAIS was born 30 January 1890 in Amsterdam, Holland, and died 03 December 1942 in Auschwitz concentration camp, Poland - Holocaust victim. He married SCHOONTJE BIET 25 October 1909 in Amsterdam, Holland, daughter of ELIAS BIET and MARIANNE BAK. She was born 10 June 1885 in Amsterdam, Holland, and died 03 December 1942 in Auschwitz concentration camp, Poland - Holocaust victim. 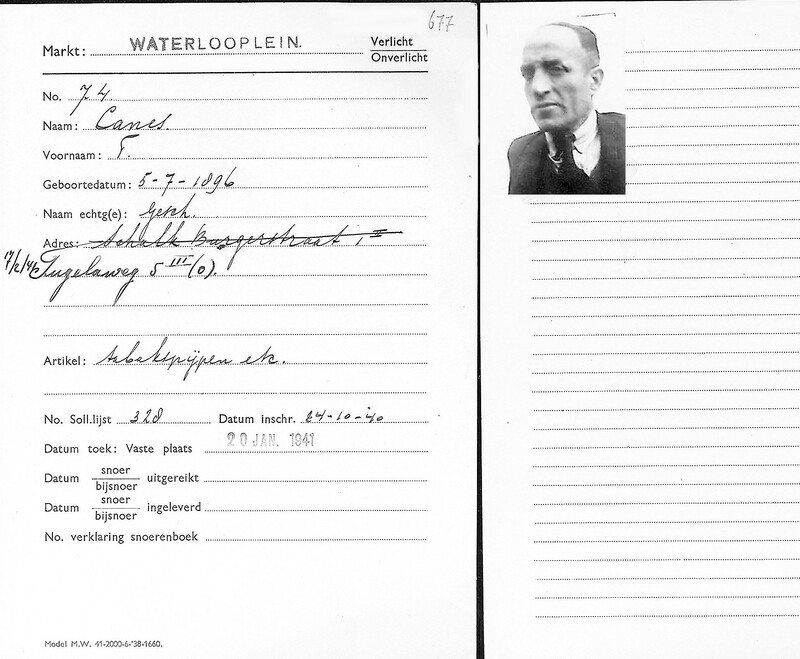 Resided with family, February 1941: Waterlooplein 25 III, Amsterdam, Holland. Three children of the Pais family resided at other addresses: Elisabeth (1910), Elias (1913) and Marianne (1916). Another son, named Jacob, died at a young age. 1. ELISABETH PAIS, b. 17 March 1910, Amsterdam, Holland; d. 15 July 1942, Amsterdam, Holland - Holocaust victim. 2. ELIAS PAIS, b. 29 April 1913, Amsterdam, Holland; d. 31 March 1944, Auschwitz concentration camp, Poland - Holocaust victim. 3. JOOST PAIS, b. 02 September 1915, Amsterdam, Holland; d. 15 March 1944, Auschwitz concentration camp, Poland - Holocaust victim. 4. MARIANNA PAIS, b. 14 November 1916, Amsterdam, Holland; d. 29 July 1942, Auschwitz concentration camp, Poland - Holocaust victim. 5. ABRAHAM PAIS, b. 08 May 1918, Amsterdam, Holland; d. 07 February 1945, Gross-Rosen concentration camp, Gross-Rosen, Lower Silesia, Poland - Holocaust victim. 6. LENA PAIS, b. 12 April 1922, Amsterdam, Holland; d. 08 October 1942, Auschwitz concentration camp, Poland - Holocaust victim; m. JACOB KLOOS, 25 March 1942, Amsterdam, Holland; b. 17 July 1920, Amsterdam, Holland; d. 13 February 2003, Amsterdam, Holland. 7. JACOB PAIS, b. 13 March 1923, Amsterdam, Holland; d. 16 January 1924, Amsterdam, Holland. 8. RACHEL PAIS, b. 18 February 1927, Amsterdam, Holland; d. 03 December 1942, Auschwitz concentration camp, Poland - Holocaust victim. 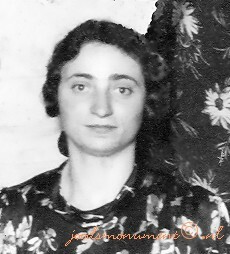 EVA PAIS was born 06 May 1891 in Amsterdam, Holland, and died 28 May 1943 in Sobibor death camp, Poland - Holocaust victim. She married ALEXANDER HEKSTER 03 December 1913 in Amsterdam, Holland, son of PHILIP HEKSTER and JANSJE TURFRIJER. 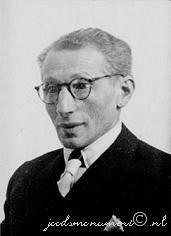 He was born 17 May 1891 in Amsterdam, Holland, and died 28 May 1943 in Sobibor death camp, Poland - Holocaust victim. Resided with family, April 1942: Stationsplein 47, Den Haag, Holland. Parents of Alexander Hekster were PHILIP HEKSTER born 05 May 1864 in Amsterdam, Holland, and died 05 February 1943 in Auschwitz concentration camp, Poland - Holocaust victim. He married JANSJE TURFRIJER 03 December 1890 in Amsterdam, Holland, daughter of MARKUS TURFREIJER and SCHOONTJE NIJKERK. She was born 01 February 1870 in Amsterdam, Holland, and died 05 February 1943 in Auschwitz concentration camp, Poland - Holocaust victim. Resided with family, February 1941: Ben Viljoenstraat 15 I, Amsterdam, Holland. Belonging to: Alexander Hekster and his family, Den Haag. Room: lace curtain (4), drape, hanging lamp, wall plate, tea cupboard, sideboard with ceramics, stone figure, table, chair (4), linoleum, carpet. Room: lace curtain (2), drape (2), hanging lamp, painting, wall cupboard, linen cupboard with linen and stoneware, wooden bed with bedding, bedside table, alarm clock, flower table (2), armchair (2), linoleum, cane mat. Room: lace curtain, drape (2), hanging lamp, wall plate (3), standing mirror, divan with cover, iron bed with bedding, table, flower table, chair (3), linoleum, alarm clock. Corridor and staircases: ceiling lamp, lace curtain (2), coat hooks with wall hanging, linoleum, cane runner, mat (3), runner with rods. Kitchen: lace curtain (3), plate lamp, shelf with kitchenware, wall mirror, solid fuel oven, gas ring, burner (3), kitchen scales, table, chair (3), armchair, linoleum, cane runner (2), cupboard. 1. JANSJE HEKSTER, b. 16 October 1916, Amsterdam, Holland; d. 02 July 1943, Sobibor death camp, Poland - Holocaust victim. 2. ELISABETH HEKSTER, b. 22 January 1924, Amsterdam, Holland; d. 02 July 1943, Sobibor death camp, Poland - Holocaust victim. ELIAS PAIS was born 29 November 1894 in Amsterdam, Holland, and died 31 March 1944 in Central Europe, Municipality unknown - Holocaust victim. He married HEINTJE TURFRIJER 28 October 1914 in The Hague, Holland, daughter of JOSEPH TURFRIJER and CAROLINA BOLLEGRAAF. She was born 05 June 1893 in The Hague, Holland, and died 02 November 1942 in Auschwitz concentration camp, Poland - Holocaust victim. Resided with family, April 1942: Kraijenhoffstraat 13, Den Haag, Holland. 1. JOOST PAIS, b. 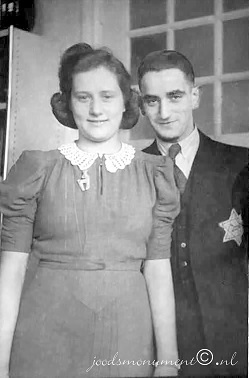 07 April 1915, The Hague, Holland; d. 31 March 1944, Central Europe, Municipality unknown - Holocaust victim; He married BERTHA LEONS 01 September 1937 in The Hague, Holland, daughter of DAVID LEONS and ROSI GRUNBAUM. She was born 14 July 1914 in The Hague, Holland, and died 02 November 1942 in Auschwitz concentration camp, Poland - Holocaust victim. Resided with wife, April 1942: Antheunisstraat 39, Den Haag, Holland. Parents of Bertha Leons were DAVID LEONS born 26 May 1883 in Rotterdam, Holland, and died 03 June 1939 in Lansingerland, Holland and ROSI GRUNBAUM. He married (1) SAARTJE VEGA 15 February 1906 in Rotterdam, Holland. She was born 27 March 1880 in The Hague, Holland, and died 09 October 1910 in The Hague, Holland. He married (2) ROSI GRUNBAUM 10 July 1913 in Frankfurt am Main, Germany. She was born 23 July 1888 in Frankfurt am Main, Germany, and died 26 January 1943 in Auschwitz concentration camp, Oswiecim Poland - Holocaust victim. Resided with family, April 1, 1942: Isingstraat 64, Den Haag, Holland. 2. MARCUS PAIS, b. 16 November 1916, The Hague, Holland; d. 01 May 1917, The Hague, Holland. 3. ISRAEL PAIS, b. 08 June 1918, The Hague, Holland; d. 09 July 1943, Sobibor death camp, Poland - Holocaust victim; m. HEINTJE KOEKOEK; b. 06 July 1918, The Hague, Holland; d. 09 July 1943, Sobibor death camp, Poland - Holocaust victim. Resided with wife, April 1942: Kraijenhoffstraat 30, Den Haag, Holland. It is on record that Heintje Koekeok was first held at Westerbork transit cap and from there deported to the east. Parents of Heintje Koekeok were MARCUS KOEKOEK born 24 July 1891 in The Hague, Holland, and died 08 October 1942 in Auschwitz concentration camp, Poland - Holocaust victim. He married LENA ELSAS 06 October 1915 in The Hague, Holland. She was born 15 September 1894 in The Hague, Holland, and died 08 October 1942 in Auschwitz concentration camp, Poland - Holocaust victim. Resided with family, April 1942: Christiaan Bruningsstraat 17, Den Haag, Holland. 4. MARCUS PAIS was born 08 June 1918 in The Hague, Holland, and died 16 July 1943 in Sobibor death camp, Poland - Holocaust victim. He married LENA PRINS, daughter of PHILIP PRINS and SOPHIA FRESCO. She was born 11 December 1914 in The Hague, Holland, and died 16 July 1943 in Sobibor death camp, Poland - Holocaust victim. Resided with wife, April 1942: Christiaan Bruningsstraat 22, Den Haag, Holland. Parents of Lena Prins were PHILIP PRINS born 05 January 1871 in The Hague, Holland, and died 05 March 1943 in Westerbork transit camp, Drenthe, Holland – Holocaust victim. He married SOPHIA FRESCO 07 September 1892 in The Hague, Holland, daughter of ELIAZAR FRESCO and SARA KLOOT. She was born 07 November 1872 in The Hague, Holland, and died 28 May 1943 in Sobibor death camp, Poland - Holocaust victim. Resided with family, April 1942: Christiaan Bruningsstraat 22, Den Haag, Holland. Philip Prins and Sophia Fresco had 11 children: Jacques, Emanuel, Louis, Jacob, Barend, Simon, Martha, Abraham, Lena and two children who presumably survived the war. 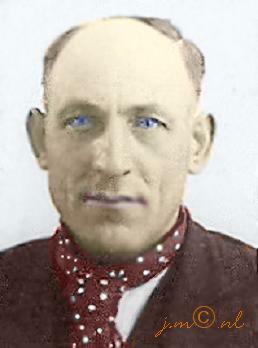 Philip Prins died on 5 March 1943 at the age of 72 in the Westerbork transit camp. He was buried in the Jewish cemetery at Assen on 8 March 1943. The funeral records at the Jewish cemetery in Assen reveal that Philip Prins was buried there. 5. CAROLINA PAIS, b. 22 December 1919, The Hague, Holland; d. 08 October 1942, Auschwitz concentration camp, Poland - Holocaust victim; m. ALEXANDER VAN LEEUWEN; b. 10 October 1918, The Hague, Holland; d. 21 January 1945, Blechhammer: Sub-camp of Auschwitz III - Monowitz, Poland - Holocaust victim. Resided with wife, April 1942: Kraijenhoffstraat 7, Den Haag, Holland. 6. SIMON PAIS, b. 25 January 1925, The Hague, Holland; d. 30 September 1942, Auschwitz concentration camp, Poland - Holocaust victim. 7. ELISABETH PAIS, b. 26 December 1935, The Hague, Holland; d. 02 November 1942, Auschwitz concentration camp, Poland - Holocaust victim. SOLOMON PAIS was born 09 November 1883 in Amsterdam, Holland, and died 03 December 1942 in Auschwitz concentration camp, Oswiecim Poland – Holocaust victim. He married ELISABETH ITALIAANDER 25 April 1906 in Amsterdam, Holland, daughter of NATHAN ITALIAANDER and SARA SARLIE. She was born 15 August 1885 in Amsterdam, Holland, and died 03 December 1942 in Auschwitz concentration camp, Oswiecim Poland – Holocaust victim. Resided February 1941: Pieter Nieuwlandstraat 39 I, Amsterdam, Holland. Salomon Pais and Elisabeth Italiaander married in 1906 at Amsterdam. They had seven children, including Vrouwtje, Sara (who passed away in 1908)Martha, Sara and Sophia. 1. VROUWTJE PAIS, b. 21 July 1906, Amsterdam, Holland; d. 03 September 1943, Auschwitz concentration camp, Oswiecim Poland – Holocaust victim. 2. SARA PAIS, b. 05 June 1908, Amsterdam, Holland; d. 21 June 1908, Amsterdam, Holland. 3. MARTHA PAIS, b. 27 October 1909, Amsterdam, Holland; d. 21 May 1943, Sobibor death camp, Poland - Holocaust victim. 4. SARA PAIS, b. 22 December 1911, Amsterdam, Holland; d. 26 March 1943, Sobibor death camp, Poland - Holocaust victim. 5. MARCUS PAIS, b. 10 February 1914, Amsterdam, Holland; d. 03 January 2000, Amsterdam, Holland. 6. SCHOONTJE PAIS, b. 09 May 1917, Amsterdam, Holland. 7. SOPHIA PAIS, b. 17 November 1919, Amsterdam, Holland; d. 31 March 1944, Auschwitz concentration camp, Oswiecim Poland – Holocaust victim. 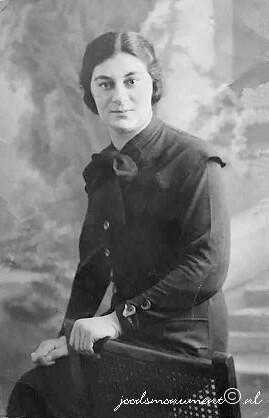 Sophia Pais worked as a fitter at the lingerie department of the clothing factory S.I. de Vries (SIDVA). During the war she went into hiding with acquaintances in Amsterdam. Sophia Pais always returned to her own home on Fridays to bathe. One day when she was at home, her parents were picked up. She offered to take their place, but that was not allowed. Her parents were taken away and a little while later someone betrayed her and Sophia Pais too was arrested. ELIAS PAIS was born 25 January 1886 in Amsterdam, Holland, and died 07 December 1942 in Auschwitz concentration camp, Poland - Holocaust victim. He married ROOSJE ROSELAAR 27 November 1918 in Amsterdam, Holland, daughter of SALOMON ROSELAAR and ENGELTJE ELZAS. She was born 26 July 1891 in Amsterdam, Holland, and died 07 December 1942 in Auschwitz concentration camp, Poland - Holocaust victim. 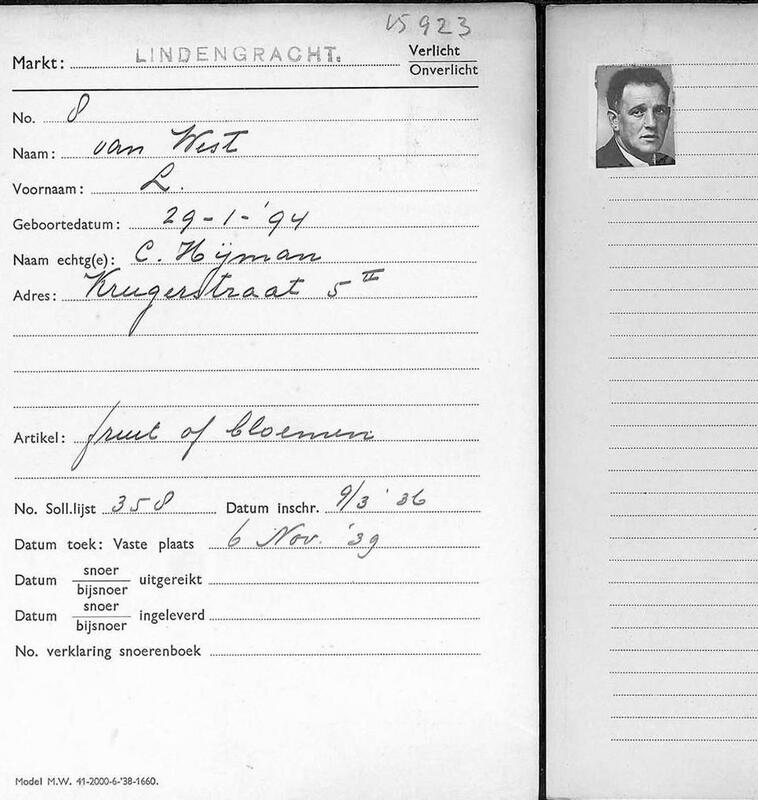 Resided with family, February 1941:Magersfonteinstraat 5 III, Amsterdam, Holland. Occupation: Employed at a municipal institution for the blind. 1. VROUWTJE PAIS, b. 25 December 1919, Amsterdam, Holland; d. 23 April 1943, Sobibor death camp, Poland - Holocaust victim. 2. ENGELINE PAIS, b. 03 February 1923, Amsterdam, Holland; d. 13 March 1928, Amsterdam, Holland. 3. MARCUS PAIS, b. 03 June 1924, Amsterdam, Holland. 4. SCHOONTJE PAIS, b. 10 June 1926, Amsterdam, Holland; d. 07 December 1942, Auschwitz concentration camp, Poland - Holocaust victim. 5. CELIEN PAIS, b. 08 June 1928, Amsterdam, Holland; d. 07 December 1942, Auschwitz concentration camp, Poland - Holocaust victim. 6. ESTHER PAIS, b. 22 June 1931, Amsterdam, Holland; d. 07 December 1942, Auschwitz concentration camp, Poland - Holocaust victim. 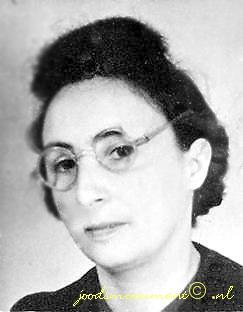 MARTHA PAIS was born 21 February 1888 in Amsterdam, Holland, and died 02 July 1943 in Sobibor death camp, Poland - Holocaust victim. She married PHILIP COHEN 19 July 1916 in Amsterdam, Holland, son of EMANUEL COHEN and ROSA COHEN. He was born 25 July 1888 in Amsterdam, Holland, and died 02 July 1943 in Sobibor death camp, Poland - Holocaust victim. Resided with family, February 1941:Laing's Nekstraat 18 I, Amsterdam, Holland. Belonging to: Philip Cohen and his family, Amsterdam. 1. ROZA COHEN, b. 10 February 1918, Amsterdam, Holland; d. 28 May 1943, Sobibor death camp, Poland - Holocaust victim. 2. MARCUS COHEN, b. 14 January 1925, Amsterdam, Holland; d. 30 September 1942, Auschwitz concentration camp, Poland - Holocaust victim. JOSEPH PAIS was born 22 February 1890 in Amsterdam, Holland, and died 04 June 1943 in Sobibor death camp, Poland - Holocaust victim. He married ESTHER POLK 27 February 1919 in Amsterdam, Holland, daughter of HIJMAN POLK and KLAARE DE KROMME. She was born 08 June 1890 in Amsterdam, Holland, and died 04 June 1943 in Sobibor death camp, Poland - Holocaust victim. Resided with family, February 1941: Spitskopstraat 8 II, Amsterdam, Holland. 1. MARCUS PAIS, b. 19 December 1919, Amsterdam, Holland; d. 16 September 1943, Lahde workers camp, Lahde, Minden, North Rhine, Westphalia, Germany - Holocaust victim; m. LENA PRINS, 29 April 1942, Amsterdam, Holland; b. 30 March 1921, Amsterdam, Holland; d. 24 September 1943, Auschwitz concentration camp, Poland - Holocaust victim. 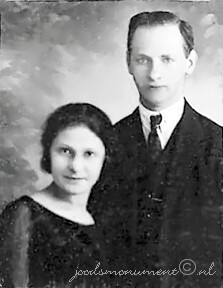 Parents of Lena Prins were RACHEL GROEN and ISRAEL PRINS born 07 March 1868 in Amsterdam, Holland, and died 02 July 1943 in Sobibor death camp, Poland - Holocaust victim. He married (1) MARIA KORNALIJNSLIJPER 31 May 1899 in Antwerp, Belgium, daughter of SALOMON (ZADOK and ESTHER WOUDHUIJSEN. She was born 28 February 1874 in Amsterdam, Holland, and died 01 June 1910 in Amsterdam, Holland. He married (2) RACHEL GROEN 05 November 1919 in Zaandam, Holland. She was born 26 February 1886 in Amsterdam, Holland, and died 11 June 1943 in Sobibor death camp, Poland - Holocaust victim. Resided with family, February 1941: Rapenburgerstraat 161 bovenhuis, Amsterdam, Holland. Israel Prins married Maria Kornalijnslijper in 1899 in Amsterdam. She passed away in 1910. They had four children: Rachel, Salomon, Eva and Esther. 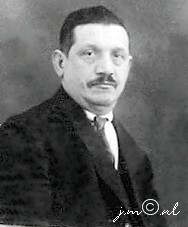 Israel Prins remarried in 1919 in Zaandam to Rachel Groen. They had a daughter Lena. The Jokos file reveals that a claim was lodged for compensation for valuables surrendered to the Lippmann-Rosenthal looting bank (L-claim, number 10). 2. HIJMAN PAIS, b. 09 March 1921, Amsterdam, Holland; d. 31 December 1942, Auschwitz concentration camp, Poland - Holocaust victim. 3. LOUIS PAIS, b. 11 September 1931, Amsterdam, Holland; d. 04 June 1943, Sobibor death camp, Poland - Holocaust victim. SCHOONTJE PAIS was born 14 August 1895 in Amsterdam, Holland, and died 02 July 1943 in Sobibor death camp, Poland - Holocaust victim. She married HIJMAN BLEEKVELD 20 October 1920 in Amsterdam, Holland, son of MOSES BLEEKVELD and BETJE MOSCOVITER. He was born 28 March 1892 in Amsterdam, Holland, and died 02 July 1943 in Sobibor death camp, Poland - Holocaust victim. Resided with family, February 1941: Vechtstraat 122 I, Amsterdam, Holland. 1. ELISABETH BLEEKVELD, b. 18 January 1922, Amsterdam, Holland; d. 30 September 1942, Auschwitz concentration camp, Poland - Holocaust victim. 2.FREDERIKA BLEEKVELD, b. 14 June 1924, Amsterdam, Holland; d. 31 October 1943, Sobibor death camp, Poland - Holocaust victim. 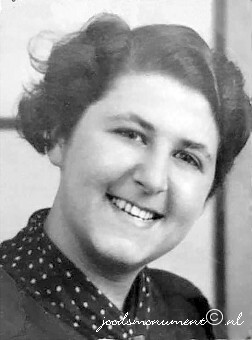 EVA PAIS was born 06 February 1898 in Amsterdam, Holland, and died 14 September 1942 in Auschwitz concentration camp, Oswiecim Poland – Holocaust victim. She married JONAS PAMPEL 25 August 1926 in Amsterdam, Holland, son of MOZES PAMPEL and SCHOONTJE SIMONS. He was born 17 January 1898 in Amsterdam, Holland, and died 06 July 1966 in Amsterdam, Holland. Resided with family, February 1941: Weesperstraat 31 I, Amsterdam, Holland. The Jokos file reveals that a claim was lodged for compensation for valuables surrendered to the Lippmann-Rosenthal looting bank (L-claim, number 9126/11287). 1. FREDERIKA PAMPEL, b. 26 July 1927, Amsterdam, Holland; d. 14 September 1942, Auschwitz concentration camp, Oswiecim Poland – Holocaust victim. 2. ROSA PAMPEL, b. 12 March 1929, Amsterdam, Holland; d. 14 September 1942, Auschwitz concentration camp, Oswiecim Poland – Holocaust victim. 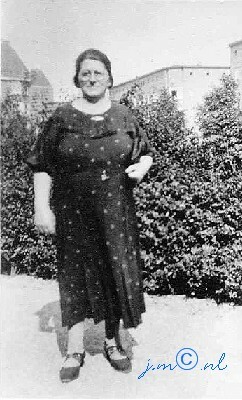 SCHOONTJE VELLEMAN was born 02 February 1884 in Amsterdam, Holland, and died 28 May 1943 in Sobibor death camp, Poland - Holocaust victim. She married ELIAS NOOT 16 April 1913 in Schoten, Belgium, son of JOEL NOOT and ESTER LOBO. He was born 14 September 1853 in Amsterdam, Holland, and died 20 May 1942 in Amsterdam, Holland. 1. JOEL NOOT, b. 05 August 1916, Amsterdam, Holland; d. 04 June 1943, Sobibor death camp, Poland - Holocaust victim. 2. LENA NOOT, b. 07 February 1920, Amsterdam, Holland; d. 12 October 1942, Auschwitz Concentration Camp Poland - Holocaust victim. ESTHER VELLEMAN was born 28 October 1885 in Amsterdam, Holland, and died 16 August 1942 in Auschwitz concentration camp, Poland - Holocaust victim. She married EMANUEL DIGTMAKER 04 November 1909 in Amsterdam, Holland, son of LEVIE DIGTMAKER and ESTHER WALVIS. He was born 20 December 1885 in Amsterdam, Holland, and died 30 September 1942 in Auschwitz concentration camp, Poland - Holocaust victim. Resided with family: Straatweg 83 II, Hillegersberg, Rotterdam, Holland. The Jokos file reveals that a claim was lodged for compensation for valuables surrendered to the Lippmann-Rosenthal looting bank (L-claim, number 1). Parents of Sara Daglooner were EPHRAIM DAGLOONDER born 22 June 1893 in Amsterdam, Holland, and died 26 January 1943 in Auschwitz concentration camp, Poland - Holocaust victim. He married NAATJE GODSCHALK 24 October 1917 in Amsterdam, Holland. She was born 20 June 1891 in Amsterdam, Holland, and died 26 January 1943 in Auschwitz concentration camp, Poland - Holocaust victim. Resided with family April 1942: Jacob Catsstraat 313, Den Haag, Holland. Living room: linoleum, carpet, mat (2), smoker's table, table, easy chair, chair (4), sideboard with linen and crockery (2), small statue (3), mirror, vase (2), solid fuel oven, hanging lamp, lace curtain and drape (4), wall cupboard. Bedroom: linoleum, single bed with bedding (2), linoleum, cane mat, double bed with bedding, table, chair (2), mirror, hanging lamp, lace curtain and drape (2), wall cupboard. Kitchen: table, chair, gas ring, ceiling lamp. Corridor: runner. Courtyard: tub (2). 1. LENA DIGTMAKER, b. 03 August 1910, Amsterdam, Holland; d. 30 September 1942, Auschwitz concentration camp, Poland - Holocaust victim. 2. LEVIE DIGTMAKER, b. 20 December 1911, Amsterdam, Holland; d. 30 September 1942, Auschwitz concentration camp, Poland - Holocaust victim; m. SARA DAGLOONDER, 29 March 1937, Rotterdam, Holland; b. 22 June 1914, Amsterdam, Holland; d. 02 July 1943, Sobibor death camp, Poland - Holocaust victim. 3. SALOMON DIGTMAKER, b. 24 June 1919, Rotterdam, Holland; d. 30 September 1942, Auschwitz concentration camp, Poland - Holocaust victim. HANNA VELLEMAN was born 13 June 1887 in Amsterdam, Holland, and died 17 October 1926 in Amsterdam, Holland. She married TOBIAS JAS 07 June 1911 in Amsterdam, Holland, son of JOEL JAS and ROSETTE SCHARLEWIE. He was born 20 November 1884 in Amsterdam, Holland, and died 08 March 1943 in Amsterdam, Holland. 1. ROSETTE JAS, b. 23 June 1912, Amsterdam, Holland; d. 26 July 1942, Auschwitz concentration camp, Poland - Holocaust victim. JOSEPH VELLEMAN was born 21 August 1891 in Amsterdam, Holland, and died 25 January 1943 in Auschwitz concentration camp - Holocaust victim. 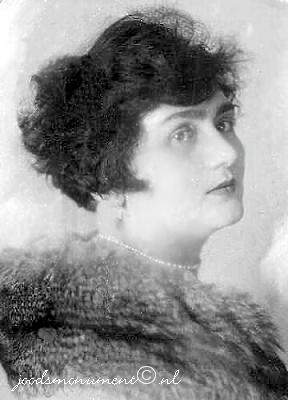 He married ESTHER VAN KREEVELD 29 May 1912 in Amsterdam, Holland, daughter of BENJAMIN VAN KREEVELD and AALTJE COHEN. She was born 02 January 1893 in Amsterdam, Holland, and died 04 June 1943 in Sobibor death camp, Poland - Holocaust victim. Joseph Velleman was married in Amsterdam on 29 May 1912 to Esther van Kreeveld, a daughter of Benjamin van Kreeveld and Aaltje Cohen. In December 1938 however, Joseph Velleman became an inhabitant of Het Apeldoornse Bos, from where he was deported to Auschwitz on 23 January 1943 and there has been killed. Parents of Esther van Kreeveld were BENJAMIN VAN KREEVELD born 05 December 1862 in Hoorn, Holland, and died 27 November 1942 in Auschwitz concentration camp - Holocaust victim. He married AALTJE COHEN 01 July 1883 in Amsterdam, Holland. She was born 03 January 1863 in Leeuwarden, Friesland, Holland, and died 21 April 1939 in Amsterdam, Holland. Resided with family, February 1941: Waterlooplein 41 huis, Amsterdam, Holland. 1. SALOMON VELLEMAN, b. 19 February 1913, Amsterdam, Holland; d. 04 June 1943, Sobibor death camp, Poland - Holocaust victim; m. SARA VLESSCHEDRAGER, 09 July 1941, Amsterdam, Holland; b. 10 May 1918, Amsterdam, Holland; d. 04 June 1943, Sobibor death camp, Poland - Holocaust victim. Resided with family, February 1941: Nieuwe Amstelstraat 17 I, Amsterdam, Holland. According to a list with shops of Jewish owners, compiled by the Amsterdam police in 1940, this family had a produce shop, address: Nieuwe Amstelstraat 10 in Amsterdam. EVA VELLEMAN was born 02 September 1893 in Zaandam, Holland, and died 28 January 1944 in Auschwitz concentration camp - Holocaust victim. She married JACOB FRANSCHMAN 20 June 1917 in Amsterdam, Holland, son of LEMAN FRANSCHMAN and NAATJE DOOF. He was born 20 December 1895 in Amsterdam, Holland, and died 15 February 1944 in Auschwitz concentration camp - Holocaust victim. Resided with family, February 1941: Sint Antoniesbreestraat 38 huis, Amsterdam, Holland. According to a list with shops of Jewish owners, compiled by the Amsterdam police in 1940, this family had a pastry shop, address: Sint Antoniesbreestraat 38 in Amsterdam. 1. LOUIS FRANSCHMAN, b. 06 July 1918, Amsterdam, Holland; d. 08 October 1941, Mauthausen-Gusen Concentration Camp, Mauthausen, Austria. 2. SALOMON FRANSCHMAN, b. 05 January 1923, Amsterdam, Holland; d. 28 January 1944, Auschwitz concentration camp - Holocaust victim. DINA VELLEMAN was born 24 October 1895 in Amsterdam, Holland, and died 22 October 1943 in Auschwitz concentration camp, Poland - Holocaust victim. She married ABRAHAM WAGENHUIS, son of JUDA WAGENHUIS and SARA DE JONG. He was born 12 September 1890 in Amsterdam, Holland, and died 22 October 1943 in Auschwitz concentration camp, Poland - Holocaust victim. Resided February 1941: Saffierstraat 30 I, Amsterdam, Holland. 1. SARA (SUZE) WAGENHUIS, m. HANS DE VRIES. JACOB VELLEMAN was born 13 December 1897 in Amsterdam, Holland, and died 31 March 1944 in Auschwitz concentration camp - Holocaust victim. He married HANNA FRENKEL 20 July 1921 in Amsterdam, Holland, daughter of ANDRIES FRENKEL and SAARTJE DRUKKER. She was born 10 February 1894 in Amsterdam, Holland, and died 03 September 1943 in Auschwitz concentration camp - Holocaust victim. Resided with family, February 1941: Olympiaweg 65 II, Amsterdam, Holland. Jacob Velleman joined the Hollandia-Kattenburg textile factory in Amsterdam on 7 April 1919. On Wednesday, 11 November 1942, around 4:30 PM, Willy Lages conducted the Sicherheitspolizei raid on the Hollandia factories. All exits were blocked and the Jewish staff members were taken away that evening. Photographs of all workers taken away that evening, as well as those deported previously, appear in the 'Boek der tranen' [Book of tears]. Hanna Velleman-Frenkel attended the wedding of her nephew Salomon Charles Velleman to Sonja van Emmen. The marriage was performed at Westerbork transit camp on 30 August 1943. Hanna signed the marriage certificate. 1. LENY VELLEMAN, b. 22 November 1922, Zandvoort, Holland; d. 17 April 2012, Amsterdam, Holland. 2. ANDRIES VELLEMAN, b. 05 December 1926, Amsterdam, Holland; d. 31 March 1944, Central Europe, Municipality unknown - Holocaust victim. In August 1941 Andries Velleman was enrolled in the first year of the programme for electricians of the 3rd vocational school in East Amsterdam. On the third row from the top, on the right is Andries Velleman (05-05-1926, Amsterdam / 31-03-1944, unknown), next to him is Emma (Emmie) Vas Nunes (19-03-1928, Amsterdam / 11 -06-1943, Sobibor), on the fourth row from the top is the far left Betje Elisabeth (Beppie) van der Sluis (10-06-1928, Amsterdam / 19-11-1942, Auschwitz) and on the same row at the far right is Bernard (Bernie) Bouwman (07-09-1917, Amsterdam / 21-01-1945, Blechhammer) and on the fifth row from the top is Betje Sanders (22-12-1927, Amsterdam / 27-08-1943, Auschwitz). JOHANNA VELLEMAN was born 03 January 1900 in Amsterdam, Holland, and died 28 January 1944 in Auschwitz concentration camp - Holocaust victim. She married ISAAC SMEER 21 September 1922 in Amsterdam, Holland, son of WOLF SMEER and ETJE SLAGER. He was born 15 November 1896 in Amsterdam, Holland, and died 20 May 1940 in Amsterdam, Holland. Resided with family, February 1941: Geuzenkade 44 I, Amsterdam, Holland. 1. LENA SMEER, b. 26 September 1929, Amsterdam, Holland; d. 28 January 1944, Auschwitz concentration camp - Holocaust victim. MICHEL VELLEMAN born 04 January 1903 in Amsterdam, Holland, and died 31 March 1944 in Auschwitz concentration camp - Holocaust victim. He married MARGARETHA COHEN 01 February 1928 in The Hague, Holland, daughter of SAMUEL COHEN and HELENA MARKENS. She was born 20 February 1906 in Leeuwarden, Holland, and died 10 September 1943 in Auschwitz concentration camp - Holocaust victim. Resided with family, April 1942: Harstenhoekweg 51, Scheveningen, Holland. Parents of Margaretha Cohen were SAMUEL COHEN born 06 September 1870 in Arnhem, Holland, and died 01 August 1928 in The Hague, Holland. He married HELENA MARKENS 26 April 1897 in Zwolle, Overijssel, Holland. She was born 07 December 1873 in Zwolle, Overijssel, Holland, and died 07 May 1943 in Sobibor death camp, Poland - Holocaust victim. Resided: Centraal Israëlitisch Oude Mannen- en Vrouwenhuis, Oosthaven 31, Gouda, Holland. 1. HANS SAMUEL VELLEMAN, b. 04 November 1928, The Hague, Holland; d. 10 September 1943, Auschwitz concentration camp - Holocaust victim. 2. ERNEST SALOMON VELLEMAN, b. 14 November 1930, The Hague, Holland; d. 10 September 1943, Auschwitz concentration camp - Holocaust victim. BERTA VELLEMAN was born 03 June 1905 in Amsterdam, Holland, and died 28 May 1943 in Sobibor death camp, Poland - Holocaust victim. She married (1) TOBIAS CANES 02 September 1926 in Amsterdam, Holland, son of MEIJER CANES and JUDITH POOL. He was born 05 July 1896 in Amsterdam, Holland, and died 11 June 1943 in Sobibor death camp, Poland - Holocaust victim. 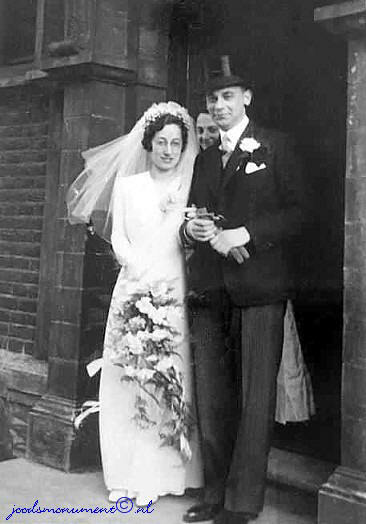 She married (2) SIMON NAARDEN 23 October 1940 in Amsterdam, Holland, son of SALOMON NAARDEN and VROUWTJE HEKSTER. He was born 01 May 1890 in Amsterdam, Holland, and died 28 May 1943 in Sobibor death camp, Poland - Holocaust victim. Resided with husband, Simon Naarden, February 1941: Zwanenburgwal 19 I, Amsterdam, Holland. Parents of Tobias Canes were MEIJER CANES born 28 December 1865 in Amsterdam, Holland, and died 08 July 1939 in Amsterdam, Holland. He married JUDITH POOL 11 April 1888 in Amsterdam, Holland. She was born 14 December 1867 in Amsterdam, Holland, and died 11 June 1943 in Sobibor death camp, Poland - Holocaust victim. Resided, February 1941: Derde Oosterparkstraat 18 huis, Amsterdam, Holland. Simon Naarden was previously married to Elsje Beugeltas. He had two children with her. 1. HELENA CANES, b. 23 October 1934, Amsterdam, Holland; d. 28 May 1943, Sobibor death camp, Poland - Holocaust victim. SCHOONTJE PAIS was born 12 February 1895 in Amsterdam, Holland, and died 15 December 1942 in Auschwitz concentration camp, Poland - Holocaust victim. She married BENJAMIN QUERIDO 09 August 1917 in Amsterdam, Holland, son of ARON QUERIDO and HANNA SCHEFFER. He was born 10 March 1893 in Amsterdam, Holland, and died 12 October 1942 in Auschwitz concentration camp, Poland - Holocaust victim. Resided with family, February 1941: Albert Cuypstraat 131, Amsterdam, Holland. Schoontje Pais was a widow. 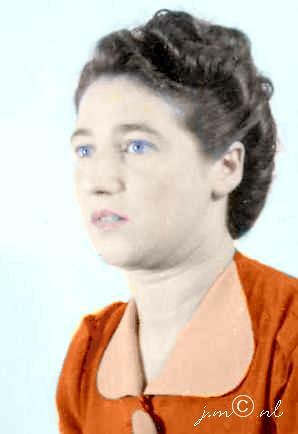 Her husband was arrested and died after maltreatment on 5 December 1942 in Amsterdam. Belonging to: Benjamin Querido and his family, Amsterdam. 1. SIENTJE QUERIDO, b. 15 August 1917, Amsterdam, Holland; d. 12 October 1942, Auschwitz concentration camp, Poland - Holocaust victim. 2. GRIETJE QUERIDO was born 23 June 1919 in Amsterdam, Holland, and died 23 September 1942 in Auschwitz concentration camp, Poland - Holocaust victim. She married LEO LOPES CARDOZO 26 March 1941 in Amsterdam, Holland, son of SAMUEL CARDOZO and LIBE SRAIBER. He was born 13 October 1918 in Watergraafsmeer, Amsterdam, Holland, and died 23 September 1942 in Auschwitz concentration camp, Poland - Holocaust victim. Parents of Leo Lopes Cardozo were SAMUEL LOPES CARDOZO born 02 May 1886 in Amsterdam, Holland, and died 14 October 1944 in Auschwitz concentration camp, Poland - Holocaust victim. He married LIBE SRAIBER 01 April 1913 in Antwerp, Belgium. She was born 19 March 1886 in Galati, Romania, and died 14 October 1944 in Auschwitz concentration camp, Poland - Holocaust victim. Resided with family, February 1941: Vechtstraat 56 I, Amsterdam, Holland. 3. AARON QUERIDO, b. 28 January 1921, Amsterdam, Holland; d. 16 April 1943, Sobibor death camp, Poland - Holocaust victim. 4. DUIFJE QUERIDO, b. 09 November 1922, Amsterdam, Holland; d. 30 September 1942, Auschwitz concentration camp, Poland - Holocaust victim. 5. EMANUEL QUERIDO, b. 11 January 1924, Amsterdam, Holland; d. 14 May 1943, Sobibor death camp, Poland - Holocaust victim. 6. LOUISE QUERIDO, b. 10 April 1925, Amsterdam, Holland; d. 15 December 1942, Auschwitz concentration camp, Poland - Holocaust victim. 7. MOZES QUERIDO, b. 06 April 1927, Amsterdam, Holland; d. 09 April 1943, Sobibor death camp, Poland - Holocaust victim. JOSEPH PAIS was born 10 February 1898 in Harlingen, Friesland, Holland, and died 30 September 1942 in Auschwitz concentration camp, Poland - Holocaust victim. He married MIJNTJE PEEPER 20 June 1917 in Amsterdam, Holland, daughter of JESAIAS PEEPER and RICA SCHUIT. She was born 17 October 1893 in Amsterdam, Holland, and died 29 July 1942 in Auschwitz concentration camp, Poland - Holocaust victim. Resided with family, February 1941: Tugelaweg 97 II, Amsterdam, Holland. The Jokos files reveal that a claim was lodged for compensation for valuables surrendered to the Lippmann-Rosenthal looting bank (L-claim, number 9108/4290). 1. MOZES PAIS, b. 01 April 1918, Amsterdam, Holland; d. 30 September 1942, Auschwitz concentration camp, Poland - Holocaust victim. 2. JESAIAS PAIS was born 01 May 1920 in Amsterdam, Holland, and died 30 September 1942 in Auschwitz concentration camp, Poland - Holocaust victim. He married MIETJE VAN CLEEF 25 February 1942 in Amsterdam, Holland, daughter of EMANUEL VAN CLEEF and HADASSA WOLFF. She was born 29 May 1921 in Amsterdam, Holland, and died 30 September 1942 in Auschwitz concentration camp, Poland - Holocaust victim. Parents of Mietje van Cleef were EMANUEL VAN CLEEF born 20 September 1878 in Amsterdam, Holland, and died 05 March 1943 in Sobibor death camp, Poland - Holocaust victim. He married HADASSA WOLFF 25 January 1911 in Amsterdam, Holland. She was born 20 May 1881 in Amsterdam, Holland, and died 05 March 1943 in Sobibor death camp, Poland - Holocaust victim. Resided with family, February 1941: Tugelaweg 93 huis, Amsterdam, Holland. Emanuel van Cleef was a son of Meijer van Cleef and Saartje Kloots. He married in Amsterdam on 25 January 1911 to Hadassa Wolff, a daughter of Abraham Wolff and Mietje Rabbie. The couple had two children: Meijer and Mietje. 3. GRETA PAIS, b. 01 June 1922, Amsterdam, Holland; d. 30 September 1942, Auschwitz concentration camp, Poland - Holocaust victim. 4. RIKA PAIS, b. 21 September 1923, Amsterdam, Holland; d. 30 September 1942, Auschwitz concentration camp, Poland - Holocaust victim. 5. DUIFJE PAIS, b. 02 April 1925, Amsterdam, Holland; d. 30 September 1942, Auschwitz concentration camp, Poland - Holocaust victim. 6. ELIAS PAIS, b. 27 March 1931, Amsterdam, Holland; d. 29 July 1942, Auschwitz concentration camp, Poland - Holocaust victim. 7. MARCUS PAIS, b. 25 April 1936, Amsterdam, Holland; d. 29 July 1942, Auschwitz concentration camp, Poland - Holocaust victim. 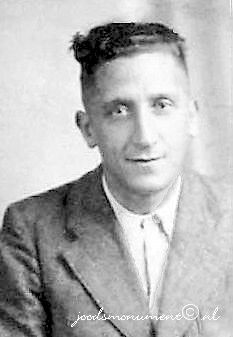 DUIFJE PAIS was born 24 March 1901 in Harlingen, Friesland, Holland, and died 09 April 1943 in Sobibor death camp, Poland - Holocaust victim. She married SIMON ISAAC 22 December 1920 in Amsterdam, Holland, son of ABRAHAM ISAAC and REGINA SON. He was born 17 December 1899 in Amsterdam, Holland, and died 09 April 1943 in Sobibor death camp, Poland - Holocaust victim. Resided with family, February 1941: Kraaipanstraat 71 huis, Amsterdam, Holland. Parents of Simon Isaac were ABRAHAM ISAAC born 23 February 1875 in Sneek, Holland, and died 05 October 1942 in Auschwitz concentration camp, Poland - Holocaust victim. He married REGINA SON 20 October 1897 in Amsterdam, Holland. She was born 20 May 1873 in Amsterdam, Holland, and died 25 January 1943 in Auschwitz concentration camp, Poland - Holocaust victim. Resided: Staalstraat 22 II, Amsterdam, Holland. Since 27 November 1933 Abraham Isaac lived as a lodger in the boarding-house of Betje Bleekveld, who was registered as lodging-house keeper at Staalstaat 22 II. Resided: Centraal Israelitisch Krankzinnigengesticht Het Apeldoornse Bos, Zutphensestraat 106, Apeldoorn, Holland. Regina Son was a daughter of Simon Wolf Son and Lea Nunes Vaz. She married in Amsterdam on 20 October 1897 to Abraham Isaac, son of Eliazer Isaac and Esther Blok. Regina and Abraham had four children: Alice (born in London), Simon, Esther and Willem. Per 2 February 1905 Regina's name was removed from the Amsterdam municipal register as she became a resident of the "Apeldoornse Bos". 1. 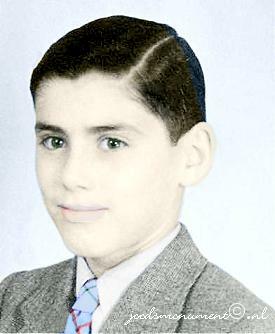 ABRAHAM ISAAC was born 18 April 1921 in Amsterdam, Holland, and died 02 May 1945 in Municipality unknown - Holocaust victim. He married ELISABETH CON, daughter of MAURITS CON and ESTHER WESSEL. She was born 12 June 1921 in Amsterdam, Holland, and died 02 May 1945 in Municipality unknown - Holocaust victim. Parents of Elisabeth Con were MAURITS CON was born 18 July 1891 in Amsterdam, Holland, and died 07 September 1942 in Auschwitz concentration camp, Poland - Holocaust victim. He married ESTHER WESSEL 02 April 1914 in Zaandam, Holland. She was born 07 December 1891 in Amsterdam, Holland, and died 07 September 1942 in Auschwitz concentration camp, Poland - Holocaust victim. Resided with family, February 1941: Waalstraat 44 II, Amsterdam, Holland. 2. MOZES ISAAC, b. 05 January 1929, Amsterdam, Holland; d. 09 April 1943, Sobibor death camp, Poland - Holocaust victim. 3. REGINA ISAAC, b. 17 January 1931, Amsterdam, Holland; d. 09 April 1943, Sobibor death camp, Poland - Holocaust victim. 4. ELIAZAR ISAAC, b. 03 August 1934, Amsterdam, Holland; d. 09 April 1943, Sobibor death camp, Poland - Holocaust victim. 5. JOSEPH ISAAC, b. 18 March 1939, Amsterdam, Holland; d. 09 April 1943, Sobibor death camp, Poland - Holocaust victim. ELIAS PAIS was born 16 April 1904 in Harlingen, Friesland, Holland, and died 21 April 1977 in Amsterdam, Holland. He married (1) FREDERIKA PEPERWORTEL 26 August 1925 in Amsterdam, Holland, daughter of ABRAHAM PEPERWORTEL and JUDITH DU PONT. She was born 05 August 1905 in Amsterdam, Holland, and died 29 July 1942 in Auschwitz concentration camp, Poland - Holocaust victim. He married (2) JUDITH HOFMAN 29 June 1946 in Amsterdam, Holland, daughter of DAVID HOFMAN and NAATJE WOUDE. She was born 22 May 1917 in Amsterdam, Holland, and died 21 March 2001 in Amsterdam, Holland. Frederika Pais-Peperwortel lived with her husband and four children at 27 Louis Bithastraat, fourth floor, in Amsterdam. In 1942, the family was deported to Auschwitz via Westerbork. Frederika and the four children were killed. Her husband survived the war. The Jokos file reveals that a claim was lodged for compensation for valuables surrendered to the Lippmann-Rosenthal looting bank (L-claim, number 9099/4322). Parents of Judith Hofman were DAVID HOFMAN born 05 July 1895 in Amsterdam, Holland, and died 24 September 1943 in Auschwitz concentration camp, Poland - Holocaust victim. He married NAATJE VAN DER WOUDE 27 October 1915 in Amsterdam, Holland. She was born 31 July 1896 in Amsterdam, Holland, and died 24 September 1943 in Auschwitz concentration camp, Poland - Holocaust victim. Resided with family, February 1941: President Brandstraat 46 III, Amsterdam, Holland. Parents of Frederika Peperwortel were ABRAHAM PEPERWORTEL born 07 July 1874 in Amsterdam, Holland, and died 24 September 1942 in Auschwitz concentration camp, Poland - Holocaust victim. He married JUDITH DU PONT 30 October 1901 in Amsterdam, Holland. She was born 10 May 1872 in Amsterdam, Holland, and died 24 September 1942 in Auschwitz concentration camp, Poland - Holocaust victim. Resided with family, February 1941: Vrolikstraat 66 huis, Amsterdam, Holland. Occupation: Employed through unemployment relief for the blind. 1. GRIETJE PAIS, b. 19 February 1926, Amsterdam, Holland; d. 30 September 1942, Auschwitz concentration camp, Poland - Holocaust victim. 2. ABRAHAM PAIS, b. 22 September 1928, Amsterdam, Holland; d. 29 July 1942, Auschwitz concentration camp, Poland - Holocaust victim. 3. MAURITS PAIS, b. 08 January 1932, Amsterdam, Holland; d. 29 July 1942, Auschwitz concentration camp, Poland - Holocaust victim. 4. JOSEPH PAIS, b. 30 September 1934, Amsterdam, Holland; d. 29 July 1942, Auschwitz concentration camp, Poland - Holocaust victim. SAARTJE HARTOG was born 29 May 1872 in Rotterdam, Holland, and died 29 September 1923 in Amsterdam, Holland. She married WOLF DE VRIES 11 March 1896 in Amsterdam, Holland, son of LEVIE DE VRIES and BELETJE PLUKKER. He was born 17 June 1870 in Amsterdam, Holland, and died 05 January 1938 in Amsterdam, Holland. 1. JACOB DE VRIES, b. 16 December 1896, Amsterdam, Holland; d. 02 July 1943, Sobibor death camp, Poland - Holocaust victim. 2. KLARA DE VRIES, b. 29 October 1898, Amsterdam, Holland; d. 02 April 1943, Sobibor death camp, Poland - Holocaust victim. Resided 1941: Christiaan de Wetstraat 61 III, Amsterdam, Holland. 3. ELISABETH DE VRIES, b. 20 April 1902, Amsterdam, Holland; d. 02 July 1943, Sobibor death camp, Poland - Holocaust victim. 4. MARGARETHA DE VRIES, b. 05 April 1905, Amsterdam, Holland; d. 02 July 1943, Sobibor death camp, Poland - Holocaust victim. 5. LOUIS DE VRIES, b. 13 January 1913, Amsterdam, Holland; d. 28 July 1943, Sobibor death camp, Poland - Holocaust victim; m. RACHEL DE GROOT, 02 April 1942, Amsterdam, Holland; b. 16 March 1920, Amsterdam, Holland; d. 23 July 1943, Sobibor death camp, Poland - Holocaust victim. Parents of Rachel de Groot were VICTOR DE GROOT born 28 June 1882 in Amsterdam, Holland, and died 28 May 1943 in Sobibor death camp, Poland - Holocaust victim. He married ELISABETH APPELBOOM 22 March 1906 in Amsterdam, Holland. She was born 22 October 1884 in Amsterdam, Holland, and died 28 May 1943 in Sobibor death camp, Poland - Holocaust victim. Resided with family February 1941: Transvaalstraat 86 huis, Amsterdam, Holland. Victor de Groot had seven daughters of which three survived the war. The Jokos files reveal that a claim was lodged for compensation for valuables surrendered to the Lippmann-Rosenthal looting bank (L-claim, number 4445/3754). Resided February 1941: Christiaan de Wetstraat 61 III, Amsterdam, Holland. Click form to view full size document. MARCUS HARTOG was born 28 December 1877 in Rotterdam, Holland, and died 15 January 1931 in Amsterdam, Holland. He married MARIANNE BLITS 08 September 1904 in Amsterdam, Holland, daughter of DAVID BLITS and MIRJAM KATER. She was born 20 November 1881 in Amsterdam, Holland. 1. DAVID HARTOG, b. 29 October 1905, Amsterdam, Holland; d. 31 March 1944, Central Europe, Municipality unknown - Holocaust victim. 2. CLARA HARTOG, b. 15 September 1906, Amsterdam, Holland. MIETJE HARTOG was born 02 January 1885 in Rotterdam, Holland, and died 16 September 1959 in Amsterdam, Holland. She married PHILIP BONT 17 October 1906 in Amsterdam, Holland, son of EMANUEL BONT and JUDITH FRANK. He was born 02 August 1883 in Amsterdam, Holland, and died 20 June 1947 in Enschede, Twents, Overijssel, Twente, Holland. Resided with Family February 1941: Retiefstraat 45 II, Amsterdam, Holland. 1. KLARA BONT, b. 10 August 1905, Amsterdam, Holland; d. 26 March 1944, Auschwitz concentration camp, Oswiecim Poland – Holocaust victim. Parents have survived the war. Three children living with their parents survived the war. 2. EMANUEL BONT was born 02 August 1907 in Amsterdam, Holland, and died 30 April 1944 in Auschwitz concentration camp, Oswiecim Poland – Holocaust victim. He married JEANNETTE HIRSCHEL 22 November 1939 in Arnhem, Gelderland, Holland, daughter of MACHIEL HIRSCHEL and NAATJE MESRITS. She was born 21 May 1908 in Arnhem, Holland, and died 11 February 1944 in Auschwitz concentration camp, Oswiecim Poland – Holocaust victim. Resided: Oranjelaan 5, Den Haag, Holland. Occupation: Paper products shop owner. Parents of Jeannette Hirschel were MACHIEL HIRSCHEL born 28 February 1874 in Coevorden, Holland, and died 23 July 1943 in Sobibor death camp, Poland - Holocaust victim. He married NAATJE MESRITS 19 June 1907 in Amsterdam, Holland. She was born 26 August 1881 in Meppel, Drenthe, Holland, and died 23 July 1943 in Sobibor death camp, Poland - Holocaust victim. Resided with family, May 1940: Brantsenstraat 2, Arnhem, Holland. 3. JUDITH BONT, b. 24 September 1909, Amsterdam, Holland. 4. JACOB HARTOG BONT, b. 20 January 1913, Amsterdam, Holland; d. 30 April 1945, Ebensee concentration camp, Ebensee, Austria - Holocaust victim. 5. MEIJER BONT, b. 21 May 1915, Amsterdam, Holland. 6. 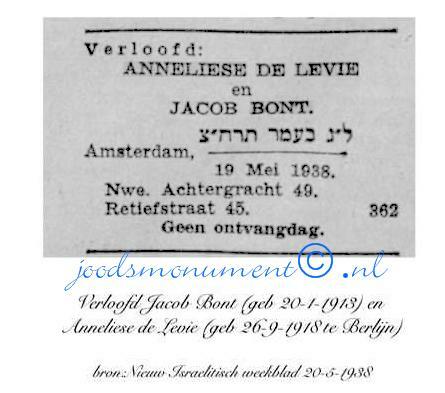 ANDRIES BONT was born 11 January 1918 in Amsterdam, Holland, and died 09 July 1943 in Sobibor death camp, Poland - Holocaust victim. He married ROSETTE MEERLOO 03 September 1942 in The Hague, Holland, daughter of MAURITS MEERLOO and MARIANNE HORST. She was born 25 February 1923 in The Hague, Holland, and died 09 July 1943 in Sobibor death camp, Poland - Holocaust victim. Resided: Zuylichemstraat 18, Den Haag, Holland. Occupation: Travelling paper products salesman. 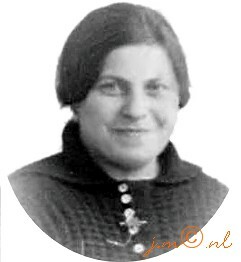 Parents of Rosette Meerloo were MAURITS MEERLOO born 04 February 1880 in The Hague, Holland, and died 14 May 1943 in Sobibor death camp, Poland - Holocaust victim. He married MARIANNE VAN DER HORST. She was born 17 June 1887 in The Hague, Holland, and died 14 July 1943 in Sobibor death camp, Poland - Holocaust victim. Resided with family April 1942: Hofwijckstraat 25, Den Haag, Holland. 7. DAVID BONT, b. 18 November 1921, Amsterdam, Holland; m. KITTY MENDELS. 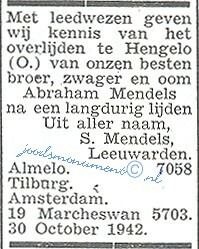 Parents of Kitty Mendels were ABRAHAM MENDELS was born 29 February 1888 in Almelo, Overijssel, Holland, and died 28 October 1942 in Hengelo, Overijssel, Holland. He married GRIETJE WOLF 22 June 1914 in Veghel, North Brabant, Holland. She was born 30 June 1885 in Uden, North Brabant, Holland, and died 11 December 1942 in Auschwitz concentration camp, Poland - Holocaust victim. Resided with family, July 1942: Krabbenbosplein 12, Hengelo, Holland. David Bont and Kitty Mendels, with baby son. 8. JUDA ELIAS BONT, b. 25 October 1924, Amsterdam, Holland; d. 22 April 1925, Amsterdam, Holland. 9. WILLY SALOMON BONT, b. 10 March 1926, Amsterdam, Holland; d. 29 June 2013, Amstelveen, Holland. HELENA HARTOG was born 02 October 1886 in Amsterdam, Holland, and died 14 September 1942 in Auschwitz concentration camp, Oswiecim Poland – Holocaust victim. She married JACOB APPELBOOM 23 October 1907 in Amsterdam, Holland, son of LEVIE APPELBOOM and SARA PINTO. He was born 29 December 1884 in Amsterdam, Holland, and died 14 September 1942 in Auschwitz concentration camp, Oswiecim Poland – Holocaust victim. Resided with family February 1941: Nieuwe Uilenburgerstraat 50 III, Amsterdam, Holland. Jacob Appelboom was married to Helena Hartog in Amsterdam on October 23, 1907. The couple had nine children: Levie (who died in 1908), Clara (who died in 1911), Andries, Isaäc, Marcus, Alexander, Juda, Selma and one child that survived the war. Belonging to: Jacob Appelboom and his family, Amsterdam. Room: floor cloth, carpet, hanging lamp, lace curtain (2), drape (2), table with cloth, chair (4), armchair (2), easy chair, divan with cover, wall clock, wall hanging, fireplace with plate, mirror, wall table lamp (2), sideboard with underwear and glasses, loudspeaker, round table with cloth, oil painting (2), iron, wall cupboard. Bedroom: floor cloth, table with cloth, cane mat, chair (2), armchair, iron bedstead with bedding, lace curtain (2), drape (2), hanging lamp, linen cupboard with whites, vacuum cleaner, wall cupboard. Bedroom: floor cloth, cane mat bedstead with bedding chair (2), ceiling lamp lace curtain (2), wall cupboard. Bedroom: floor cloth, cane mat, iron bedstead with bedding (2), lace curtain. kitchen: floor cloth, runner, mat, table with cloth, gas ring (2), kitchenware, stone objects, groceries. Corridor: floor cloth, runner, mat (3), ceiling lamp, coat hooks, wall cupboard. 1. LEVIE APPELBOOM, b. 24 September 1908, Amsterdam, Holland; d. 09 October 1908, Amsterdam, Holland. 2. CLARA APPELBOOM, b. 17 February 1910, Amsterdam, Holland; d. 08 May 1911, Amsterdam, Holland. 3. LEVIE APPELBOOM, b. 05 April 1911, Amsterdam, Holland; d. 23 March 1995, Amsterdam, Holland. 4. ANDRIES APPELBOOM, b. 11 April 1913, Amsterdam, Holland; d. 30 September 1942, Auschwitz concentration camp, Oswiecim Poland – Holocaust victim. 5. ISAAC APPELBOOM, b. 07 April 1916, Amsterdam, Holland; d. 09 July 1943, Sobibor death camp, Poland - Holocaust victim. 6. MARCUS APPELBOOM, b. 13 May 1919, Amsterdam, Holland; d. 30 September 1942, Auschwitz concentration camp, Oswiecim Poland – Holocaust victim. 7. ALEXANDER APPELBOOM, b. 14 April 1922, Amsterdam, Holland; d. 30 September 1942, Auschwitz concentration camp, Oswiecim Poland – Holocaust victim. 8. JUDA APPELBOOM, b. 24 January 1925, Amsterdam, Holland; d. 30 September 1942, Auschwitz concentration camp, Oswiecim Poland – Holocaust victim. 9. SELMA APPELBOOM, b. 04 July 1927, Amsterdam, Holland; d. 14 September 1942, Auschwitz concentration camp, Oswiecim Poland – Holocaust victim. ELIAS HARTOG was born 09 April 1889 in Amsterdam, Holland, and died 02 November 1942 in Auschwitz concentration camp, Oswiecim Poland – Holocaust victim. He married ESTHER BLITS 27 October 1920 in Amsterdam, Holland, daughter of BENJAMIN BLITS and VOGELTJE SPEIJER. She was born 28 May 1890 in Amsterdam, Holland, and died 02 November 1942 in Auschwitz concentration camp, Oswiecim Poland – Holocaust victim. Resided with Family February 1941: Graaf Florisstraat 27 II, Amsterdam, Holland. 1. CLARA MARIA HARTOG, b. 20 January 1922, Tjepoe Blora, Indonesia; d. 02 November 1942, Auschwitz concentration camp, Oswiecim Poland – Holocaust victim. 2. FRIEDA MARIANNA HARTOG, b. 10 October 1927, Pladjoe, Sumatra, Indonesia; d. 02 November 1942, Auschwitz concentration camp, Oswiecim Poland – Holocaust victim. EVA HARTOG was born 03 April 1890 in Amsterdam, Holland. She married ALEXANDER SLUIJTER 13 November 1913 in Amsterdam, Holland, son of MATTHIJS SLUIJTER and ESTHER BLOG. He was born 06 October 1879 in Arnhem, Gelderland, Holland. 2. SLUIJTER, b. 24 October 1914. 3. BEATRICE SLUIJTER, b. 22 August 1917, Modjokerto, Indonesia. BETJE HARTOG was born 03 October 1895 in Amsterdam, Holland, and died 13 March 1943 in Sobibor death camp, Poland - Holocaust victim. She married ISAAC SANTILHANO 24 February 1915 in Amsterdam, Holland, son of JACOB SANTILHANO and ELISABETH STOKKING. He was born 15 May 1893 in Amsterdam, Holland, and died 13 March 1943 in Sobibor death camp, Poland - Holocaust victim. Resided with family, February 1941: Eerste Sweelinckstraat 18 huis, Amsterdam, Holland. Isaac Santilhano was a removal contractor and had a storage behind his house. His furniture van read 'Verhuizingen De Jong'. Parents of Isaac Santilhano were JACOB SANTILHANO born 22 November 1865 in Spitalfields, London E1, England, and died 05 February 1943 in Auschwitz concentration camp - Holocaust victim. He married ELISABETH STOKKING 17 June 1891 in Amsterdam, Holland, daughter of ISAAC STOKKING and SARA SANTILHANO. She was born 28 May 1864 in Amsterdam, Holland, and died 05 February 1943 in Auschwitz concentration camp - Holocaust victim. Resided with wife, February 1941: Zandstraat 42 I, Amsterdam, Holland. 1. ELISABETH SANTILHANO, b. 20 August 1915, Amsterdam, Holland; d. 13 March 1943, Sobibor death camp, Poland - Holocaust victim. 2. JACOB SANTILHANO, b. 11 August 1918, Amsterdam, Holland; d. 09 July 1943, Sobibor death camp, Poland - Holocaust victim. Jacob Santilhano went into hiding in Dordrecht. 3. SARA SANTILHANO was born 01 February 1922 in Amsterdam, Holland, and died 30 September 1942 in Auschwitz concentration camp - Holocaust victim. She married LEENDERT PHILIP DE JONG 24 July 1942 in Amsterdam, Holland, son of ABRAHAM DE JONG and SARA POP. He was born 14 July 1917 in Amsterdam, Holland, and died 30 September 1942 in Blechhammer: Sub-camp of Auschwitz III - Monowitz, Poland - Holocaust victim. The parents of Leendert Philip de Jong were ABRAHAM DE JONG born 09 October 1878 in Amsterdam, Holland, and died 15 October 1942 in Auschwitz concentration camp, Oswiecim Poland – Holocaust victim. He married SARA POP 18 August 1910 in Amsterdam, Holland. She was born 21 May 1886 in Amsterdam, Holland, and died 15 October 1942 in Auschwitz concentration camp, Oswiecim Poland – Holocaust victim. Resided with family, February 1941: Krugerstraat 29 II, Amsterdam, Holland. Sara, also known as Sientje, Santilhano worked as a saleslady in a clothes-shop in the Kalverstraat, Amsterdam. 4. CLARA SANTILHANO, b. 16 November 1928, Amsterdam, Holland; d. 13 March 1943, Sobibor death camp, Poland - Holocaust victim. 5. ALEXANDER SANTILHANO, b. 02 May 1931, Amsterdam, Holland; d. 13 March 1943, Sobibor death camp, Poland - Holocaust victim. MARCUS DE HAAN was born 04 November 1881 in Rotterdam, Holland, and died 14 May 1943 in Sobibor death camp, Poland - Holocaust victim. He married ELIZABETH PARK 20 December 1905 in Rotterdam, Holland, daughter of JOZEF PARK and SARA POLAK. She was born 28 November 1883 in Rotterdam, Holland, and died 14 May 1943 in Sobibor death camp, Poland - Holocaust victim. Resided with family, April 1942: Bierstraat 20 a, Den Haag, Holland. 1. JOZEPH DE HAAN, b. 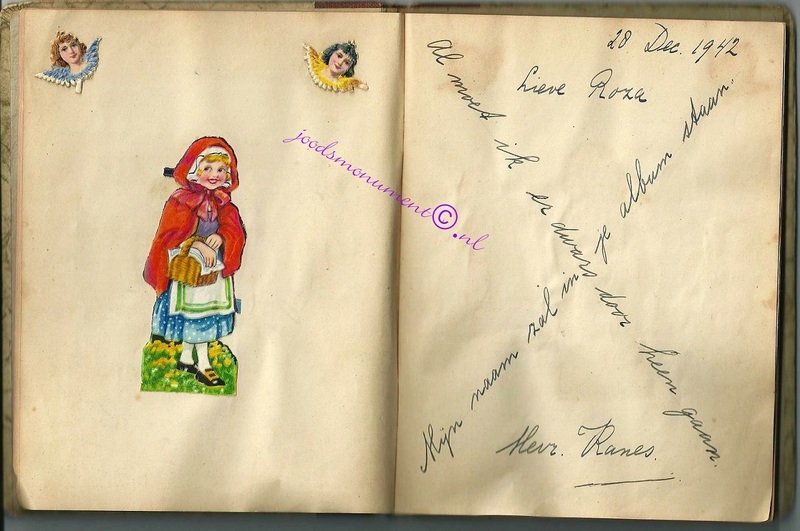 09 April 1906, Breda, Holland; d. 10 May 1940, Loosduinen, Holland. is in the building of the States-General in The Hague. During May 10 to May 12, 1940, Ockenburg, a small Dutch auxiliary airfield near The Hague, was the scene of bitter fighting between German airborne forces and Dutch defenders during World War II. A German formation of one airborne company of Fallschirmjaeger Regiment 2 and a battalion of Air landing troops of IR.65 (22.ID) was envisaged to take the small Air Force Base (AFB) by surprise attack. The strike was part of the grand strategy to seize the Dutch city of the Hague, where the Dutch Royal Family, Cabinet and Military headquarters were situated. The German battle-plan incorporated large combined airborne and airlanding elements to land at the large Dutch AFB's at Valkenburg (South Holland) and Ypenburg and a smaller party at Ockenburg. These three AFB's were situated east, south and west of the Hague. Around 8,000 Germans were scheduled to land and march onto the Hague, snatching the Dutch Royal Family and beheading the Dutch military by capturing their command-centres. The German air-operation against the Hague failed utterly. At Ypenburg AFB the German airborne battalion and follow-up air landing units initially gained some successes, but they were rapidly pushed into defence. Many were captured or killed. Some hundreds managed to sustain Dutch counter-attacks isolating themselves in the hamlet Overschie. At Valkenburg the Germans first managed to seize the airfield running the Dutch defenders off. But after re-grouping the Dutch countered the German pocket and pushed the about 1,000 men strong German presence into a tight defence in the village Valkenburg itself. The Dutch wouldn't manage to force the surviving Germans into surrender though. The landing at Ockenburg too resulted in initial German seizure of the AFB during which 25 Dutch defenders were KIA. But within short the German landing party - no more than around 400 men - were driven off of the pitch and pushed into the dune area between the AFB and the North Sea. In a daring attempt to break out during the following days, the German force (led by the commander of 22.ID, Lieutenant General Hans Graf von Sponeck himself) managed to outmanoeuvre quite substantial Dutch formations and eventually reach the German held pocket at the hamlet Overschie. At that position a combined remnant force of around 1,000 German invaders managed to hold out until being relieved by German ground-forces in the evening of May 14, 1940, after the Rotterdam Blitz. The German offensive against the Hague constituted a considerable tactical loss to the Germans. The operational goal was not achieved, notwithstanding the fact that large Dutch formations had been tied around the German pockets for quite some time. Formations that thus could not be assigned other tasks. The Dutch lost 29 men KIA during the AFB defensive battle and the following skirmishes. Another 41 men were lost in counter-offensive actions that saw the Dutch regain the airfield, but that failed to mop-up the German main force who on their turn managed to rebuff Dutch attempts to overrun their elevated dune positions. As such a total toll of 70 men KIA. Besides a material loss of a handful of modern airplanes that had been destroyed on the airfield during the siege. The Germans lost 52 men in the battle for Ockenburg, including 8 men Luftwaffe personnel. An unknown number was taken prisoner and shipped to Scheveningen and from there on to Ymuiden, from where on 13 and 14 May 1940 ships managed to reach the United Kingdom. The Luftwaffe lost around 250 airplanes in the area of the Hague, 500 men KIA and about 1,250 airbornes, air-landing troops and Luftwaffe personnel being evacuated as POW's to the United Kingdom on 14 May 1940. Those were lost to the German cause for the duration of the war. That event outraged Hermann Göring when he got word of it. He had several Dutch officers arrested and interrogated on the matter. In the end, on the scale of things, the German losses were obviously painful but not much more than that. 2. SARA DE HAAN, b. 27 April 1907, Rotterdam, Holland; d. 30 September 1942, Auschwitz concentration camp - Holocaust victim. 3. 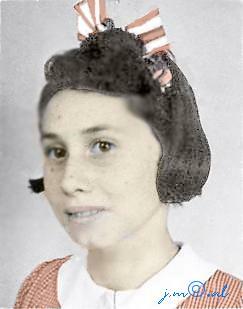 FRANCINA DE HAAN was born 16 June 1910 in Rotterdam, Holland, and died 09 July 1943 in Sobibor death camp, Poland - Holocaust victim. She married JOSEPH VAN HACHGENBERG, son of MOZES VAN HACHGENBERG and TRIJNTJE COHEN. 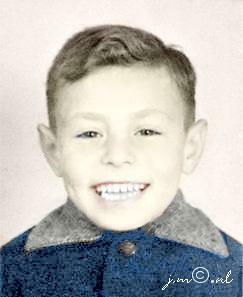 He was born 23 April 1916 in Rotterdam, Holland, and died 09 July 1943 in Sobibor death camp, Poland - Holocaust victim. Parents of Joseph van Hachgenberg were MOZES VAN HACHGENBERG born 22 November 1891 in Rotterdam, Holland, and died 31 August 1943 in Central Europe, Municipality unknown - Holocaust victim. He married TRIJNTJE COHEN 28 July 1915 in Rotterdam, Holland. She was born 31 March 1896 in Groningen, Holland, and died 08 October 1942 in Auschwitz concentration camp - Holocaust victim. Resided with family, April 1942: Van Bassenstraat 101, Den Haag, Holland. Resided with wife, April 1942: Van Bassenstraat 74, Den Haag, Holland. 4. EMMY DE HAAN, b. 16 April 1926, The Hague, Holland; d. 30 September 1942, Auschwitz concentration camp - Holocaust victim. 5. KITTY DE HAAN, b. 21 June 1927, The Hague, Holland; d. 14 May 1943, Sobibor death camp, Poland - Holocaust victim. MOZES DE HAAN was born 18 November 1883 in Rotterdam, Holland, and died 25 March 1932 in Rotterdam, Holland. He married KAATJE BIERSCHENK 31 January 1906 in Rotterdam, Holland, daughter of JACOB BIERSCHENK and AALTJE BOAS. 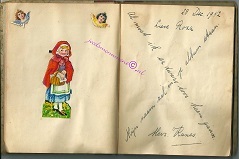 She was born 25 March 1883 in Tiel, Gelderland, Holland, and died 24 June 1963 in Wassenaar, Holland. Burial: Joodse begraafplaats, metaheerhuis, 36 Louisestraat Wassenaar, Holland. 1. SAMUEL DE HAAN, m. CATHARINA JONK. 2. JOSEPH DE HAAN, b. 14 August 1906, Rotterdam, Holland. 3. AALTJE DE HAAN, b. 07 December 1907, Rotterdam, Holland; m. PIETER ADRIANUS MINK, 19 June 1929, Rotterdam, Holland; b. 07 October 1905, Rotterdam, Holland. 4. MARCUS DE HAAN, b. 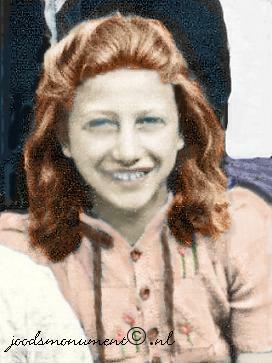 05 July 1909, Rotterdam, Holland; d. 31 October 1943, Schoppinitz, Katowice, Poland - Holocaust victim. MICHEL DE HAAN was born 11 August 1887 in Rotterdam, Holland, and died 28 September 1942 in Auschwitz concentration camp - Holocaust victim. He married (1) JUDITH POSENER 10 October 1918 in Zaandam, Zaanstad, Holland, daughter of ABRAHAM POSENER and DEBORA GERRITSE. She was born 22 June 1884 in Amsterdam, Holland, and died 16 June 1941 in Amsterdam, Holland. He married (2) CLARA BRIL 18 February 1942 in Amsterdam, Holland, daughter of DAVID BRIL and KLAARTJE DEGEN. She was born 30 June 1894 in Amsterdam, Holland, and died 28 September 1942 in Auschwitz concentration camp - Holocaust victim. Resided: Blasiusstraat 71 I, Amsterdam, Holland. 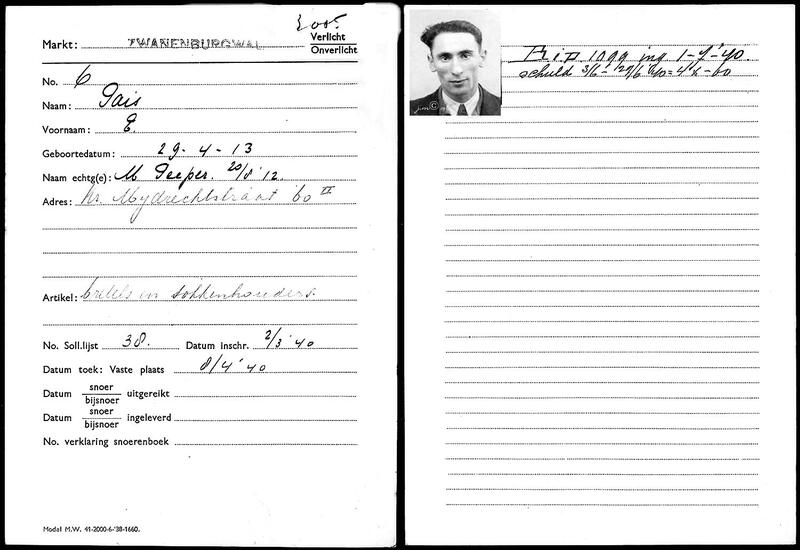 Burial: 18 June 1941, Dieman Cemetary, Amsterdam, Holland. Parents of Judith Posener were ABRAHAM POSENER born 29 April 1859 in Amsterdam, Holland, and died 16 December 1892 in Amsterdam, Holland. He married DEBORA GERRITSE 12 June 1878 in Amsterdam, Holland. She was born 06 December 1860 in Amsterdam, Holland, and died 13 March 1943 in Sobibor death camp, Poland - Holocaust victim. Parents of Clara Bril were DAVID BRIL born 23 March 1866 in Amsterdam, Holland, and died 26 December 1906 in Bloemendaal, Holland. He married KLAARTJE DEGEN 22 August 1888 in Amsterdam, Holland. She was born 19 December 1868 in Amsterdam, Holland, and died 19 November 1943 in Auschwitz concentration camp - Holocaust victim. Resided with family, May 1940: Ben Viljoenstraat 12 huis & I, Amsterdam, Holland. Klaartje Degen was a daughter of Machiel Degen and Klara Engelander. She married in Amsterdam on 22 August 1888 to David Bril, who passed away on 26 December 1906. The couple had six children, among them Joseph Bril, who lived at another address during the war and who was married to Angelica Rebecca Wortelboer. 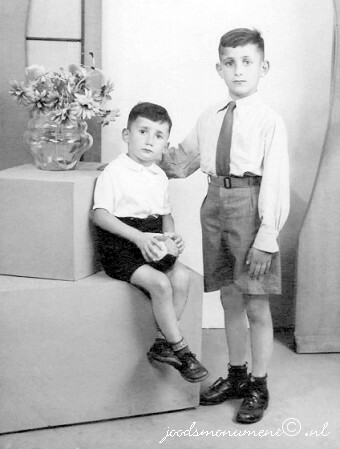 Two other childeren, Gonad and Barend, have survived the Holocaust. Barend's wife however, Christina Hijman, together with three of her children, did not survive the war. According to a list with shops of Jewish owners, compiled by the Amsterdam police in 1940, this family had a grocery store, address: Ben Viljoenstraat 12 in Amsterdam. 1. ABRAHAM DE HAAN, b. 20 August 1919, Amsterdam, Holland; d. 23 August 1944, Blechhammer: Sub-camp of Auschwitz III - Monowitz, Poland - Holocaust victim. ANDRIES DE HAAN was born 07 March 1890 in Rotterdam, Holland, and died 28 May 1943 in Sobibor death camp, Poland - Holocaust victim. He married JUDIK ROODENBURG 06 November 1912 in Rotterdam, Holland, daughter of ISAAC ROODENBURG and SUSANNA SANDERS. She was born 30 April 1892 in Rotterdam, Holland, and died 28 May 1943 in Sobibor death camp, Poland - Holocaust victim. Parents of Judik Roodenburg were ISAAC ROODENBURG born 02 November 1851 in Amsterdam, Holland, and died 01 March 1909 in Rotterdam, Holland. He married SUSANNA SANDERS 10 November 1880 in Rotterdam, Holland. She was born 26 June 1860 in Rotterdam, Holland, and died 23 April 1943 in Sobibor death camp, Poland - Holocaust victim. 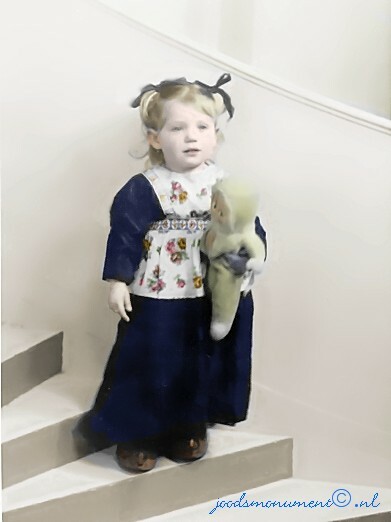 Resided with family, April 1942: Jan Porcellisstraat, Rotterdam, Holland. 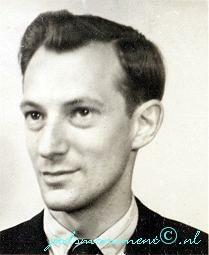 Resided with family, April 1942: Jan Blankenstraat 58, Den Haag, Holland. 1. FRANCINA DE HAAN, b. 07 April 1913, Amsterdam, Holland; d. 28 May 1943, Sobibor death camp, Poland - Holocaust victim. Resided, April 1942: Jan Blankenstraat 58, Den Haag, Holland. 2. ISAAC DE HAAN, b. 30 March 1914, Rotterdam, Holland; d. 01 January 1943, Auschwitz concentration camp - Holocaust victim. 3. SUSANNA DE HAAN, b. 04 February 1919, Rotterdam, Holland. 4. EVA DE HAAN, b. 26 September 1921, Rotterdam, Holland; d. 28 May 1943, Sobibor death camp, Poland - Holocaust victim. 5. FIETJE DE HAAN, b. 25 March 1925, Rotterdam, Holland; d. 28 May 1943, Sobibor death camp, Poland - Holocaust victim. ELIAS DE HAAN was born 06 May 1895 in Rotterdam, Holland, and died 28 February 1943 in Auschwitz concentration camp - Holocaust victim. He married ROSETTE BUSNACH 24 May 1917 in Amsterdam, Holland, daughter of MICHAEL BUSNACH and MARIA KROONENBURG. She was born 10 May 1894 in Amsterdam, Holland, and died 28 May 1943 in Sobibor death camp, Poland - Holocaust victim. Resided with family, May 1940: Diamantstraat 21 III, Amsterdam, Holland. 1. JOSEPH DE HAAN, b. 14 September 1917, Amsterdam, Holland; d. 30 September 1942, Auschwitz concentration camp - Holocaust victim. 2. FRANCINA DE HAAN, b. 10 July 1920, Amsterdam, Holland; d. 28 May 1943, Sobibor death camp, Poland - Holocaust victim. 3. MARIA JUDITH DE HAAN, b. 19 September 1929, Amsterdam, Holland; d. 28 May 1943, Sobibor death camp, Poland - Holocaust victim. 4. MICHEL DE HAAN, b. 29 July 1933, Amsterdam, Holland; d. 28 May 1943, Sobibor death camp, Poland - Holocaust victim. EVA DE HAAN was born 20 September 1897 in Rotterdam, Holland, and died 28 May 1943 in Sobibor death camp, Poland - Holocaust victim. She married JUDA KLEEREKOOPER 11 June 1919 in Zaandam, Zaanstad, Holland, son of ISAAC KLEEREKOOPER and SARA VAN BEVER. He was born 01 October 1892 in Amsterdam, Holland, and died 28 May 1943 in Sobibor death camp, Poland - Holocaust victim. Resided with family, February 1941: Sint Antoniesbreestraat 39 II, Amsterdam, Holland. Juda Kleerekooper was the uncle of Isaäc Reiss. Juda worked at the forwarding of S.H. Reiss BV Woollen and Silks Company. Belonging to: Juda Kleerekooper and his family, Amsterdam, Holland. 1. IZAK (JONGE) KLEEREKOOPER, b. 04 December 1919, Amsterdam, Holland; d. 31 January 1944, Auschwitz concentration camp - Holocaust victim; m. ANNA HARINGMAN, 20 July 1942, Amsterdam, Holland; b. 28 July 1919, Amsterdam, Holland; d. 31 January 1944, Auschwitz concentration camp - Holocaust victim. Parents of Anna Haringman were SIMON HARINGMAN born 16 March 1880 in Amsterdam, Holland, and died 05 October 1942 in Auschwitz concentration camp - Holocaust victim. He married JANSJE VAN BEEN 27 March 1913 in Zaandam, Zaanstad, Holland. She was born 01 December 1888 in Rotterdam, Holland, and died 05 October 1942 in Auschwitz concentration camp - Holocaust victim. Resided with family, February 1941: Tilanusstraat 31 II, Amsterdam, Holland. 2. JO KLEEREKOOPER, b. 07 March 1935, Amsterdam, Holland; d. 28 May 1943, Sobibor death camp, Poland - Holocaust victim. SAARTJE DE HAAN was born 07 February 1903 in Rotterdam, Holland, and died 30 September 1942 in Auschwitz concentration camp - Holocaust victim. She married MEIJER MEIJER 12 March 1925 in Amsterdam, Holland, son of HARTOG MEIJER and REBECCA NORT. He was born 07 February 1903 in Amsterdam, Holland, and died 30 September 1942 in Auschwitz concentration camp - Holocaust victim. Resided with family, February 1941: Tilanusstraat 53 II, Amsterdam, Holland. Meijer was one of four brothers of whom two survived the war. 1. 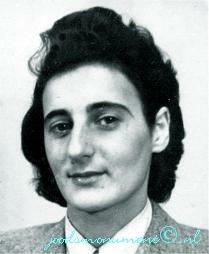 FRANCINA (FRANSJE) MEIJER, b. 26 July 1925, Amsterdam, Holland; d. 30 September 1942, Auschwitz concentration camp - Holocaust victim. BARDINA DE VRIES was born 28 December 1883 in Amsterdam, Holland, and died 30 April 1943 in Sobibor death camp, Poland - Holocaust victim. She married JESAIAS VAN BEVER 17 August 1904 in Amsterdam, Holland, son of BAREND VAN BEVER and MARIANNE PEEPER. He was born 18 February 1881 in Amsterdam, Holland, and died 09 December 1935 in Amsterdam, Holland. Resided: Waalstraat 141 II, Amsterdam, Holland. 1. MARIANNA VAN BEVER, b. 29 July 1905, Amsterdam, Holland. SARA DE VRIES was born 17 November 1885 in Amsterdam, Holland, and died 12 February 1943 in Auschwitz concentration camp - Holocaust victim. She married ISAAC HARTOG, son of JOSEPH HARTOG and MATJE GRISHAVER. He died 15 July 1937. 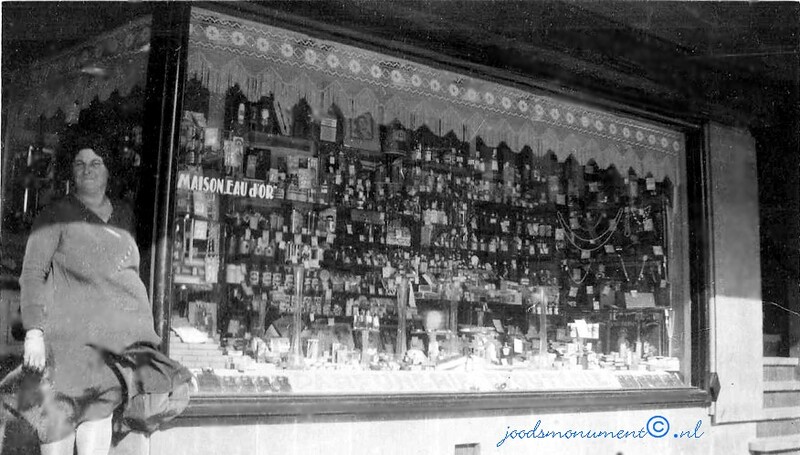 Isaac and his wife, Sara, ran a perfume shop named "Maison Eau d'Or" at Linnaeusstraat 213 in Amsterdam. The couple had only one son: Joseph and after the death of her husband, Sara moved to the address of the family of her son. 1. JOSEPH HARTOG, b. 26 December 1909, Amsterdam, Holland; d. 01 December 1943, Auschwitz concentration camp - Holocaust victim. JOHANNA DE VRIES was born 06 February 1888 in Amsterdam, Holland, and died 05 February 1943 in Auschwitz concentration camp - Holocaust victim. She married JOACHIM KANES 04 March 1914 in Amsterdam, Holland, son of ISRAEL KANES and SARA ITALIANER. He was born 02 July 1887 in Amsterdam, Holland. Resided with family, February 1941: Waalstraat 140 I, Amsterdam, Holland. 2. ISRAEL KANES, b. 29 July 1915, Amsterdam, Holland; d. 02 August 1915, Amsterdam, Holland. 3. LENA KANES, b. 18 February 1917, Amsterdam, Holland; d. 31 January 1944, Auschwitz concentration camp - Holocaust victim. KLARA DE VRIES was born 29 October 1889 in Purmerend, Holland, and died 28 May 1943 in Sobibor death camp, Poland - Holocaust victim. She married ABRAHAM LAKMAKER 11 January 1912 in Amsterdam, Holland, son of GERRIT LAKMAKER and SARA GROEN. He was born 07 November 1889 in Amsterdam, Holland, and died 28 May 1943 in Sobibor death camp, Poland - Holocaust victim. Resided with family, February 1941: Pieter Lod. Takstraat 15 I, Amsterdam, Holland. 1. SARA LAKMAKER, b. 04 November 1912, Amsterdam, Holland; d. 03 December 1966, Amsterdam, Holland; m. HENDRIK FREDERIK NIKKELSBURG, 05 February 1936, Amsterdam, Holland; b. 17 January 1911, Amsterdam, Holland. MOZES DE VRIES was born 16 November 1891 in Purmerend, Holland, and died 31 March 1944 in Central Europe, Municipality unknown - Holocaust victim. He married (1) EVA WAGENHUIZEN 17 May 1916 in Amsterdam, Holland, daughter of JOEL WAGENHUIZEN and MARIA LAMPETJE. She was born 08 September 1896 in Amsterdam, Holland, and died 31 January 1918 in Amsterdam, Holland. He married (2) SARA PRONT 18 February 1920 in Amsterdam, Holland, daughter of DANIEL PRONT and MARIANNE RIJKSMAN. She was born 07 January 1885 in Amsterdam, Holland, and died 17 February 1938 in Amsterdam, Holland. He married (3) FIJTJE VOGEL 16 November 1938 in Amsterdam, Holland, daughter of LEVIE VOGEL and KEETJE VLEESCHHOUWER. She was born 01 April 1893 in Amsterdam, Holland, and died 19 October 1942 in Auschwitz concentration camp - Holocaust victim. Resided with family, February 1941: Ingogostraat 4 huis, Amsterdam, Holland. Belonging to: Mozes de Vries and his family, Amsterdam, Holland. The Jokos file reveals that a claim was lodged for compensation for valuables surrendered to the Lippmann-Rosenthal looting bank (L-claim, number 12483/15899). 1. MACHIEL DE VRIES, b. 08 November 1917, Amsterdam, Holland; d. 31 March 1944, Central Europe, Municipality unknown - Holocaust victim. Machiel de Vries joined the Hollandia-Kattenburg textile factory in Amsterdam on 23 June 1941. On Wednesday, 11 November 1942, around 4:30 PM, Willy Lages conducted the Sicherheitspolizei raid on the Hollandia factories. All exits were blocked and the Jewish staff members were taken away that evening. Photographs of all workers taken away that evening, as well as those deported previously, appear in the 'Boek der tranen' [Book of tears]. 1. MARCUS DE VRIES was born 28 January 1921 in Amsterdam, Holland, and died 31 March 1944 in Central Europe, Municipality unknown - Holocaust victim. He married HENRIETTE VAN STAVEREN 28 January 1942 in Amsterdam, Holland, daughter of SAMUEL VAN STAVEREN and HELENA VAN EMRIK. She was born 17 June 1922 in Antwerp, Flemish Region, Belgium, and died 22 October 1943 in Auschwitz concentration camp - Holocaust victim. Parents of Henriette van Staveren were SAMUEL VAN STAVEREN born 26 October 1894 in Amsterdam, Holland, and died 31 March 1944 in Poland. He married HELENA VAN EMRIK 25 November 1919 in Antwerp, Flemish Region, Belgium. She was born 11 February 1896 in Antwerp, Flemish Region, Belgium, and died 22 October 1943 in Auschwitz concentration camp - Holocaust victim. Resided with family, February 1941: Retiefstraat 55 huis, Amsterdam, Holland. 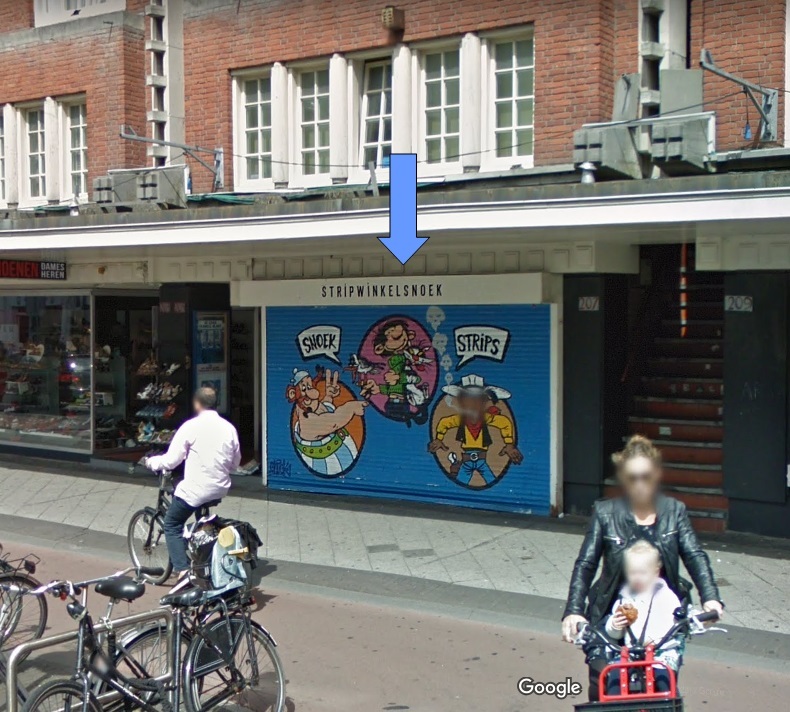 According to a list with shops of Jewish owners, compiled by the Amsterdam police in 1940, Samuel van Staveren and and his wife had a cigar shop, address: Retiefstraat 55 in Amsterdam. The Jokos file reveals that a claim was lodged for compensation for valuables surrendered to the Lippmann-Rosenthal looting bank (L-claim, number 16). Belonging to: Marcus de Vriesand his family, Amsterdam, Holland. 2. MARIANNA DE VRIES, b. 14 August 1924, Amsterdam, Holland; d. 30 September 1942, Auschwitz concentration camp - Holocaust victim. EVA DE VRIES was born 13 July 1893 in Amsterdam, Holland, and died 07 September 1942 in Auschwitz concentration camp, Poland - Holocaust victim. She married EDUARD SCHEFFER 23 October 1919 in Amsterdam, Holland, son of ELIAS SCHEFFER and BETJE BRIL. He was born 13 December 1893 in Amsterdam, Holland, and died 31 March 1944 in Central Europe, Municipality unknown - Holocaust victim. Resided with family, February 1941:Transvaalplein 8 boven, Amsterdam, Holland. Parents of Eduard Scheffer were ELIAS (ELIE) SCHEFFER born 21 February 1862 in Amsterdam, Holland, and died 28 September 1942 in Auschwitz concentration camp, Poland - Holocaust victim. He married BETJE BRIL 23 October 1919 in Amsterdam, Holland. She was born 13 March 1861 in Amsterdam, Holland, and died 08 March 1936 in Amsterdam, Holland. Resided: Waterlooplein 74, Amsterdam, Holland. Belonging to: Eduard Scheffer and his family, Amsterdam. Room: hanging lamp, curtain (4), floor cloth, carpet, runner, mat, table with cloth, chair (4), armchair (2), wall plate (4), wall plate (2), vase (2), clock, stove with plate. Room: hanging lamp, lace curtain and drape (2), floor cloth, runner (2), chair (3), divan, table, child seat, wooden bedstead with bedding and blanket, linen cupboard, linen cupboard with mirror, wall cupboard. Room: lace curtain and drape (2), hanging lamp, linoleum, iron bedstead with mattresses, rack, chair (2), cushion (2), writing desk, mirror, wall plate, wall cupboard. Room: linoleum, hanging lamp, chair, tailor's table, tailor's sewing machine, electric iron, mending patches, hassock. Attic: shower, zinc tub (2), chair (2), drying rack, coal-box, curtain, carpet, mirror, loudspeaker, table, laundry, coal (0.5 sack), base unit of sewing machine, worthless items, wash boiler, runner (2). Kitchen and veranda: hanging lamp, curtain (2), floor cloth, runner, foot mat, gas ring, chair, table, pot, pan, dinner set, cutlery, mirror, bucket, cleaning things, sewing things. Staircase and corridor: coconut runner with rods (2), runner, floor cloth, foot mat, coat hooks, clothing. 1. BETTY SCHEFFER, b. 17 June 1925, Amsterdam, Holland; d. 07 September 1942, Auschwitz concentration camp, Poland - Holocaust victim. MARCUS DE VRIES was born 07 October 1895 in Amsterdam, Holland, and died 31 October 1943 in Schoppinitz, Katowice, Poland - Holocaust victim. He married ROSALINA SOESAN 23 May 1918 in Zaandam, Holland, daughter of SIMON SOESAN and EVA BETEL. She was born 20 February 1891 in Amsterdam, Holland, and died 05 October 1942 in Auschwitz concentration camp, Oswiecim Poland – Holocaust victim. DINA DE VRIES was born 26 August 1899 in Amsterdam, Holland, and died 02 July 1943 in Sobibor death camp, Poland - Holocaust victim. She married HIJMAN PHILIP DE GOEDE 03 June 1925 in Amsterdam, Holland, son of PHILIP DE GOEDE and BETJE TERTAAS. He was born 20 January 1903 in Amsterdam, Holland, and died 02 July 1943 in Sobibor death camp, Poland - Holocaust victim. Resided with family, February 1941: Tilanusstraat 50 I, Amsterdam, Holland. Parents of Hijman de Goede were PHILIP DE GOEDE born 29 April 1871 in Amsterdam, Holland, and died 05 March 1943 in Sobibor death camp, Poland - Holocaust victim. He married BETJE TERTAAS 09 January 1892 in Amsterdam, Holland. 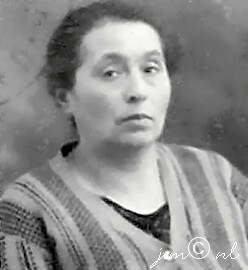 She was born 20 July 1872 in Amsterdam, Holland, and died 05 March 1943 in Sobibor death camp, Poland - Holocaust victim. Resided with family, 1 February 1941: Tilanusstraat 50 I, Amsterdam, Holland. 1. BEPPY DE GOEDE, b. 01 March 1927, Amsterdam, Holland; d. 02 July 1943, Sobibor death camp, Poland - Holocaust victim. 2. MACHIEL DE GOEDE, b. 18 July 1937, Amsterdam, Holland; d. 02 July 1943, Sobibor death camp, Poland - Holocaust victim. ROOSJE DE HAAN was born 23 February 1897 in Amsterdam, Holland, and died 10 September 1943 in Auschwitz concentration camp, Oswiecim Poland – Holocaust victim. She married ISAAC VREELAND 06 June 1918 in Zaandam, Holland, son of DAVID VREELAND and JANSJE PRONT. He was born 13 April 1893 in Amsterdam, Holland. Husband had survived the war Two children living with their parents survived the war. Resided with family February 1941: Amstellaan 81 I, Amsterdam, Holland. Parents of Isaac Vreeland were DAVID VREELAND born 26 October 1863 in Amsterdam, Holland, and died 04 April 1940 in Amsterdam, Holland. He married JANSJE PRONT 27 March 1889 in Amsterdam, Holland. She was born 19 June 1866 in Amsterdam, Holland, and died 14 May 1943 in Sobibor death camp, Poland - Holocaust victim. Resided February 1941: Jan Lievensstraat 44 huis, Amsterdam, Holland. 1. EVA VREELAND, b. 25 September 1918, Amsterdam, Holland; d. 10 September 1943, Auschwitz concentration camp, Oswiecim Poland – Holocaust victim. 2. ELLIJ VREELAND, b. 17 July 1920, Amsterdam, Holland; d. 10 September 1943, Auschwitz concentration camp, Oswiecim Poland – Holocaust victim. 3. JACQUELINE VREELAND, b. 10 January 1933, Amsterdam, Holland; d. 10 September 1943, Auschwitz concentration camp, Oswiecim Poland – Holocaust victim. MARCUS DE HAAN was born 19 August 1904 in Amsterdam, Holland, and died 01 July 1943 in Sobibor death camp, Poland - Holocaust victim. He married MARIA ANNA RENÉE HOEDEMAKER 28 February 1929, daughter of HENRI HOEDEMAKER and HENRIETTE POLAK. 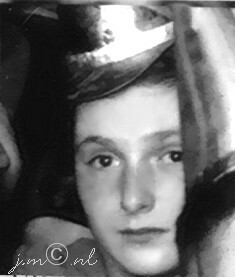 She was born 17 July 1907 in Hilversum, Holland, and died 01 July 1943 in Sobibor death camp, Poland - Holocaust victim. Resided: Olympiakade 27 I, Amsterdam, Holland. 1. ELIAS DE HAAN, b. 30 April 1930, Amsterdam, Holland; d. 01 July 1943, Sobibor death camp, Poland - Holocaust victim. 2. HENRIETTE DE HAAN, b. 23 March 1935, Amsterdam, Holland; d. 01 July 1943, Sobibor death camp, Poland - Holocaust victim. ANNA BOAS was born 12 April 1909 in Amsterdam, Holland, and died 16 July 1943 in Sobibor death camp, Poland - Holocaust victim. She married ISAAC POLAK 02 May 1928 in Amsterdam, Holland, son of DAVID POLAK and RACHEL VAN WEST. He was born 11 February 1907 in Amsterdam, Holland, and died 16 July 1943 in Sobibor death camp, Poland - Holocaust victim. Resided with family, February 1941: Vaalrivierstraat 5 huis, Amsterdam, Holland. Parents of Isaac Polak were DAVID POLAK was born 18 April 1883 in Amsterdam, Holland, and died 19 October 1942 in Auschwitz concentration camp, Poland - Holocaust victim. He married RACHEL VAN WEST 05 April 1905 in Amsterdam, Holland. She was born 01 May 1885 in Amsterdam, Holland, and died 14 August 1949 in Amsterdam, Holland. Resided with family, February 1941: Krugerstraat 27 III, Amsterdam, Holland. David Polak and Rachel van West had two children. 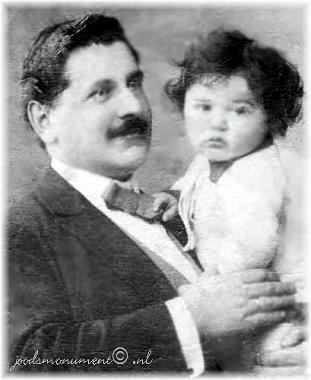 Isaac and EVA POLAK, b. 03 October 1912, Amsterdam, Holland; d. 30 September 1942, Auschwitz concentration camp, Poland - Holocaust victim. Eva Polak joined the Hollandia-Kattenburg textile factory in Amsterdam on 28 August 1936. On Wednesday, 11 November 1942, around 4:30 PM, Willy Lages conducted the Sicherheitspolizei raid on the Hollandia factories. All exits were blocked, and the Jewish staff members were taken away that evening. Photographs of all workers taken away that evening, as well as those deported previously, appear in the 'Boek der tranen' [Book of tears]. The Jokos files reveal that a claim was lodged for compensation for valuables surrendered to the Lippmann-Rosenthal looting bank (L-claim, number 1). Willy Paul Franz Lages (October 5, 1901 – April 2, 1971) was the German Nazi commander of the Sicherheitsdienst in Amsterdam during the Second World War. 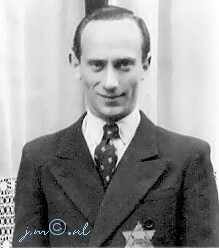 From March 1941 he led the so-called Zentralstelle für jüdische Auswanderung (Central Bureau for the Jewish Emigration). As such he was responsible for the deportation of Dutch Jews to the concentration camps in Germany and occupied Poland. 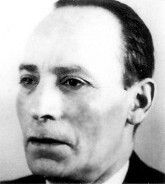 After the war, Willy Lages was sentenced in Holland to life imprisonment. 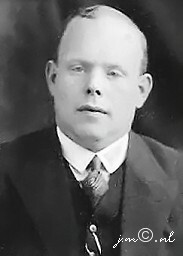 He was incarcerated in Breda, along with Joseph Kotälla, Ferdinand aus der Fünten and Franz Fischer (the "Vier van Breda"/"The Breda Four" group). In 1966 Lages was released from prison for humanitarian reasons as he appeared to be seriously ill. The decision taken by the minister of justice, Ivo Samkalden, provoked a public outcry. Lages received medical treatment in Germany after which he survived for another five years. 1. RACHEL POLAK, b. 05 September 1928, Amsterdam, Holland; d. 16 July 1943, Sobibor death camp, Poland - Holocaust victim. 2. ELIAS POLAK, b. 21 April 1930, Amsterdam, Holland; d. 16 July 1943, Sobibor death camp, Poland - Holocaust victim. 3. BETTY POLAK, b. 11 October 1932, Amsterdam, Holland; d. 16 July 1943, Sobibor death camp, Poland - Holocaust victim. 4. DAVID POLAK, b. 06 March 1936, Amsterdam, Holland; d. 16 July 1943, Sobibor death camp, Poland - Holocaust victim. EVA BOAS was born 07 June 1910 in Amsterdam, Holland, and died 09 April 1943 in Sobibor death camp, Poland - Holocaust victim. She married EMANUEL DE VALENCA 14 August 1935 in Amsterdam, Holland, son of EMANUEL DE VALENCA and SARA ROET. He was born 20 August 1907 in Amsterdam, Holland, and died 09 April 1943 in Sobibor death camp, Poland - Holocaust victim. Resided with family, February 1941: Nieuwe Kerkstraat 99 I, Amsterdam, Holland. 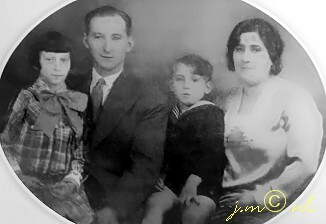 Parents of Emanuel de Valenca were EMANUEL DE VALENCA born 20 August 1885 in Amsterdam, Holland, and died 19 November 1942 in Auschwitz concentration camp, Poland - Holocaust victim. He married SARA ROET. She was born 23 January 1888 in Amsterdam, Holland, and died 19 November 1942 in Auschwitz concentration camp, Poland - Holocaust victim. Resided with family, February 1941: President Brandstraat 28 II, Amsterdam, Holland. Room: floor cloth, runner carpet, foot mat, table with cloth, small table (2), chair (5), armchair (5), sideboard, tea table with tea set lace curtain (4), drape (2), chandelier, wall mirror, alarm clock, newspaper holder, clock, wall plate (3), table lamp, Room: matting, bed cot with bedding, chair (2), stove, hanging lamp, wall plate (3), lace curtain and drape, Room: floor cloth, mat, bed with bedding (2), lace curtain and drape (2), hanging lamp, wall plate, wall cupboard, Room: floor cloth, table with cloth (2), chair (3), lace curtain drape (2), wall plate (5), coat hooks, hanging lamp, Corridor: floor cloth, runner, wall plate (2), wall plate, hanging lamp, Kitchen: floor cloth, runner, foot mat, table with cloth, gas ring, hanging lamp, lace curtain (2), cooking utensils and kitchenware, drying rack. 1. EDDY DE VALENCA, b. 22 July 1938, Amsterdam, Holland; d. 09 April 1943, Sobibor death camp, Poland - Holocaust victim. 2. EMANUEL DE VALENCA, b. 23 August 1940, Amsterdam, Holland; d. 09 April 1943, Sobibor death camp, Poland - Holocaust victim. SARA BOAS was born 06 September 1909 in Harlingen, Friesland, Holland, and died 11 June 1943 in Sobibor death camp, Poland - Holocaust victim. She married BENJAMIN PAIS 31 August 1933 in Harlingen, Friesland, Holland, son of ARON PAIS and REBECCA BLITZ. He was born 25 March 1907 in Zaandam, Zaanstad, Holland, and died 23 July 1943 in Sobibor death camp, Poland - Holocaust victim. Resided with family, 1939: Doniastraat 113, Zaandam, Holland. 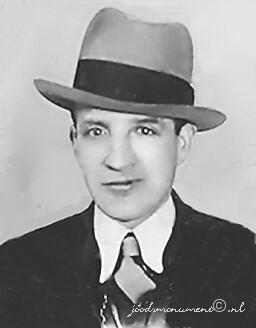 Benjamin Pais married on August 31, 1933 with a woman from Harlingen, Sara Boas. The couple had their first child in Harlingen, a daughter Rebecca, who they named after her grandmother. 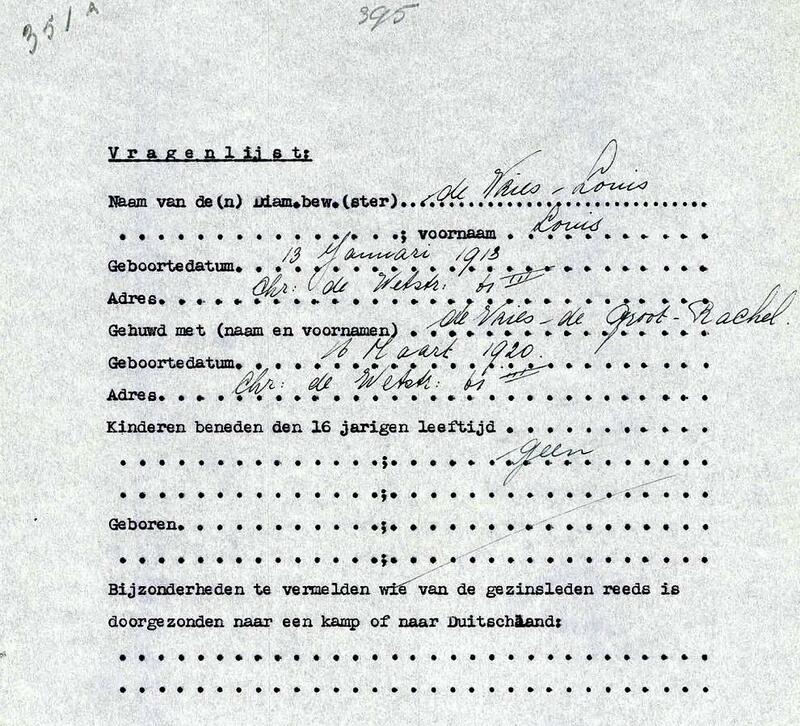 On June 29, 1936, the family moved to Zaandam. Before the war the family lived on the D. Doniastraat 113, then they moved to the Golofkinstraat 53. There two more children were born. The second child was named after an uncle, Gabriel. Their third child, Dina was three months old when the Germans occupied Holland. Benjamin Pais worked on a merchant ship, chandlers' with his brothers Levie and Abraham, who had the same occupation. 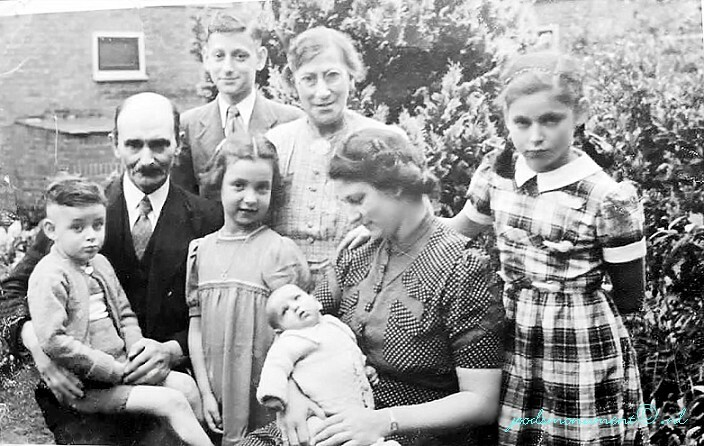 After the occupation the family went into hiding then in January 1942 the family was forced to leave for Amsterdam. What happened thereafter is unclear. The data on www.joodsmonument.nl shows that the three children had ended up at a camp in Vught. It is therefore assumed that the parents probably accompanied their children. 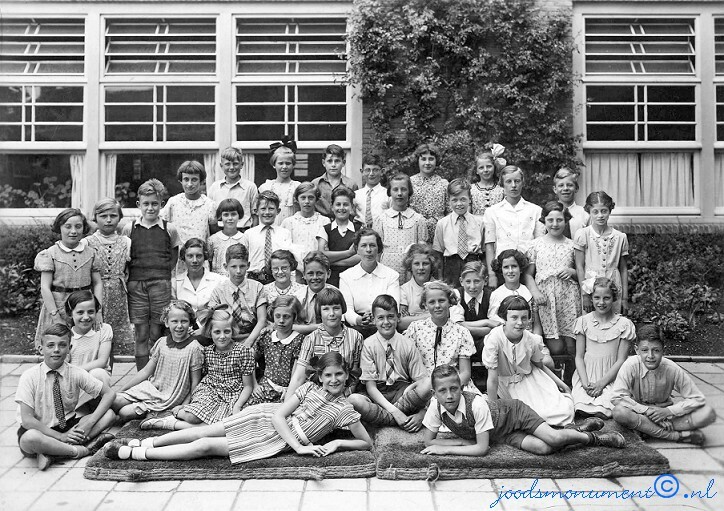 On Saturday, June 5, 1943 the Jewish Council in Vught made a proclamation that all children up to the age of 16 years old must leave the camp and be relocated to a special children's Camp, ondergebracht' 2. The orders were detailed as follows: "1 to 4 year olds, mothers must accompany their children, 2 to 16 year olds, children must be accompanied by a parent. Only if both parents were not employed in one of the camp industries could both join their children. Two transports carrying about three thousand people left the camp on a Sunday and the following Monday. The proclamation ended with eight days of mourning. David Koker schrijft wrote in his diary about the reading of the proclamation: "The people responded to it with a roar as I have never heard before. On 6 and 7 June 1943, a total of 1296 children and their mothers or both parents were deported from Vught. On June 6, 1943, the first train left with the children under 4 years old and their mothers. The next day the older children left with their fathers or mothers. Vught wanted what they considered as unproductive persons gone.. But in the second train there were also productive persons.. The target was to be achieved. The first train (engraved 3 1750) where many of it`s passengers fell sick after a journey of ten hours, arrived at 4.30am on a Monday morning at Westerbork. Chroniqueur Mechanicus saw the train arrive, with hundreds of men and women with their children and infants. Among them were almost certainly Sara Pais-Boas and her daughter Dina. There were several sick children, who were temporarily deposited in the hospital. Benjamin Pais did not get a chance to see his relatives in Westerbork. Sara and the children had already been there a week earlier and on June 8, 1943, were sent to Sobibor. On the night of Monday to Tuesday the second train left from Vught, with about 1,300 men, women and children, including Rebecca and Gabriel Pais.. They were "tired, exhausted, sick and dirty when they arrived at Westerborlk transit camp. Later persons were forced into a cattle train, receiving punches and blows, destined for Sobibor to the East. Among them were at least Rebecca and Gabriel, including Sara and also the youngest child. "The train was full. 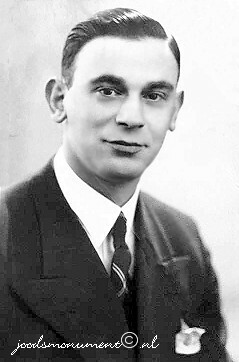 Benjamin Pais had arrived and remained in Westerbork. 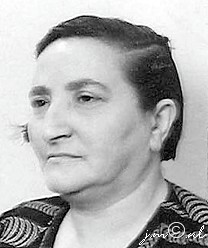 Sara Pais-Boas (35) and her three children, Rebecca (8), Gabriel (5) and Dina (3), had already arrived in Sobibor. Sara and the other adults received stationery to write home about the children sweets. The same day, June 11, they were taken to the gas chambers and murdered. 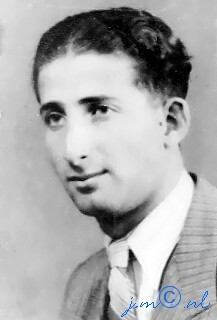 Benjamin Pais (36) was on 20 July, 1943 placed on the same route to Sobibor. It was a very hot summer's day. Philip Mechanicus wrote,: "This is a terrible transportation, all transports are terrible, but the transport on the 20 July was particularly harsh.. This time in transportation were pregnant women in their seventh and eighth months of pregnancies, and children suffering from scarlet fever traveling for up to eight days in freight and cattle cars. Previous, they had spared these categories the misery of an uncertain journey. " 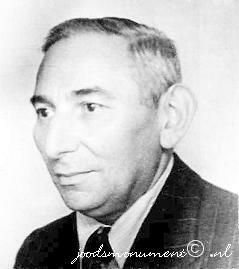 Benjamin Pais was placed on the last train transport that went to the extermination camp, Sobibor, and was gassed on July 23, 1943. Benjamin's entired family were murdered, including his parents, his brothers Gabriel, Adam and his brother Abraham. On the 6th and 7th of June 1943 two trains with Jewish children departed from the Vught camp. All children under 16 had to leave on this transport. Their parents were to accompany them. They were told that they would go to a special camp for children in the area. But the trains went to the Westerbork transit camp and from there on to Sobibor in Poland. The nearly 1300 Jewish children were murdered upon arrival. The rigorous decision to deport all children at once was quite exceptional. The reason this decision was made was due to the origin of the camp. The Vught concentration camp was the only SS-Concentration camp outside Nazi Germany in occupied territory. It had a strict and brutal concentration camp regime. Men, women and children were held in separate barracks. There was a lack of food, clean drinking water and hygiene. The resulting chaos was difficult to handle, both for the Jewish prisoners as for the SS in charge. The children were the most vulnerable. They suffered from diseases and, in the eyes of the SS, they were a nuisance. Most likely this was the reason for their sudden deportation. Parents of Benjamin Pais were ARON PAIS born 05 March 1866 in Harlingen, Friesland, Holland, and died 04 June 1943 in Sobibor death camp, Poland - Holocaust victim. He married REBECCA BLITZ 17 June 1897 in Harlingen, Friesland, Holland. She was born 14 July 1873 in Amsterdam, Holland, and died 04 June 1943 in Sobibor death camp, Poland - Holocaust victim. 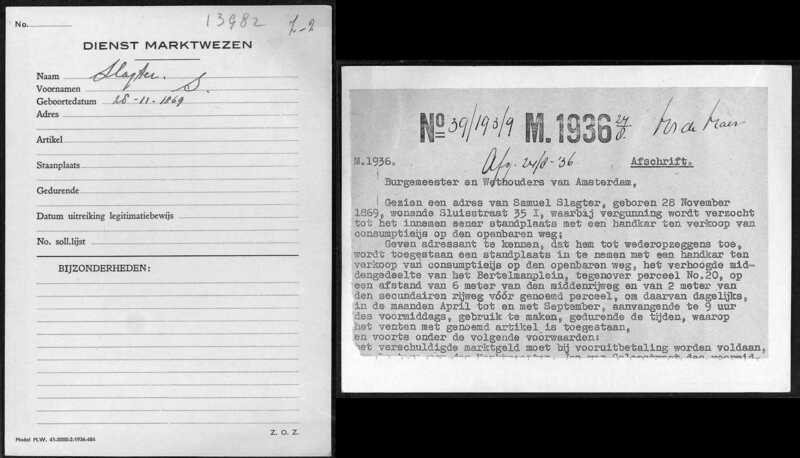 Resided with wife, December 1942: : Nieuwe Achtergracht 12 I, Amsterdam, Holland. Resided with wife, May 1943: Muiderstraat 9 huis, Amsterdam, Holland. 1. REBECCA PAIS, b. 18 November 1934, Harlingen, Friesland, Holland; d. 11 June 1943, Sobibor death camp, Poland - Holocaust victim. Rebecca Pais was deported to Sobibor in June 1943 from Vught via Westerbork on the so-called children's transport. She was 8 years old when she died. 2. GABRIEL PAIS, b. 19 November 1937, Zaandam, Zaanstad, Holland; d. 11 June 1943, Sobibor death camp, Poland - Holocaust victim. Gabriël Pais was deported to Sobibor in June 1943 from Vught via Westerbork on the so-called children's transport. He was 5 when he died. 3. DINA PAIS, b. 05 February 1940, Zaandam, Zaanstad, Holland; d. 11 June 1943, Sobibor death camp, Poland - Holocaust victim. 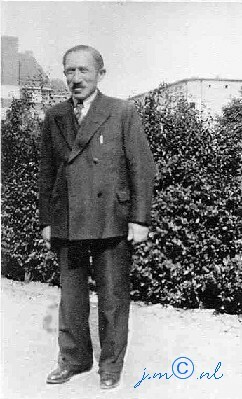 ELKAN MAIJ was born 22 September 1906 in Amsterdam, Holland, and died 31 August 1943 in Central Europe, Municipality unknown - Holocaust victim. He married SARA SLIER 04 January 1939 in Amsterdam, Holland, daughter of SALOMON SLIER and REBECCA SWART. She was born 26 March 1906 in Amsterdam, Holland, and died 08 October 1942 in Auschwitz concentration camp, Poland - Holocaust victim. Resided with family, February 1941: Vrolikstraat 74 II, Amsterdam, Holland. Parents of Sara Slier were SALOMON SLIER born 06 August 1881 in Amsterdam, Holland, and died 03 December 1942 in Auschwitz concentration camp, Poland - Holocaust victim. He married (1) REBECCA SWART 29 June 1905 in Amsterdam, Holland, daughter of JEREMIAS SWART and SAARTJE LEUW. She was born 25 December 1881 in Amsterdam, Holland, and died 28 October 1939 in Amsterdam, Holland. He married (2) SARA ENGELANDER 28 April 1937 in Amsterdam, Holland. She was born 06 July 1885 in Amsterdam, Holland, and died 03 December 1942 in Auschwitz concentration camp, Poland - Holocaust victim. According to a list with shops of Jewish owners, compiled by the Amsterdam police in 1940, this family had a cigar shop, address: Vrolikstraat 323 in Amsterdam. The Jokos files reveal that a claim was lodged for compensation for valuables surrendered to the Lippmann-Rosenthal looting bank (L-claim, number 11041/15981). 1. REBECCA MAIJ, b. 15 November 1939, Amsterdam, Holland; d. 08 October 1942, Auschwitz concentration camp, Poland - Holocaust victim. MOZES MAY (original surname was, MAIJ), was born 27 September 1907 in Amsterdam, Holland, and died 09 July 1943 in Sobibor death camp, Poland - Holocaust victim. He married HERMINA MOSSEL 30 May 1930 in Antrep, Belgiam, daughter of ABRAHAM MOSSEL and ESTHER ELJON. She was born 31 May 1906 in Amsterdam, Holland, and died 11 June 1943 in Sobibor death camp, Poland - Holocaust victim. Resided with family, October 1941:Vrolikstraat 74 II, Amsterdam, Holland. Resided with family, April 1942:Maritzstraat 5 II, Amsterdam, Holland. Parents of Hermina Mossel were ABRAHAM MOSSEL born 28 February 1879 in Amsterdam, Holland, and died 01 September 1942 in Municipality unknown - Holocaust victim. He married ESTHER ELJON 12 February 1903 in Amsterdam, Holland. She was born 16 September 1879 in Amsterdam, Holland, and died 01 September 1942 in Municipality unknown - Holocaust victim. The members of this family were deported from Mechelen to Auschwitz. 1. JACQUES ALBERT MAY, b. 23 May 1936, Berchem, Belgium; d. 11 June 1943, Sobibor death camp, Poland - Holocaust victim. 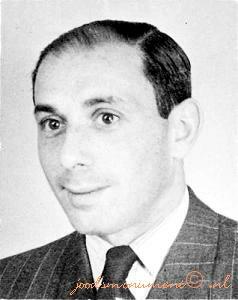 Jacques Albert May was deported to Sobibor in June 1943 from Vught via Westerbork on the so-called children's transport. He was 7 when he died. 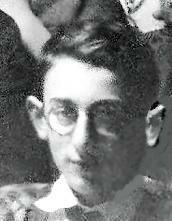 ABRAHAM HAKKER was born 06 October 1909 in Amsterdam, Holland, and died 23 April 1945 in Municipality unknown - Holocaust victim. He married ESTHER VAN LOGGEM 02 April 1930 in Amsterdam, Holland, daughter of EMANUEL VAN LOGGEM and SARA ROOTVELD. She was born 17 August 1910 in Amsterdam, Holland, and died 11 June 1943 in Sobibor death camp, Poland - Holocaust victim. Resided: Vrolikstraat 393 III, Amsterdam, Holland. Parents of Esther van Loggem were EMANUEL VAN LOGGEM born 28 April 1877 in Amsterdam, Holland, and died 08 June 1936 in Amsterdam, Holland. He married SARA ROOTVELD 25 April 1900 in Amsterdam, Holland. She was born 25 December 1870 in Amsterdam, Holland, and died 30 April 1943 in Sobibor death camp, Poland - Holocaust victim. Resided: Iepenplein 31 III, Amsterdam, Holland. 1. SCHOONTJE HAKKER, b. 13 August 1930, Amsterdam, Holland; d. 11 June 1943, Sobibor death camp, Poland - Holocaust victim. 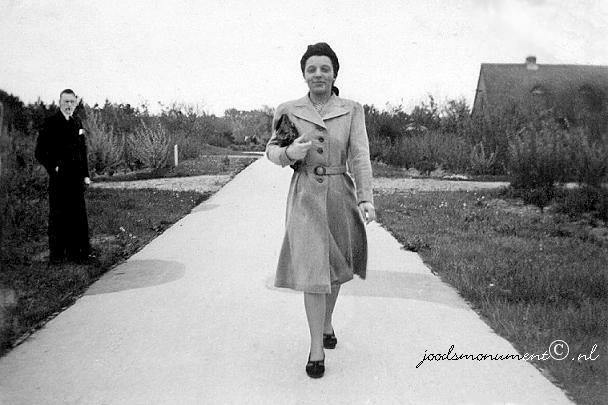 Schoontje Hakker was deported to Sobibor in June 1943 from Vught via Westerbork on the so-called children's transport. She was 12 when she died. 2. EMANUEL HAKKER, b. 18 December 1931, Amsterdam, Holland; d. 11 June 1943, Sobibor death camp, Poland - Holocaust victim. 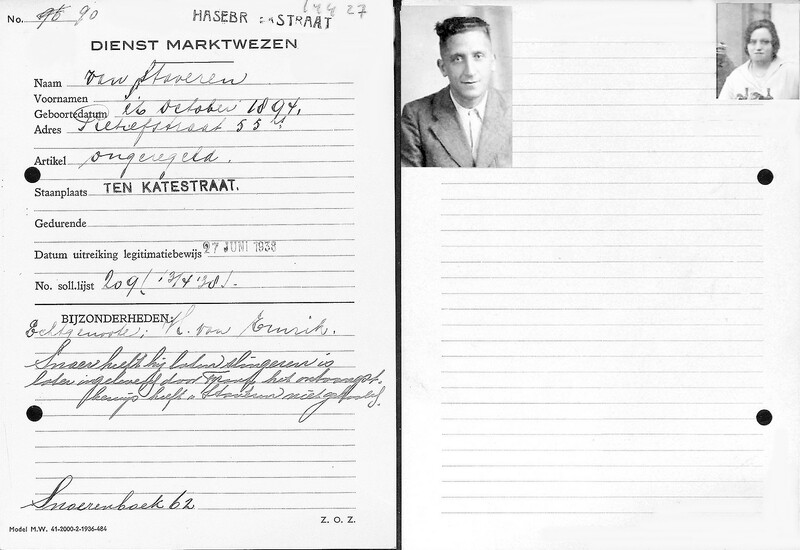 Emanuel Hakker was deported to Sobibor in June 1943 from Vught via Westerbork on the so-called children's transport. He was 11 when he died. 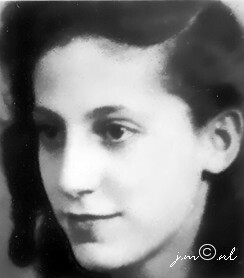 ELISABETH PAIS was born 17 March 1910 in Amsterdam, Holland, and died 15 July 1942 in Amsterdam, Holland - Holocaust victim. She married ELIAS ABRAHAM 06 July 1932 in Amsterdam, Holland, son of GERRIT ABRAHAM and LEENTJE BIET. He was born 03 June 1902 in Amsterdam, Holland, and died 15 July 1942 in Amsterdam, Holland - Holocaust victim. Resided with family, 1 February 1941: Valkenburgerstraat 153 II, Amsterdam, Holland. Elias Abraham and his brother Pinas took their own lives together with their families due to the pressure of the circumstances. Parents of Elias Abraham were GERRIT ABRAHAM born 21 December 1869 in Amsterdam, Holland, and died 10 September 1942 in Auschwitz concentration camp, Poland - Holocaust victim. He married LEENTJE BIET 09 August 1893 in Amsterdam, Holland. She was born 18 May 1873 in Amsterdam, Holland, and died 10 September 1942 in Auschwitz concentration camp, Poland - Holocaust victim. Resided with family, February 1941: Nieuwe Batavierstraat 3 I, Amsterdam, Holland. Gerrit Abraham and Leentje Biet had five children: Jeannette, Marianna, Elias, Pinas and one child that survived the war. Belonging to: Gerrit Abraham and his family, Amsterdam. Living room: carpet, mat (2), leather chair (2), chair (2), easy chair, cane chair, round table, writing desk, desk, small table, typewriter table, tea trolley, sofa bed with mattress, cushion, woollen blankets, feather and down duvet, spring mattress with duvet, curtain (2), casing, bedside table, screen, fitted double washstand, mirror (2), electric cooker (2), laundry basket (2), waste-paper basket, electric stencil machine, stool, worthless items, carpet, bookcase with books, money box, night lamp, table lamp, desk light, flower vase, wall plate (5), painting, wall plate, writing desk, wall cupboard with clothing and linen, box with knick-knacks (2), hat box with hats, chandelier, lace curtain and drapes (2), counterpane, cushion (6), woollen blankets, fold-out bed with mattress. Bedroom: carpet, mat, round table, small table, easy chair, leather chair (2), iron bed with mattress, bolster, woollen blankets (3), cushion, feather and down duvet, tablecloth (3), sewing table, night lamp, wall lamp, lace curtain and drapes (2), 2-part mattress, runner, linen cupboard with whites and books, chandelier, suitcase with linen, prayer books, curtains. Bed-sitting room: carpet, mat, carpet, table, armchair (3), chair, stool, sofa bed with 3-part mattress, bolster, cushion (4), feather-and-down duvet, pillow (3), electric cooker (2), piano, typewriter, chest with curtains, feather and down duvet, gents' clothing, writing desk with worthless papers, medicine cupboard with medicines and soap, cabinet with music books, desk light, letter scales, round table, waste-paper basket, table lamp, vase, lace curtain and drapes (2), chandelier, metronome, barometer, tablecloth (2), cupboard. Bed-sitting room: mat, small table with cloth, chair (2), armchair (2), cushion (3), writing desk with old books, family photo album, worthless items, ornamental table, night lamp, barometer, fold-out bed with mattress, woollen blankets (2), quilted blankets, casing with curtains, chandelier, hassock, medicine cupboard with medicines, desk light large bookcase, suitcase with dirty laundry, worthless items, painting (4), lace curtains (3), drapes (2), hanging lamp. Side-room: mat. table. easy chair (2). small flower rack. bedside table. typewriter, worthless items. children's gramophone. fold-out bed with mattress (3-part). 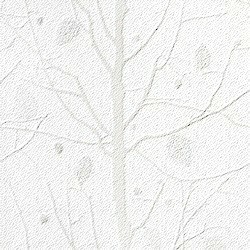 feather and down duvet. flannelette blanket. cushion. casing with curtains. pendulum clock. night lamp. books. worthless items. bookshelf. hanging lamp. lace curtains. drapes (2). linen cupboard. Bed-sitting room: carpet, mat (3), table with cloth, leather chair (3), chair, armchair, flower table with cover, vase, cabin trunk, bedside cabinet with toiletries, night lamp, sofa bed with sheet, mattress, flannelette blanket, feather and down duvet, sofa cover, cushion (2), bolster, pillow (2), iron bed with 3-part mattress, woollen blankets, feather-and-down duvet, pillow, cushion (2), counterpane, screen, bedside cabinet with medicines (2), toiletries, drying rack, standing table lamp, dressing table, groceries, writing implements, bedside cabinet with ladies' clothing, drapes (3), lace curtains (2), painting, hanging lamp, linen cupboard, electric blanket, whites, shoes, ladies' handbag, hat box with hat, kitchen utensils, small statue, china objects, suitcase with ladies' clothing (3), loudspeaker, travelling case with ladies' clothing, groceries. Living room: mat, carpet, table, leather armchair (4), office chair, easy chair (2), cabin trunk (2), tea trolley, table lamp, settee, mattress, bolster (2), cushion (3), cupboard with medicines, cane basket, shoes, music cupboard with books, settee with books, cushion (2), round table, standing table lamp, electric cooker, sideboard, hanging lamp, painting, wall plate (2), loudspeaker, cabin trunk, wall cupboard. Kitchen: table, small table, fridge, gas cooker, gas ring, cupboard. Scullery: cupboard with groceries, chair, ironing board, kitchen set and kitchen utensils., cupboard with groceries, chair, ironing board, kitchen set and kitchen utensils. Bathroom: stool, bedside table, washstand (2) ironing board, medicine cupboard with medicines (2), bucket, tub, laundry basket, cork mat (3), lamp, Corridor and staircase:. carpet, sewing machine, stool, vacuum cleaner (2), hanging lamp (2), small table, dressing table, wall mirror, painting, coat hanger with clothing, stair carpet with rods, hanging lamp, cupboard. 1. GERRIT ABRAHAM, b. 10 July 1933, Amsterdam, Holland; d. 15 July 1942, Amsterdam, Holland - Holocaust victim. 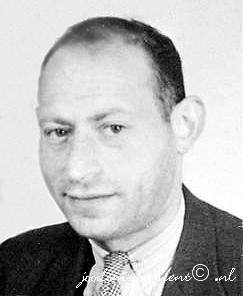 ELIAS PAIS was born 29 April 1913 in Amsterdam, Holland, and died 31 March 1944 in Auschwitz concentration camp, Poland - Holocaust victim. He married MARIANNE PEEPER 17 February 1937 in Amsterdam, Holland, daughter of ISAAC PEEPER and BETJE ROOS. She was born 20 August 1912 in Amsterdam, Holland, and died 30 November 1943 in Auschwitz concentration camp, Poland - Holocaust victim. Resided with family, February 1941: Kromme Mijdrechtstraat 60 II, Amsterdam, Holland. Parents of Marianne Peeper were ISAAC PEEPER born 11 November 1876 in Amsterdam, Holland, and died 20 March 1943 in Sobibor death camp, Poland - Holocaust victim. He married BETJE ROOS 10 June 1903 in Amsterdam, Holland. 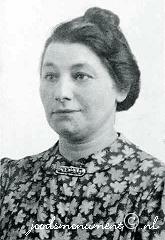 She was born 14 June 1880 in Amsterdam, Holland, and died 20 March 1943 in Sobibor death camp, Poland - Holocaust victim. Resided with family, February 1941: Krugerstraat 29 huis, Amsterdam, Holland. Isaac Peeper and Betje Roos had four children: Meijer, Nathan, Marianne and a child that survived. The Jokos file reveals that a claim was lodged for compensation for valuables surrendered to the Lippmann-Rosenthal looting bank (L-claim, number 9179/4283). MARIANNA PAIS was born 14 November 1916 in Amsterdam, Holland, and died 29 July 1942 in Auschwitz concentration camp, Poland - Holocaust victim. She met HARTOG ROOT, son of SALOMON ROOT and CLAARTJE MUIJS. He was born 17 July 1909 in Amsterdam, Holland, and died 30 September 1942 in Auschwitz concentration camp, Poland - Holocaust victim. Resided with family, February 1941: Valkenburgerstraat 21 II, Amsterdam, Holland. Belonging to: Hartog Root and his family, Amsterdam. Room: floor cloth, carpet, table with cloth, chair (4), easy chair (2), round table, small carpet, coal-fired cooker, electric clock, sideboard with glass set, dinner set and ceramics, wall mirror, wall plate, lace curtain (4), drape (2). Room: floor cloth, small children's table, chair (2), cot with bedding, wall cupboard, lace curtain (2). Room: floor cloth, small carpet (2), double bed with bedding, bedside table (2), chair (2),dressing table, wall cupboard with ladies' clothing and underwear, hanging lamp, lace curtain (4), table lamp (2). Room: floor cloth, runner, chair (2), table with cloth, table, child seat, enamel kitchen ware, wall cupboard with dinner set and ceramics, paraffin stove (2), wall cupboard with kitchenware and house ware, gas ring, lace curtain (2). Area unknown: floor cloth, runner (2), coat stand, hanging lamp. Parents of Hartog Root were SALOMON ROOT born 14 April 1880 in Amsterdam, Holland, and died 19 November 1942 in Auschwitz concentration camp, Poland - Holocaust victim. He married CLAARTJE MUIJS 08 February 1906 in Amsterdam, Holland. She was born 02 January 1882 in Amsterdam, Holland, and died 19 November 1942 in Auschwitz concentration camp, Poland - Holocaust victim. Resided with family, February 1941: Blasiusstraat 54 I, Amsterdam, Holland. 1. CARRY ROOT, b. 23 November 1940, Amsterdam, Holland; d. 29 July 1942, Auschwitz concentration camp, Poland - Holocaust victim. JANSJE HEKSTER was born 16 October 1916 in Amsterdam, Holland, and died 02 July 1943 in Sobibor death camp, Poland - Holocaust victim. She married AÄRON BLITZ, son of WOLF BLITZ and BRANCA WAAS. He was born 16 February 1916 in Amsterdam, Holland, and died 02 July 1943 in Sobibor death camp, Poland - Holocaust victim. Parents of Jansje Hekster were ALEXANDER HEKSTER born 17 May 1891 in Amsterdam, Holland, and died 28 May 1943 in Sobibor death camp, Poland - Holocaust victim. He married EVA PAIS 03 December 1913 in Amsterdam, Holland, daughter of JOOST PAIS and BETJE ZWAAF. She was born 06 May 1891 in Amsterdam, Holland, and died 28 May 1943 in Sobibor death camp, Poland - Holocaust victim. VROUWTJE PAIS was born 21 July 1906 in Amsterdam, Holland, and died 03 September 1943 in Auschwitz concentration camp, Oswiecim Poland – Holocaust victim. She married EMANUEL SERLUI 10 October 1928 in Amsterdam, Holland, son of SAMUEL SERLUI and REINTJE SPREEKMEESTER. He was born 11 February 1905 in Amsterdam, Holland, and died 31 March 1944 in Auschwitz concentration camp, Oswiecim Poland – Holocaust victim. Resided February 1941: Danie Theronstraat 23 I, Amsterdam, Holland. 1. REINA SERLUI, b. 06 January 1929, Amsterdam, Holland; d. 03 September 1943, Auschwitz concentration camp, Oswiecim Poland – Holocaust victim. 2. ELISABETH SERLUI, b. 07 April 1933, Amsterdam, Holland; d. 03 September 1943, Auschwitz concentration camp, Oswiecim Poland – Holocaust victim. 3. SAMUEL SERLUI, b. 31 December 1934, Amsterdam, Holland; d. 03 September 1943, Auschwitz concentration camp, Oswiecim Poland – Holocaust victim. 4. 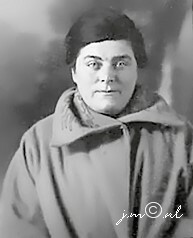 MARTHA EMMY SERLUI, b. 04 April 1941, Amsterdam, Holland; d. 03 September 1943, Auschwitz concentration camp, Oswiecim Poland – Holocaust victim. MARTHA PAIS was born 27 October 1909 in Amsterdam, Holland, and died 21 May 1943 in Sobibor death camp, Poland - Holocaust victim. She married ANDRIES SLAGTER 05 November 1930 in Amsterdam, Holland, son of SAMUEL SLAGTER and JEANNETTE ARONIUS. He was born 19 January 1908 in Amsterdam, Holland, and died 28 February 1943 in Auschwitz III, aka Monowitz concentration camp, Oswiecim Poland – Holocaust victim. 1. JEANNETTE SLAGTER, b. 13 October 1931, Amsterdam, Holland; d. 21 May 1943, Sobibor death camp, Poland - Holocaust victim. 2. SALOMON SLAGTER, b. 17 March 1933, Amsterdam, Holland; d. 21 May 1943, Sobibor death camp, Poland - Holocaust victim. 3. ELISABETH SLAGTER, b. 01 May 1939, Amsterdam, Holland; d. 21 May 1943, Sobibor death camp, Poland - Holocaust victim. SARA PAIS was born 22 December 1911 in Amsterdam, Holland, and died 26 March 1943 in Sobibor death camp, Poland - Holocaust victim. She married BERNARD BIERMAN 30 October 1935 in Amsterdam, Holland, son of MOZES BIERMAN and BETSIE WORMS. He was born 13 July 1912 in Amsterdam, Holland, and died 01 September 1941 in Mauthausen-Gusen Concentration Camp, Mauthausen, Austria. Resided with family February 1941: Jodenbreestraat 81 II, Amsterdam, Holland. Parents of Bernard Bierman were MOZES BIERMAN was born 30 May 1880 in Amsterdam, Holland, and died 21 September 1942 in Auschwitz concentration camp, Poland - Holocaust victim. He married BETSIE WORMS 13 August 1903 in Amsterdam, Holland. She was born 13 June 1880 in Amsterdam, Holland, and died 21 September 1942 in Auschwitz concentration camp, Poland - Holocaust victim. Resided with family, February 1941:Nieuwe Keizersgracht 27 huis, Amsterdam, Holland. 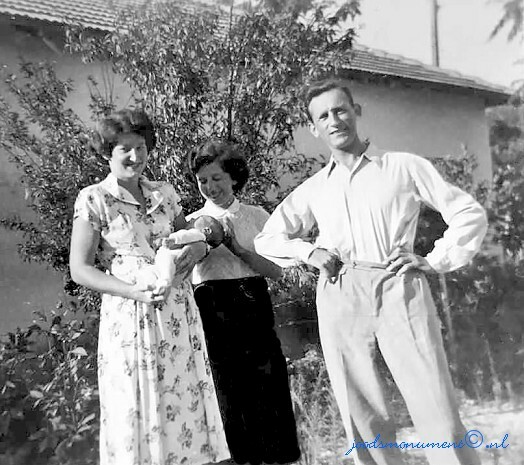 Mozes Bierman was a son of Bernard Bierman and Esther Blik. He married Betsie Worms in Amsterdam on 13 August 1903, a daughter of Leendert Worms and Sara Amanda de Leeuw. Children of the couple were Salomon, Simcha, Leendert and Bernard, who died only 5 years old in Apeldoorn. Belonging to: Mozes Bierman and his family, Amsterdam. Room: floor covering, cane mat, small mat, lace curtain (2), drape (4), table, chair (4), easy chair (2), small table, cabinet, wall plate (3), mirror, vase, hanging lamp. Room: floor covering, mat, chair, fold-out bed, painting (2), bookshelves with books, lamp. Room: floor covering, mat (2), runner, small mat (2), lamp, clock, painting (2), mirror, mantelpiece runner, table, chair (4), easy chair (2), cane reclining chair, fold-out bed with underwear, ironing board, clock, piano lamp, vacuum cleaner, cupboard with books, ironing board. Kitchen: floor covering, carpet, gas stove with 4 burners, cabinet, coffee grinder, pots and pans, built-in cupboard (2), table with wash cloth, chair (3), towel rack, small lamp. Corridor: runner, cupboard with knick-knacks, mat (2), rinsing tub, small lamp. 1. ELISABETH BIERMAN, b. 11 March 1938, Amsterdam, Holland; d. 26 March 1943, Sobibor death camp, Poland - Holocaust victim. MARCUS PAIS was born 10 February 1914 in Amsterdam, Holland, and died 03 January 2000 in Amsterdam, Holland. He married KLASINA PERGER, daughter of JULIUS PERGER and PETERNELLA VAN ZIJST. She was born 17 July 1917 in Amsterdam, Holland, and died 14 February 1994 in Amsterdam, Holland. 1. FREDERIKA (FRIEDA) PAIS, b. 03 January 1943, Amsterdam, Holland; d. 23 April 1996, Amsterdam, Holland; m. JAN THEODOOR TULLENERS, 24 February 1966, Amsterdam, Holland; b. 13 September 1939, Amsterdam, Holland; d. 29 December 2001, Amsterdam, Holland. 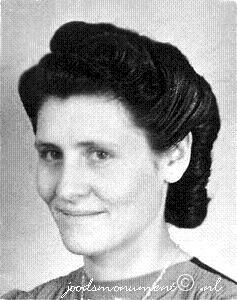 VROUWTJE PAIS was born 25 December 1919 in Amsterdam, Holland, and died 23 April 1943 in Sobibor death camp, Poland - Holocaust victim. She married HIJMAN GOBETZ 24 March 1937 in Amsterdam, Holland, son of JOSEPH GOBETZ and KLARA KLIJNKRAMER. 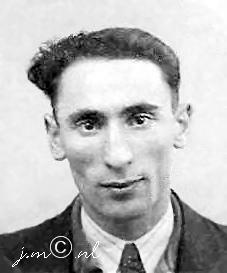 He was born 18 October 1912 in Amsterdam, Holland, and died 30 November 1943 in SS- Abrbeitslager Dorohucza concentration camp, Trawniki, Poland – Holocaust victim. Resided with family, February 1941: Blasiusstraat 146 I, Amsterdam, Holland. Parents of JOSEPH GOBETZ born 19 May 1879 in Amsterdam, Holland, and died 26 January 1943 in Auschwitz concentration camp, Poland - Holocaust victim. He married KLARA KLIJNKRAMER 08 June 1898 in Amsterdam, Holland. She was born 24 October 1879 in Amsterdam, Holland, and died 16 April 1943 in Sobibor death camp, Poland - Holocaust victim. 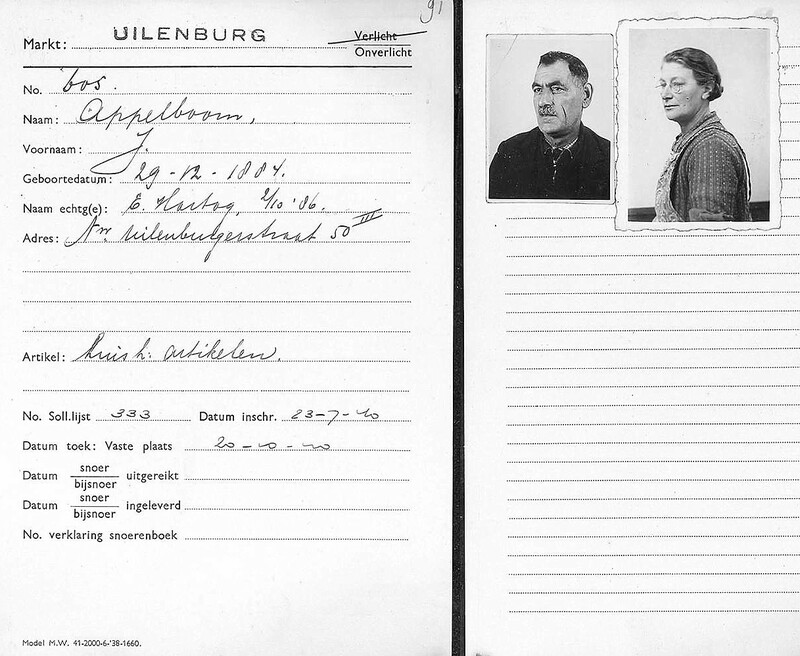 Resided with family, February 1941: Tugelaweg 101 I, Amsterdam, Holland. Joseph Gobetz was a son of Israel Gobetz and Klaartje Wijnman. 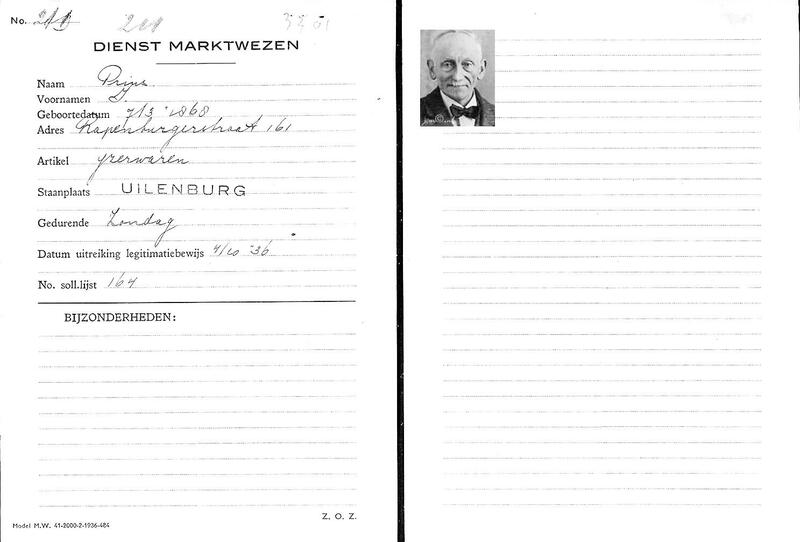 He married in Amsterdam on 8 June 1898 to Klara Klijnkramer, daughter of Gerrit Klijnkramer and Sara Cosman. The couple had eleven children: Keetje, Saartje, Leentje, Gerrit, Rebecca (who only died a few months old), Israel, Meijer, Hijman, Aron, again a daughter Rebecca, who died nearly one year old and a son Salomon, who still lived with his parents. 1. JOSEPH GOBETZ, b. 04 May 1937, Amsterdam, Holland; d. 23 April 1943, Sobibor death camp, Poland - Holocaust victim. 2. ELIAS GOBETZ, b. 27 July 1938, Amsterdam, Holland; d. 23 April 1943, Sobibor death camp, Poland - Holocaust victim. 3. 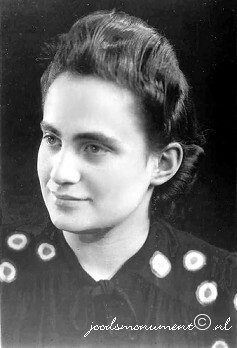 KLARA GOBETZ, b. 26 July 1940, Amsterdam, Holland; d. 23 April 1943, Sobibor death camp, Poland - Holocaust victim. 4. HERMAN GOBETZ, b. 06 August 1942, Amsterdam, Holland; d. 23 April 1943, Sobibor death camp, Poland - Holocaust victim. JOEL NOOT was born 05 August 1916 in Amsterdam, Holland, and died 04 June 1943 in Sobibor death camp, Poland - Holocaust victim. He married SOPHIA VAN WEST 01 May 1940 in Amsterdam, Holland, daughter of LEHMAN VAN WEST and CHAIE HEIJMANN. She was born 09 December 1917 in Amsterdam, Holland, and died 06 December 1985 in Amersfoort, Utrecht, Holland. Resided February 1, 1941: Zandstraat 9 I, Amsterdam, Holland. Parentsof Sophia van West were LEHMAN VAN WEST born 29 January 1894 in Amsterdam, Holland, and died 09 July 1943 in Sobibor death camp, Poland - Holocaust victim. He married CHAIE (JOHANNA) HEIJMANN 16 February 1916 in Amsterdam, Holland. She was born 20 August 1898 in Libau, Latvia, and died 09 July 1943 in Sobibor death camp, Poland - Holocaust victim. Resided February 1941: Krugerstraat 5 II, Amsterdam, Holland. 1. SCHOONTJE NOOT, b. 18 April 1941, Amsterdam, Holland; d. 05 August 1991. LENA NOOT was born 07 February 1920 in Amsterdam, Holland, and died 12 October 1942 in Auschwitz Concentration Camp Poland - Holocaust victim. She married JOSEPH BIET 10 March 1937 in Amsterdam, Holland, son of JACOB BIET and GRIETJE DE LEEUWE. He was born 02 October 1916 in Amsterdam, Holland, and died 31 January 1943 in Auschwitz Concentration Camp Poland - Holocaust victim. Resided with family February 1941: Nieuwe Kerkstraat 95 I, Amsterdam, Holland. Parents of Joseph Biet were JACOB BIET born 23 February 1875 in Amsterdam, Holland, and died 06 January 1943 in Amsterdam, Holland. He married GRIETJE DE LEEUWE 02 January 1901 in Amsterdam, Holland. She was born 28 April 1878 in Amsterdam, Holland, and died 28 May 1943 in Sobibor death camp, Poland - Holocaust victim. 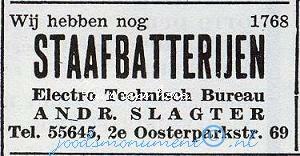 Resided with son, February 1941: Weesperstraat 69 III, Amsterdam, Holland. 1. MARGARETHA BIET, b. 18 July 1937, Amsterdam, Holland; d. 12 October 1942, Auschwitz Concentration Camp Poland - Holocaust victim. 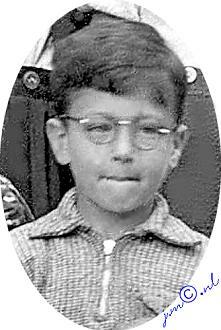 SALOMON DIGTMAKER was born 24 June 1919 in Rotterdam, Holland, and died 30 September 1942 in Auschwitz concentration camp, Poland - Holocaust victim. He married JAANTJE FRIESER 14 April 1937 in Rotterdam, Holland, daughter of ABRAHAM FRIESER and ROOSJE MELKMAN. She was born 25 August 1917 in Rotterdam, Holland, and died 30 September 1942 in Auschwitz concentration camp, Poland - Holocaust victim. Resided: Straatweg 83 II, Hillegersberg, Holland. Parents of Salomon Digtmaker were EMANUEL DIGTMAKER born 20 December 1885 in Amsterdam, Holland, and died 30 September 1942 in Auschwitz concentration camp, Poland - Holocaust victim. He married ESTHER VELLEMAN 04 November 1909 in Amsterdam, Holland, daughter of SALOMON VELLEMAN and LEENTJE PAIS. She was born 28 October 1885 in Amsterdam, Holland, and died 16 August 1942 in Auschwitz concentration camp, Poland - Holocaust victim. 1. EMANUEL DIGTMAKER, b. 12 February 1938, Amsterdam, Holland; d. 02 July 1943, Sobibor death camp, Poland - Holocaust victim. Emanuel Digtmaker was deported to Sobibor in June 1943 from Vught via Westerbork transit camp on the so-called children's transport. He was 5 years old when he died. ROSETTE JAS was born 23 June 1912 in Amsterdam, Holland, and died 26 July 1942 in Auschwitz concentration camp, Poland - Holocaust victim. She married HARTOG KOPERBERG 30 October 1940 in Amsterdam, Holland, son of LEON KOPERBERG and MARIANNE RICARDO. He was born 19 June 1905 in Amsterdam, Holland, and died 30 September 1942 in Auschwitz concentration camp, Poland - Holocaust victim. Divorced: 06 October 1938, Sophia de Beer. Hartog Koperberg was the son of Leon Koperberg and Marianne Ricardo. He was first married to Sophia de Beer. They were later divorced. 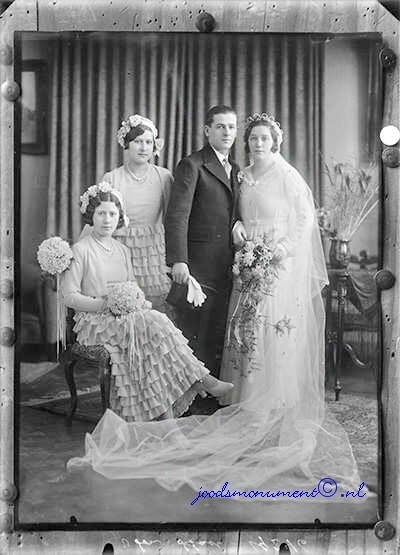 In October 1940, Hartog Koperberg married Rosette Jas. Her son from a previous relationship, Hans Jas was taken into the family. 1. HANS JAS, b. 07 February 1939, Amsterdam, Holland; d. 26 July 1942, Auschwitz concentration camp, Poland - Holocaust victim. LENY VELLEMAN was born 22 November 1922 in Zandvoort, Holland, and died 17 April 2012 in Amsterdam, Holland. She married SAMSON BOEKEN 28 May 1947 in Amsterdam, Holland, son of JACOB BOEKEN and MARIANNE VAN EMRIK. He was born 26 May 1920 in Amsterdam, Holland, and died 08 January 1987 in Amsterdam, Holland. Parents of Samson Boeken were JACOB BOEKEN born 20 November 1885 in Amsterdam, Holland, and died 04 June 1943 in Sobibor death camp, Poland - Holocaust victim. He married MARIANNE VAN EMRIK 22 May 1907 in Amsterdam, Holland. She was born 20 December 1883 in Amsterdam, Holland, and died 04 June 1943 in Sobibor death camp, Poland - Holocaust victim. Resided with family, February 1941: Jodenbreestraat 63 II, Amsterdam, Holland. Jacob Boeken and his wife Marianne van Emrik had 9 children, 3 died at a young age before the war, 3 died during and because of the war and 3 children survived the war. When Leny Velleman returned from deportation after a detention in Auschwitz in June 1945, she reported to the Central Stations in Amsterdam. The man who put her name on a list, suspected that one of her family members had already been registered. Leny, then a young woman of 23, knew what she already feared, namely that her family probably no longer lived and that she was alone. SIENTJE QUERIDO was born 15 August 1917 in Amsterdam, Holland, and died 12 October 1942 in Auschwitz concentration camp, Poland - Holocaust victim. She married DAVID DE LEEUWE 08 February 1939 in Amsterdam, Holland, son of EMANUEL DE LEEUWE and RACHEL ENSEL. He was born 03 August 1918 in Amsterdam, Holland, and died 04 December 1942 in Auschwitz concentration camp, Poland - Holocaust victim. Resided with family, February 1941: Govert Flinckstraat 97 I, Amsterdam, Holland. Parents of David de Leeuwe were EMANUEL DE LEEUWE born 14 February 1894 in Amsterdam, Holland, and died 05 March 1943 in Sobibor death camp, Poland - Holocaust victim and RACHEL ENSEL. He married (1) ANNA VAN DEN BERG. She was born 15 October 1898 in Amsterdam, Holland, and died 05 March 1943 in Sobibor death camp, Poland - Holocaust victim. He married (2) RACHEL ENSEL 1916 in Amsterdam, Holland. She was born 04 July 1894 in Amsterdam, Holland, and died 16 November 1918 in Amsterdam, Holland. He married (3) SAARTJE VAN DEN BERG 1923 in Amsterdam, Holland. She was born 07 February 1893 in Amsterdam, Holland, and died 02 July 1931 in Amsterdam, Holland. Emanuel de Leeuw was a son of Isaac de Leeuw and Esther Engelsman. He married Rachel Ensel in 1916 in Amsterdam. She died in 1922. They had four children, among whom David. Two children died before the war. One child survived the war. Emanuel de Leeuw married Saartje van den Berg in 1923 in Amsterdam. She died in 1931. They had four children as well, of whom one survived the war. Anna van den Berg was the third spouse of Emanuel de Leeuw. They had a son Leendert. Resided with family, February 1941: Van Ostadestraat 235 huis, Amsterdam, Holland. Anna van den Berg was a daughter of Jonas van den Berg and Leentje Morpurgo and sister of Emanuel de Leeuwe`s second wife, Saartje van den Berg. 1. EMANUEL DE LEEUW, b. 29 September 1939, Amsterdam, Holland; d. 12 October 1942, Auschwitz concentration camp, Poland - Holocaust victim. 2. BERNARD DE LEEUW, b. 17 December 1940, Amsterdam, Holland; d. 12 October 1942, Auschwitz concentration camp, Poland - Holocaust victim. MOZES PAIS was born 01 April 1918 in Amsterdam, Holland, and died 30 September 1942 in Auschwitz concentration camp, Poland - Holocaust victim. He met MINA ELSAS, daughter of SALOMON ELSAS and DINA CORPER. She was born 11 June 1919 in Amsterdam, Holland, and died 29 July 1942 in Auschwitz concentration camp, Poland - Holocaust victim. Resided with family, February 1941: Joubertstraat 27 III, Amsterdam, Holland. Belonging to: Mozes Pais and his family, Amsterdam. Room: lace curtain and drape (4), hanging lamp, wall plate (4), brush hanger with 2 brushes, tea table with tea set, sideboard with glass set, flower table with cover, table lamp, coal-scuttle, standing lamp, child seat, wall mirror, clock, glass vase (2), wall cupboard, table, chair (6)armchair (2), floor cloth, carpet, mat (3). Room: lace curtain and drape (2), wall plate (2), wooden bed with bedding, children's cupboard, mat. Room: lace curtain (2), pram, wall cupboard, bedside table, bedding, small table with cloth. Kitchen: lace curtain,floorcloth runner (2) ceiling lamp, spice rack, shelf with kitchenware, gas ring, table with cloth, chair (2), display cabinet, paraffin burner, sink cupboard, runner , floor cloth. Corridor: floor cloth, runner (2). 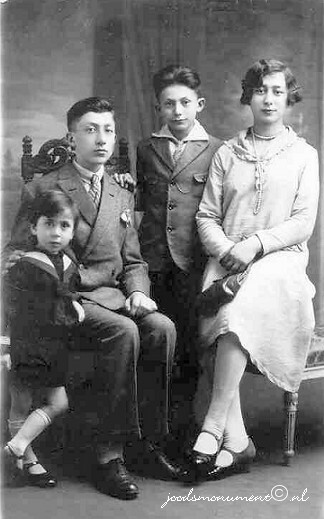 Parents of Mina Elsa were SALOMON ELSAS born 27 May 1895 in Amsterdam, Holland, and died 30 September 1942 in Auschwitz concentration camp, Poland - Holocaust victim. He married DINA CORPER 03 March 1915 in Amsterdam, Holland. She was born 07 November 1896 in Amsterdam, Holland, and died 30 September 1942 in Auschwitz concentration camp, Poland - Holocaust victim. Dina Corper was the daughter of Levie Corper and Judith Meljado. Resided with family, February 1941: President Brandstraat 40 II, Amsterdam, Holland. Belonging to: Salomon Elsas and his family, Amsterdam. drape (2), wall cupboard. Bedroom: linoleum, double bed with bedding, hanging lamp, lace curtain and drape (2). Kitchen: linoleum, runner, pot, gas ring, wall cupboard. Corridor: runner. Attic: misc. Bedroom: linoleum, carpet, table, chair (4), divan, hanging lamp, lace curtain, drape (2), wall cupboard. 1. MIJNTJE PAIS, b. 23 April 1941, Amsterdam, Holland; d. 29 July 1942, Auschwitz concentration camp, Poland - Holocaust victim. JACOB DE VRIES was born 16 December 1896 in Amsterdam, Holland, and died 02 July 1943 in Sobibor death camp, Poland - Holocaust victim. He married ESTHER LESSING 29 January 1924 in Antwerp, Belgium, daughter of MOZES LESSING and MIETJE AGSTERIBBE. She was born 07 August 1902 in Amsterdam, Holland, and died 02 July 1943 in Sobibor death camp, Poland - Holocaust victim. Resided with family February 1941: Retiefstraat 31 II, Amsterdam, Holland. Parents of Esther Lessing were MOZES LESSING born 02 February 1876 in Haarlem, Holland, and died 21 August 1906 in Amsterdam, Holland. He married MIETJE AGSTERIBBE 26 August 1896 in Amsterdam, Holland. She was born 08 October 1876 in Amsterdam, Holland, and died 10 September 1942 in Auschwitz concentration camp, Poland - Holocaust victim. Resided with relatives, February 1941: Lepelstraat 58 III, Amsterdam, Holland. 1. SELMA DE VRIES, b. 29 March 1925, Borgerhout, Belgium; d. 09 July 1943, Sobibor death camp, Poland - Holocaust victim. DAVID HARTOG was born 29 October 1905 in Amsterdam, Holland, and died 31 March 1944 in Central Europe, Municipality unknown - Holocaust victim. He married ROZETTA FRANK 29 November 1928 in Amsterdam, Holland, daughter of SAMUEL FRANK and SARA CARDOZO. She was born 06 November 1905 in Amsterdam, Holland, and died 02 April 1943 in Sobibor death camp, Poland - Holocaust victim. Parents of Rozetta Frank were SAMUEL FRANK He married SARA LOPES CARDOZO 29 December 1904 in Amsterdam, Holland. She was born 29 March 1880 in Amsterdam, Holland, and died 07 July 1944 in Auschwitz concentration camp - Holocaust victim. Resided, Februay 1941: Eerste Boerhaavestraat 22 II, Amsterdam, Holland. 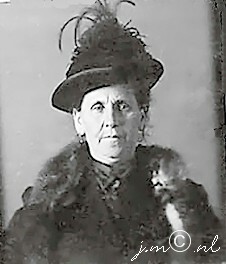 The widow Sara Frank-Lopes Cardozo served as a witness at the wedding of her nephew Aron Lopes Cardozo to Koosje de la Fuente. 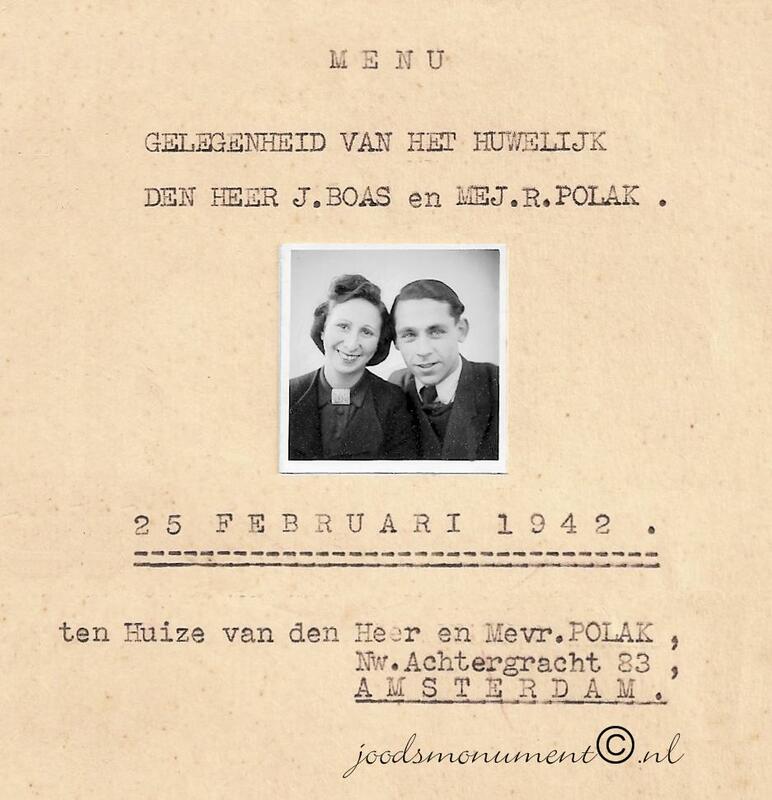 The marriage was performed at Westerbork transit camp on 17 September 1943. she signed the marriage certificate. Resided with family, February 1941: Saffierstraat 77 II, Amsterdam, Holland. 1. MARIANNE HARTOG, b. 27 May 1934, Amsterdam, Holland; d. 02 April 1943, Sobibor death camp, Poland - Holocaust victim. JUDITH BONT was born 24 September 1909 in Amsterdam, Holland. She married PHILIP DE GROOT 22 June 1932 in Amsterdam, Holland, son of MARCUS DE GROOT and KLARA MONNIKENDAM. He was born 13 July 1909 in Amsterdam, Holland, and died 30 July 1945 in Enschede, Twents, Overijssel, Twente, Holland. Immigrated to Israel after the war. Parents of Philip de Groot were MARCUS DE GROOT born 27 December 1877 in Amsterdam, Holland, and died 02 July 1943 in Sobibor death camp, Poland - Holocaust victim. He married KLARA MONNIKENDAM 09 March 1904 in Amsterdam, Holland. She was born 18 September 1877 in Amsterdam, Holland, and died 02 July 1943 in Sobibor death camp, Poland - Holocaust victim. Resided with family, February 1941: Borssenburgstraat 27 I, Amsterdam, Holland. From left to right: Menachem de Groot, sitting on the lap of Philip de Bont, Marcus de Groot, unknown girl, Mietje Bont-Hartog, baby Klara de Groot being held by Judith de Groot-Bont and Mirjam de Groot. JACOB HARTOG BONT was born 20 January 1913 in Amsterdam, Holland, and died 30 April 1945 in Ebensee concentration camp, Ebensee, Austria - Holocaust victim. He married ANNELIESE ROSE DE LEVIE 19 May 1938 in Amsterdam, Holland, daughter of SIEGFRIED DE LEVIE and JEANNETTE SIMON. She was born 26 September 1918 in Berlin, Germany, and died 06 March 1944 in Auschwitz concentration camp, Poland - Holocaust victim. Parents of Anneliese Rose de Levie were SIEGFRIED DE LEVIE born 06 June 1886 in Groningen, Holland, and died 12 June 1936 in Amsterdam, Holland. He married JEANNETTE SIMON 18 February 1916 in Berlin, Germany. She was born 25 September 1895 in Berlin, Germany, and died 11 June 1943 in Sobibor death camp, Poland - Holocaust victim. Resided: Nieuwe Achtergracht 49 II, Amsterdam, Holland. Resided February 1941: Smitstraat 26 huis, Amsterdam, Holland. Jacob Hartog Bont was married to Anneliese Rose de Levie. He was a baker's assistant. Their daughter Miriam was born in Westerbork transit camp on 25 September 1943 and later murdered at Auschwitz on 06 March 1944. Miriam was only 5 weeks old when she died. Wedding invitation of Jacob Hartog Bont and Anneliese Rose de Levie. The Ebensee concentration camp was established by the SS to build tunnels for armaments storage near the town of Ebensee, Austria in 1943. It was part of the Mauthausen network. 1. MIRIAM BONT, b. 25 September 1943, Westerbork transit camp, Drenthe, Holland; d. 06 March 1944, Auschwitz concentration camp, Poland - Holocaust victim. MEIJER BONT was born 21 May 1915 in Amsterdam, Holland. 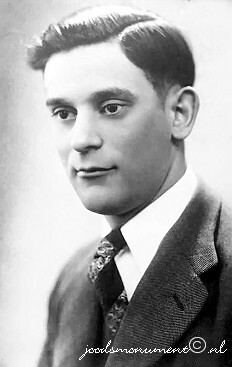 He married SARA DWORA ROZENBERG. WILLY SALOMON BONT was born 10 March 1926 in Amsterdam, Holland, and died 29 June 2013 in Amstelveen, Holland. He married MARIAN SONS, daughter of LOUIS SONS and REBECCA STAD. Parents of Marian Sons were LOUIS SONS born 06 November 1907 in The Hague, Holland, and died 10 August 1980 in The Hague, Holland. He married REBECCA STAD 23 March 1932 in Dordrecht, Holland. She was born 02 June 1911 in Rotterdam, Holland, and died 04 June 1944 in Auschwitz II–Birkenau concentration camp - Holocaust victim. Resided with family, May 1942: Voorstraat 186, Dordrecht, Holland. LEVIE APPELBOOM was born 05 April 1911 in Amsterdam, Holland, and died 23 March 1995 in Amsterdam, Holland. He married MARGARETHA KOEKOEK 14 October 1936 in Amsterdam, Holland, daughter of RAPHAEL KOEKOEK and HEINTJE SEALTIEL. She was born 16 December 1915 in Amsterdam, Holland, and died 28 January 1990 in Amsterdam, Holland. Parents of Margaretha Koekoek were RAPHAEL KOEKOEK born 09 June 1894 in Amsterdam, Holland, and died 09 April 1943 in Sobibor death camp, Poland - Holocaust victim. He married HEINTJE SEALTIEL 11 August 1915 in Amsterdam, Holland. She was born 01 July 1890 in Amsterdam, Holland, and died 09 April 1943 in Sobibor death camp, Poland - Holocaust victim. Resided with family, February 1941: Valkenburgerstraat 141 I, Amsterdam, Holland. Raphael Koekoek and Heintje Sealtiel had seven children. One child died before the war. Two children survived the war. One child was married and resided at another address. This child survived by going into hiding. Belonging to: Raphael Koekoek hia family, Amsterdam, Holland. ANDRIES APPELBOOM was born 11 April 1913 in Amsterdam, Holland, and died 30 September 1942 in Auschwitz concentration camp, Oswiecim Poland – Holocaust victim. He married RIKA BLOM 27 March 1935 in Amsterdam, Holland, daughter of SAMUEL BLOM and SOPHIA BRILLEMAN. She was born 17 June 1916 in Amsterdam, Holland, and died 18 July 1942 in Auschwitz concentration camp, Oswiecim Poland – Holocaust victim. Parents of Rika Blom were SAMUEL BLOM born 20 May 1893 in Amsterdam, Holland, and died 14 May 1943 in Sobibor death camp, Poland - Holocaust victim. He married SOPHIA BRILLEMAN 10 December 1915 in Amsterdam, Holland. She was born 27 April 1893 in Amsterdam, Holland, and died 21 September 1942 in Auschwitz concentration camp, Oswiecim Poland – Holocaust victim. Resided with family, February 1941: Rapenburg 79 I, Amsterdam, Holland. 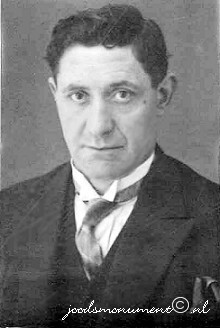 Samuel Blom was a son of Salomon Blom and Hendrika Kosman, who had a family with ten children: Samuel himself, Hartog, Elisabeth, Duifje, Nathan, Rachel, Israel, Barend, Machiel and Greta, who survived the Holocaust. Sophia Brillman was a daughter of Hartog Brilleman and Betje Samson. 1. HELENA APPELBOOM, b. 19 September 1938, Amsterdam, Holland; d. 18 July 1942, Auschwitz concentration camp, Oswiecim Poland – Holocaust victim. Front living room: floor cloth mat lace curtain (3), drape (6), mat (2), table armchair (2), chair (4), sideboard with glassware and ceramics, small table, loudspeaker, flower table, wall plate (3), hanging lamp, Rear bedroom: floor cloth, mat (2), lace curtain (2), drape (2), bed with bedding, cot, hanging lamp, chair (2), flower table, cupboard with ladies' and gents' clothing, kitchen: floor cloth, table, runner mat (3), adjustable hanging lamp, gas ring, kitchen: utensils, kitchenware, cupboard with cleaning articles, lace curtain, curtain, cupboard with stoneware, Corridor: small lamp, mirror, floor cloth, foot mat. ISAAC APPELBOOM was born 07 April 1916 in Amsterdam, Holland, and died 09 July 1943 in Sobibor death camp, Poland - Holocaust victim. He married JACOBA TURK 18 September 1940 in Amsterdam, Holland, daughter of JACOB TURK and FEMMETJE VOGEL. She was born 27 January 1914 in Amsterdam, Holland, and died 11 June 1943 in Sobibor death camp, Poland - Holocaust victim. 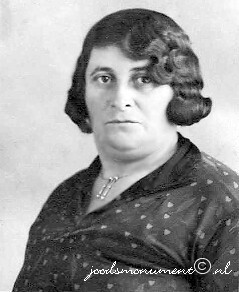 Parents of Jacoba Turk were JACOB TURK born 07 February 1881 in Amsterdam, Holland, and died 04 June 1943 in Sobibor death camp, Poland - Holocaust victim. He married FEMMETJE VOGEL 02 May 1907 in Amsterdam, Holland. She was born 12 July 1884 in Amsterdam, Holland, and died 04 June 1943 in Sobibor death camp, Poland - Holocaust victim. Resided with family, February 1941: Reitzstraat 34 II, Amsterdam, Holland. ELISABETH SANTILHANO was born 20 August 1915 in Amsterdam, Holland, and died 13 March 1943 in Sobibor death camp, Poland - Holocaust victim. She married JACOB MOZES ROOD 27 September 1939 in Amsterdam, Holland, son of JUDA ROOD and MARIANNE FRIEDMANN. He was born 26 February 1919 in Amsterdam, Holland, and died 23 April 1943 in Sobibor death camp, Poland - Holocaust victim. Parents of Jacob Mozes Rood were JUDA ROOD born 08 May 1891 in Maarssen, Utrecht, Holland, and died 22 October 1943 in Auschwitz concentration camp - Holocaust victim. He married MARIANNE FRIEDMANN 10 May 1917 in Amsterdam, Holland. She was born 08 February 1894 in Waalwijk, Noord-Brabant, Holland, and died 22 October 1943 in Auschwitz concentration camp - Holocaust victim. Resided with family, February 1941: Miquelstraat 40 I, Amsterdam, Holland. 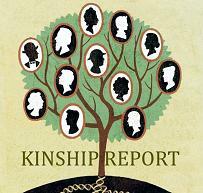 Juda Rood had seven brothers and sisters. One of them died before the war, four of them also died in Auschwitz, one of them in Sobibor and of one of them the fate is unknown. Marianne Friedmann had eight brothers and sisters who all perished in the war: six of them in Sobibor, one in Auschwitz and one in Middle Europe. 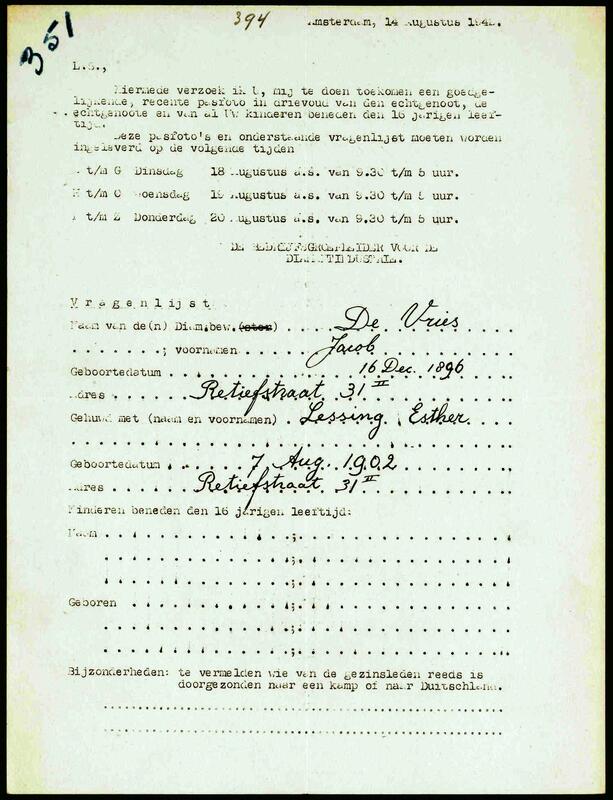 Divorced: 21 July 1942, Jacob Mozes Rood. Divorced: 21 July 1942, Elisabeth Santilhano. 1. BETJE ROOD, b. 20 July 1940, Amsterdam, Holland; d. 13 March 1943, Sobibor death camp, Poland - Holocaust victim. MARCUS DE HAAN was born 05 July 1909 in Rotterdam, Holland, and died 31 October 1943 in Schoppinitz, Katowice, Poland - Holocaust victim. He married HENRIETTE NAARDEN 29 November 1933 in Rotterdam, Holland, daughter of MARCUS NAARDEN and ABIGAEL DRUIJF. She was born 28 March 1913 in Rotterdam, Holland, and died 05 October 1942 in Auschwitz concentration camp - Holocaust victim. Parents of Henriette Naarden were MARCUS NAARDEN born 20 November 1885 in Amsterdam, Holland, and died 26 October 1942 in Auschwitz concentration camp - Holocaust victim. He married ABIGAEL DRUIJF 06 June 1906 in Amsterdam, Holland. She was born 29 October 1885 in Amsterdam, Holland, and died 26 October 1942 in Auschwitz concentration camp - Holocaust victim. Resided with family, February 1941: Valkenburgerstraat 77 II, Amsterdam, Holland. 1. KITTY DE HAAN, b. 09 February 1935, Rotterdam, Holland; d. 26 October 1942, Auschwitz concentration camp - Holocaust victim. 2. MOZES DE HAAN, b. 22 January 1939, Rotterdam, Holland; d. 05 October 1942, Auschwitz concentration camp - Holocaust victim. JOSEPH HARTOG was born 26 December 1909 in Amsterdam, Holland, and died 01 December 1943 in Auschwitz concentration camp - Holocaust victim. He married ANNA SWALEF 20 April 1932 in Amsterdam, Holland, daughter of SALOMON SWALEF and KAATJE ROOZELAAR. She was born 02 November 1911 in Amsterdam, Holland, and died 17 September 1943 in Auschwitz concentration camp - Holocaust victim. 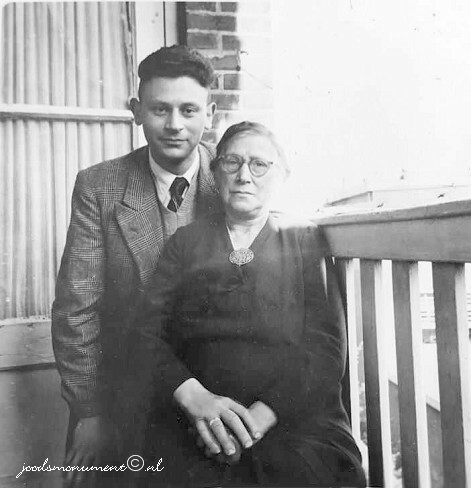 Parents of Anna Swalef were SALOMON SWALEF born 29 March 1883 in Amsterdam, Holland, and died 31 January 1945 in Oranienburg concentration camp, Brandenburg, Germany - Holocaust victim. He married KAATJE ROOZELAAR 29 June 1905 in Amsterdam, Holland. She was born 27 August 1883 in Amsterdam, Holland, and died 08 September 1933 in Amsterdam, Holland. Resided with wife, February 1941: Linnaeusstraat 102 huis, Amsterdam, Holland. Salomon Swalef was a son of Isaac Swalef and Bloeme Tak. He married in Amsterdam on 29 June 1905 to Kaatje Roozelaar, daughter of Mozes Roozelaar and Anna van Duijn. The couple had two daughters: Bloeme and Anna. 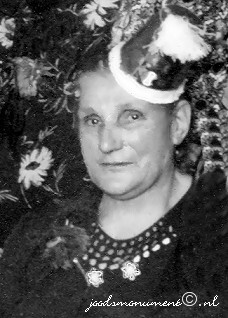 His wife Kaatje passed away on 8 September 1933 and Salomon Swalef remarried on 7 June 1934 in Amsterdam the widow of Maurits Reindorp, Leentje Noort, daughter of Mozes Noort and Rachel Barzilaij. Leentje Noort has survived the Holocaust. Resided with family, February 1941: Eemsstraat 20 II, Amsterdam, Holland. The Jokos files reveal that a claim was lodged for compensation for valuables surrendered to the Lippmann-Rosenthal looting bank (L-claims, numbers 4796/9058, 12512/15783). 1. ISAAC HARTOG, b. 10 October 1933, Amsterdam, Holland; d. 17 September 1943, Auschwitz concentration camp - Holocaust victim. 2. SALOMON HARTOG, b. 14 May 1937, Amsterdam, Holland; d. 17 September 1943, Auschwitz concentration camp - Holocaust victim. EVA VREELAND was born 25 September 1918 in Amsterdam, Holland, and died 10 September 1943 in Auschwitz concentration camp, Oswiecim Poland – Holocaust victim. She married MAURITS GOKKES. 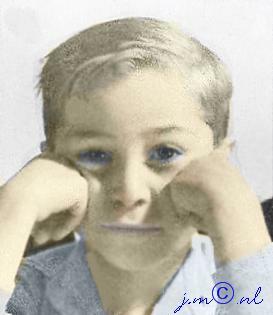 He was born 02 August 1917 in Amsterdam, Holland, and died 31 March 1944 in Warschau (Warsaw) Poland - Holocaust victim. Resided with family February 1941: Swammerdamstraat 40 I, Amsterdam, Holland. 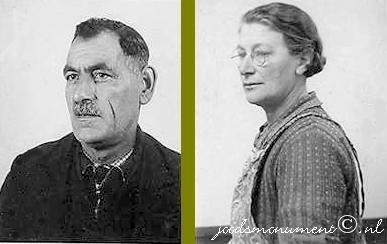 Parents of Maurits Gokkes were Dina Mouwes and JOSEPH GOKKES born 25 May 1888 in Blokzijl, Steenwijkerland, Overijssel, Holland, and died 03 September 1942 in Auschwitz concentration camp, Poland - Holocaust victim. He married (1) DINA MOUWES 20 March 1912 in Amsterdam, Holland. She was born 11 November 1886 in Amsterdam, Holland, and died 30 March 1928 in Amsterdam, Holland. He married (2) BLOEME WITTEBOON 18 September 1929 in Amsterdam, Holland. She was born 10 May 1881 in Amsterdam, Holland, and died 05 February 1943 in Auschwitz concentration camp, Poland - Holocaust victim. 1. MAURITS GOKKES, b. 19 January 1941, Amsterdam, Holland; d. 19 January 1941, Amsterdam, Holland. 2. DINA ROOSJE GOKKES, b. 22 May 1942, Amsterdam, Holland; d. 10 September 1943, Auschwitz concentration camp, Oswiecim Poland – Holocaust victim.